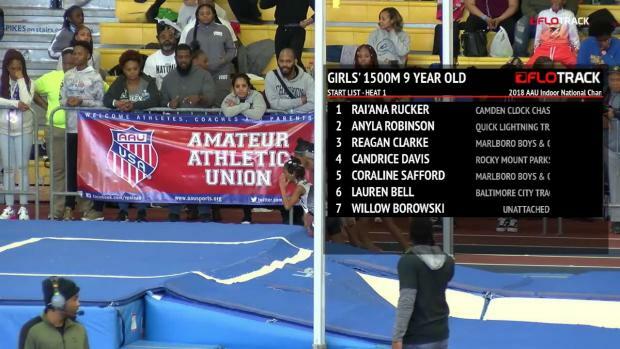 We highlight the top star individual performers in each age group from this past weekend's AAU Indoor Nationals as well as easy links to find results, race videos, and photos for each age group. 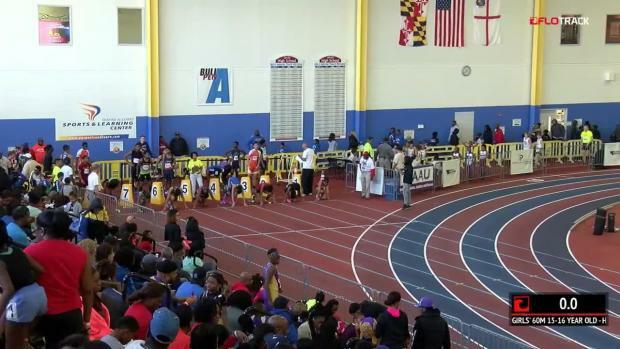 Current entries for the AAU Indoor Nationals, which will be held March 9th thru 11th at the Prince George's County Sportsplex in Landover, Maryland. 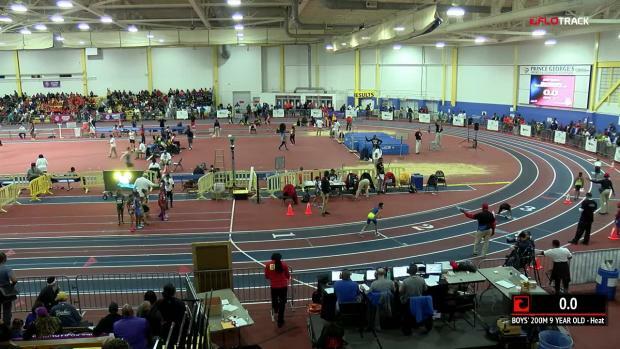 Quick links to find results and all of our coverage from this weekend's AAU Indoor Nationals at the PG County Sportsplex in Landover, Maryland! 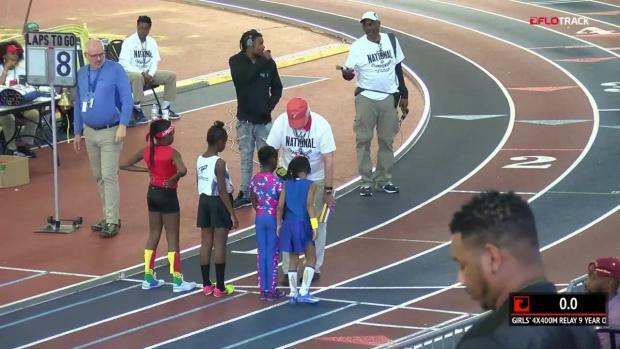 It is the third weekend of the outdoor track and field season with plenty of action going down in the Grand Canyon. 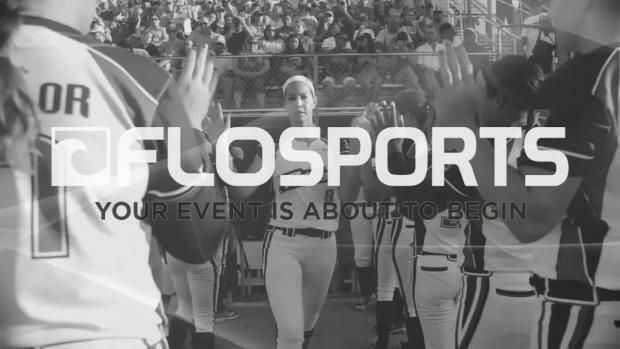 Click here to read more about what's on the table for Arizona. 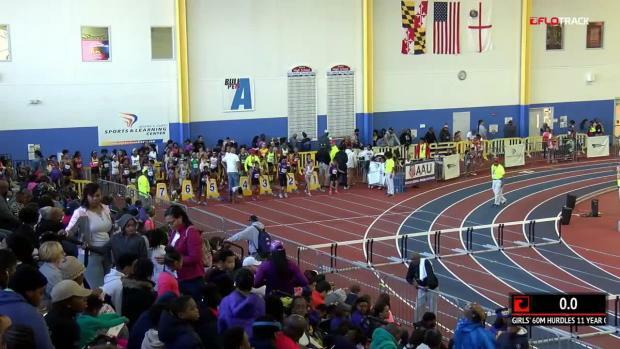 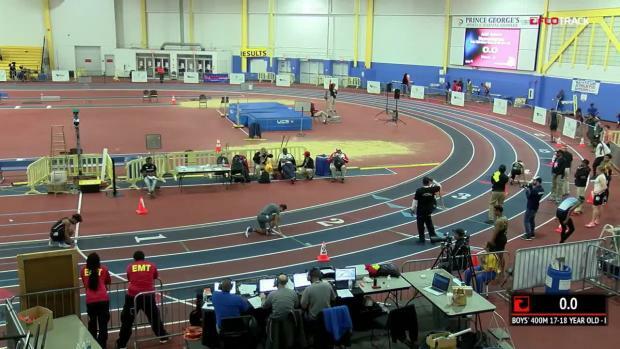 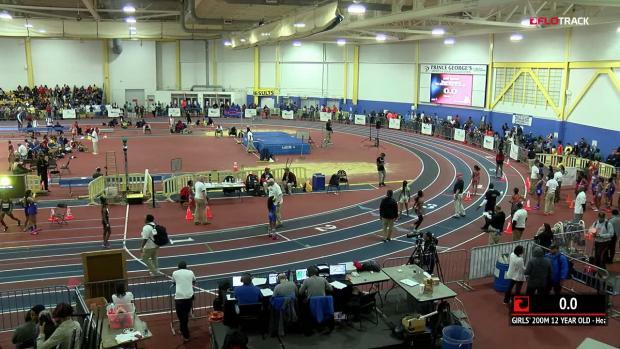 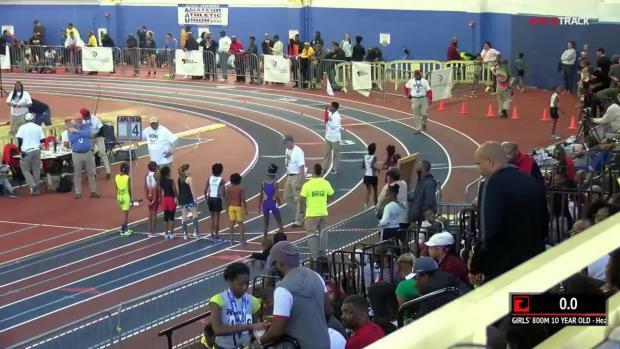 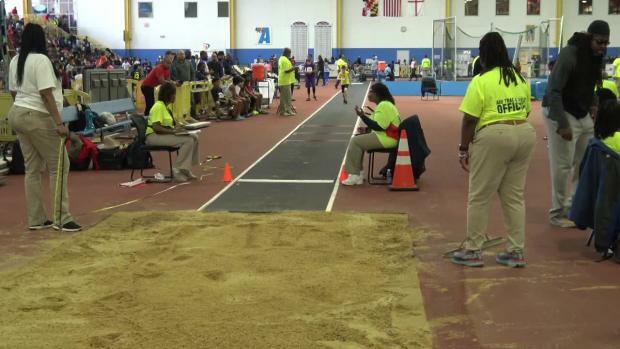 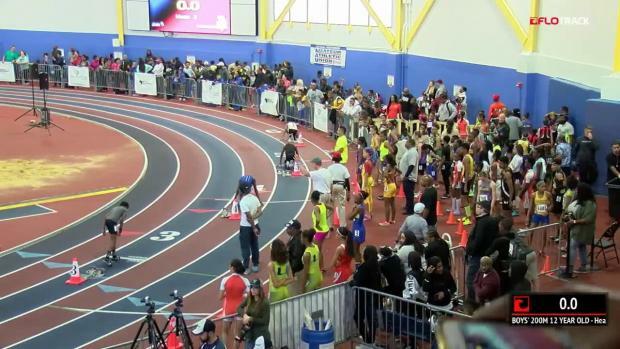 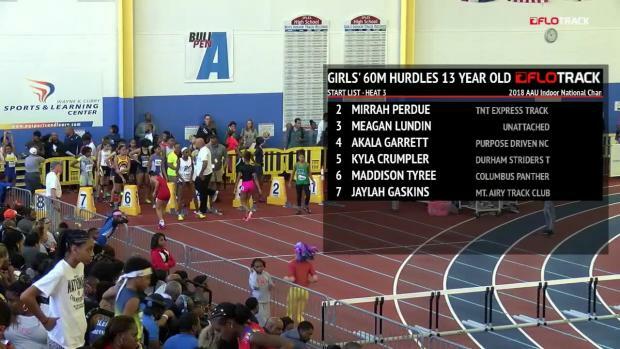 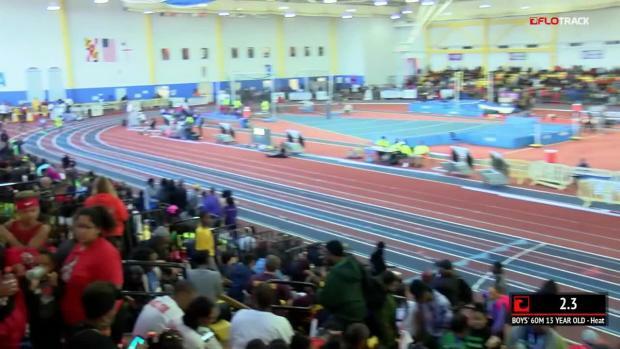 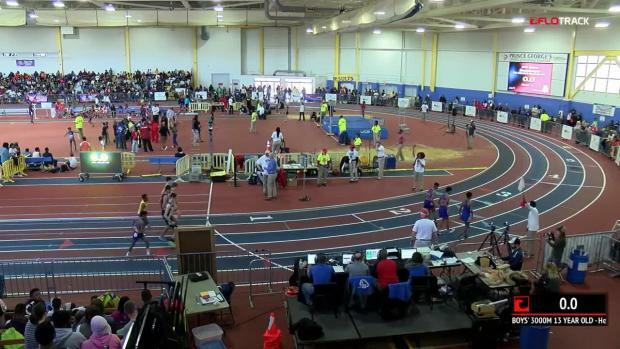 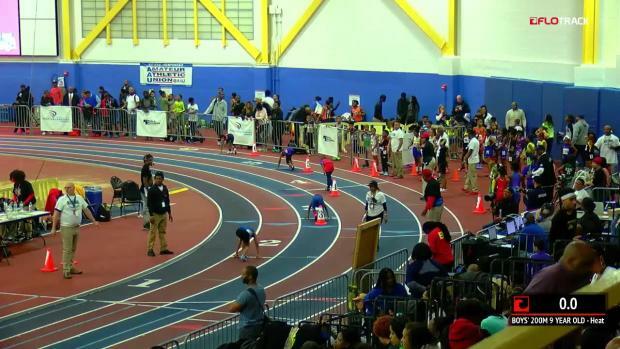 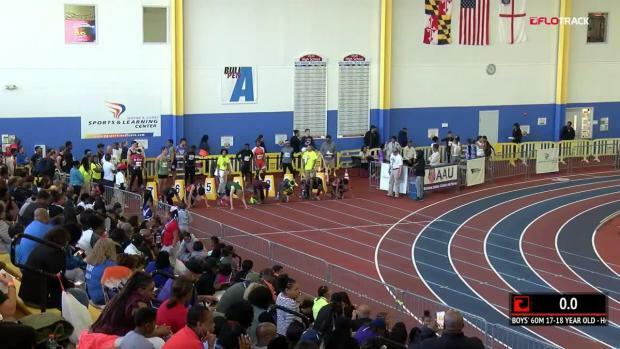 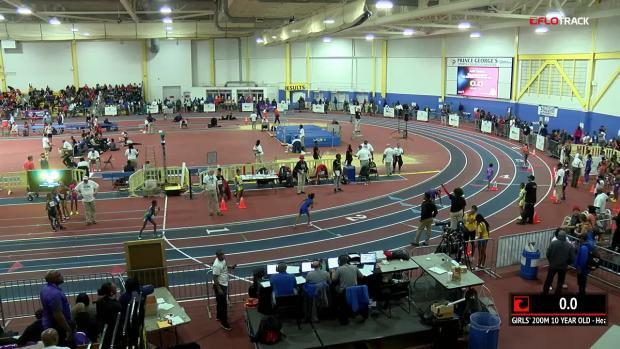 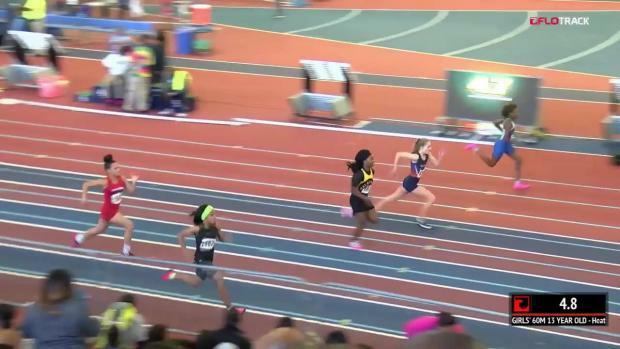 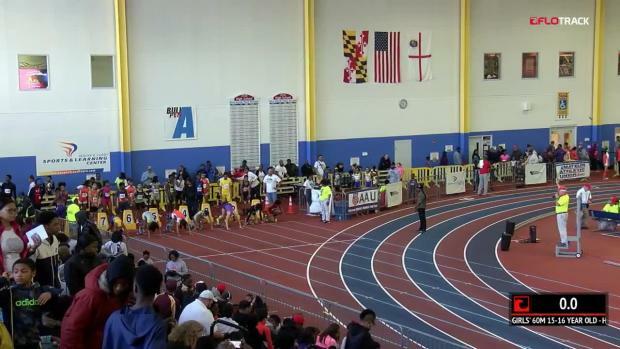 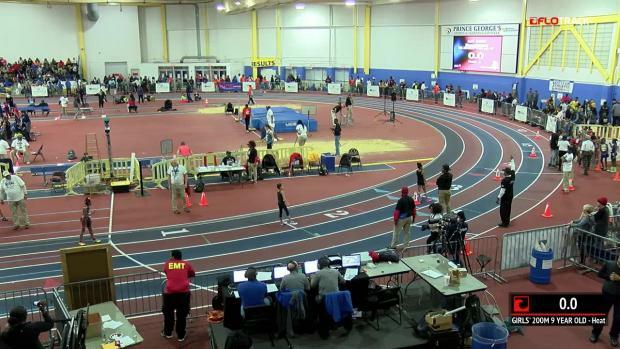 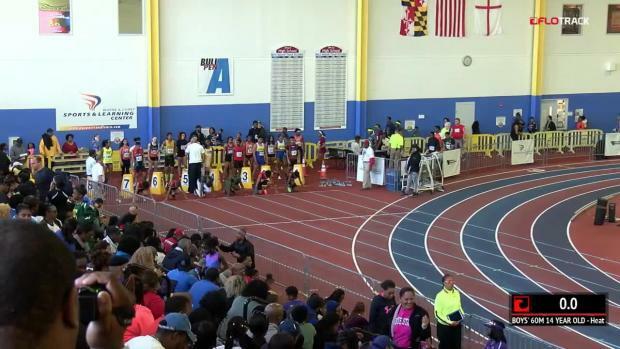 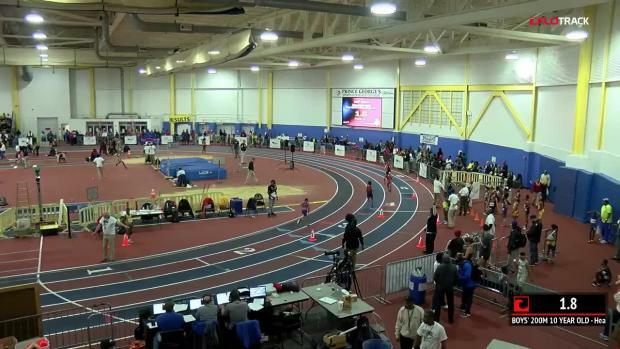 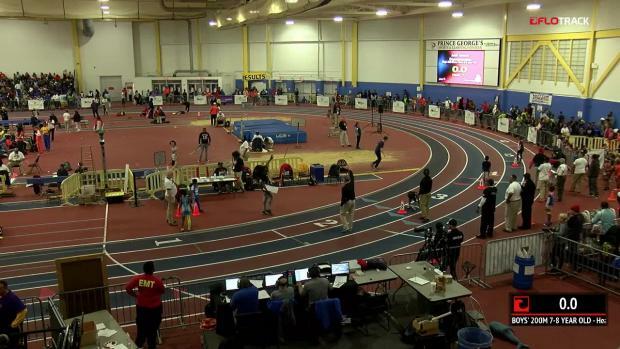 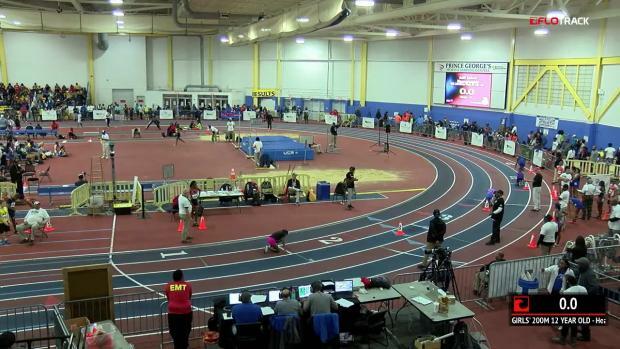 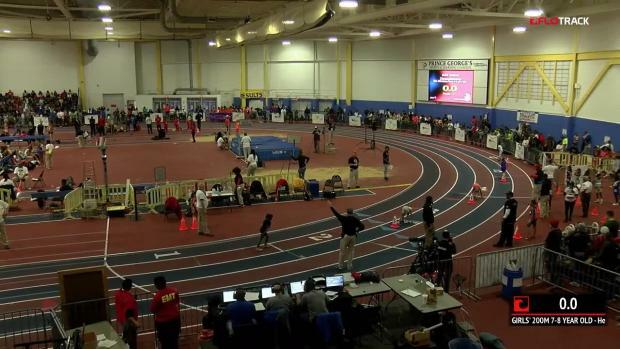 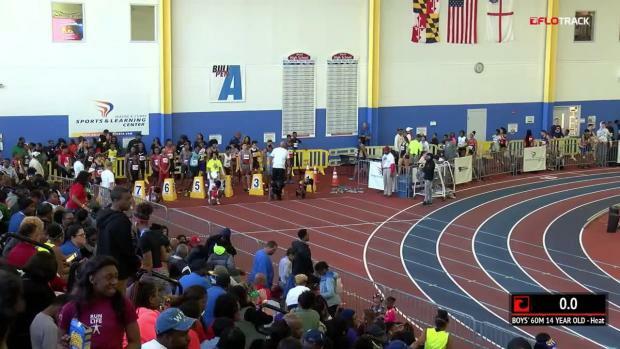 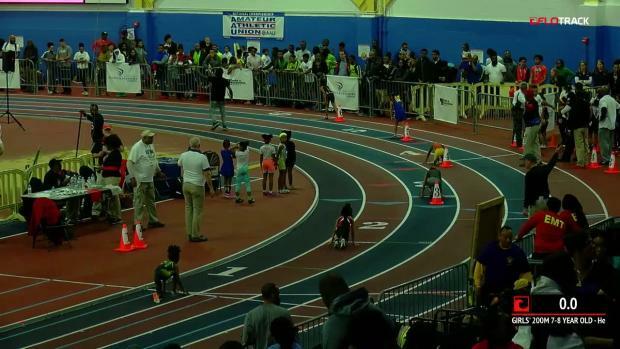 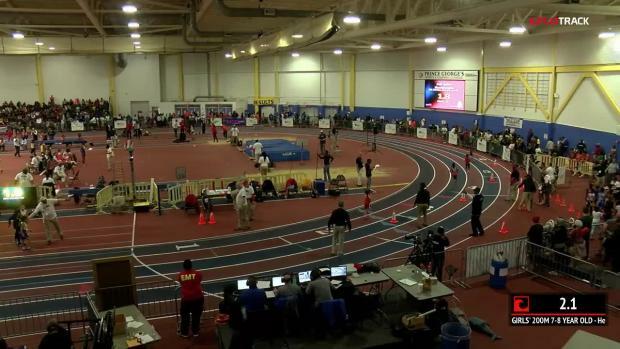 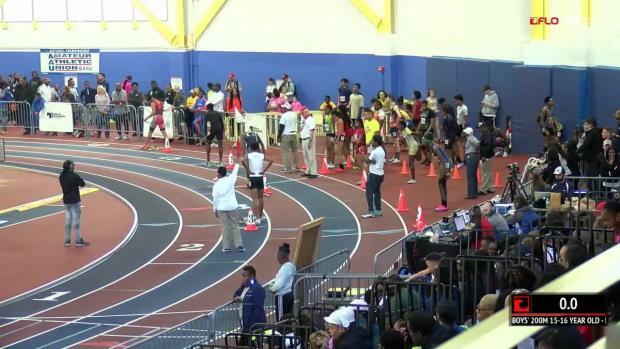 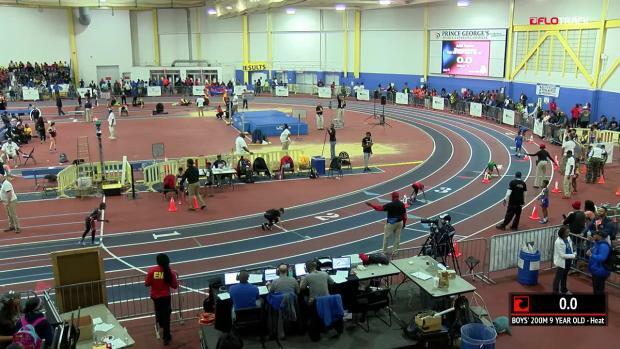 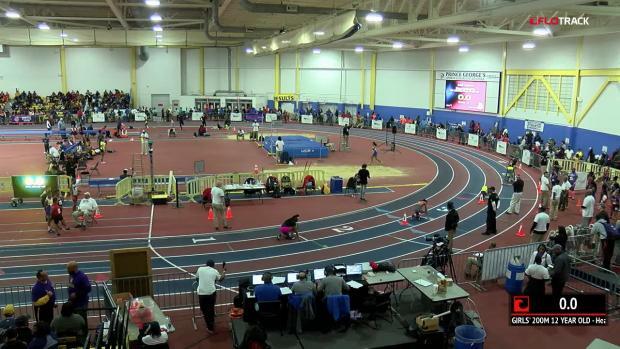 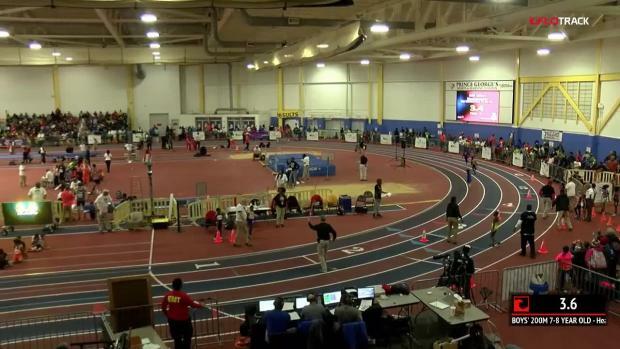 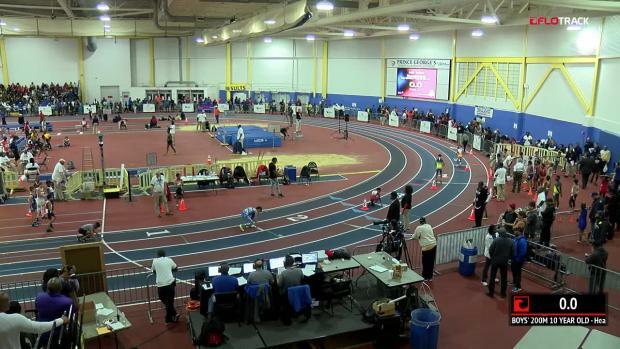 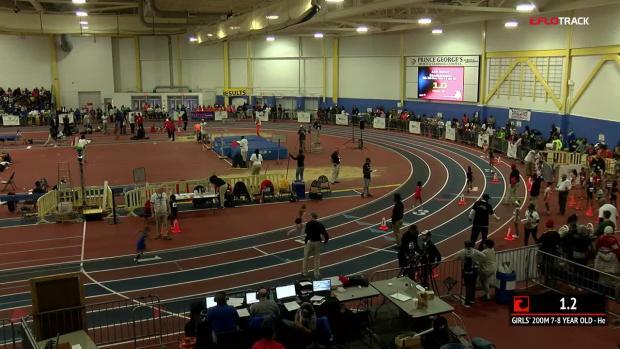 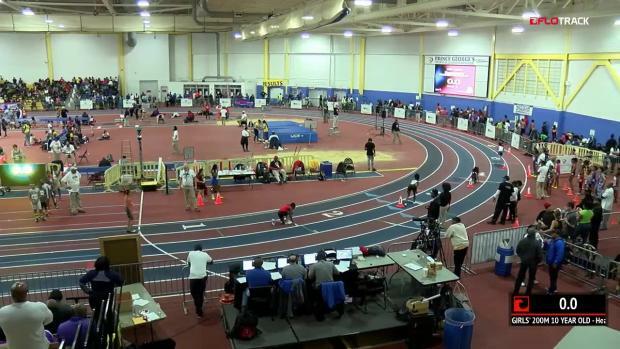 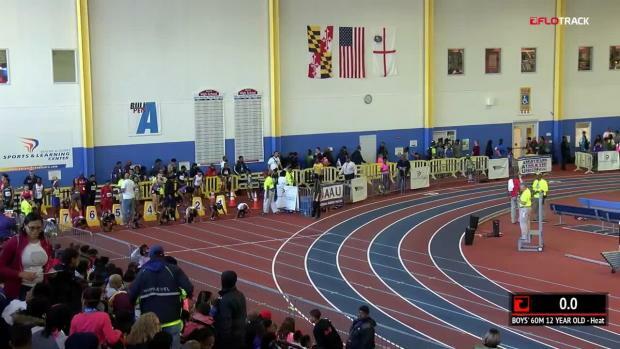 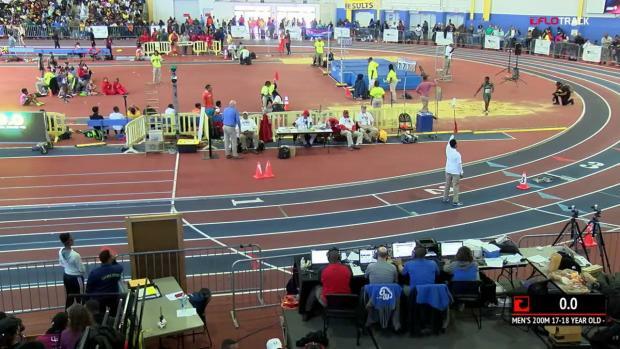 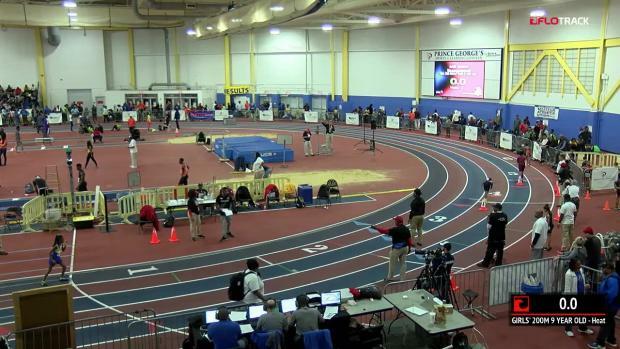 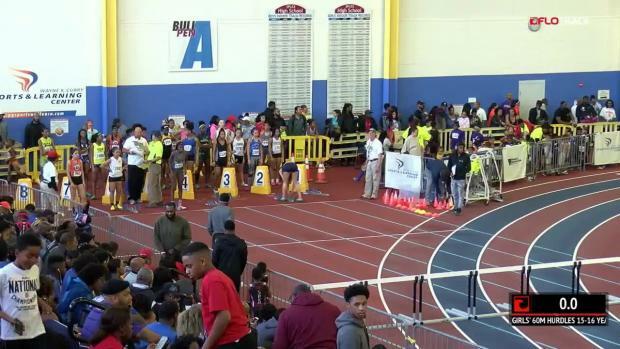 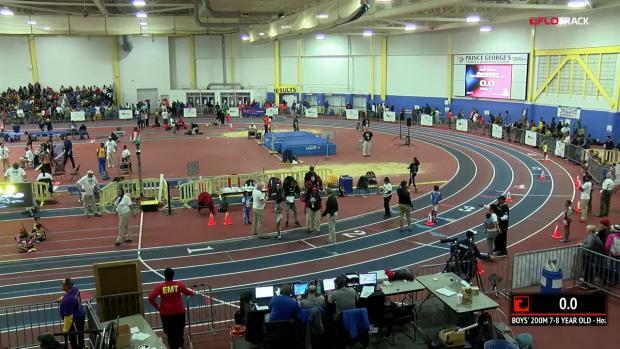 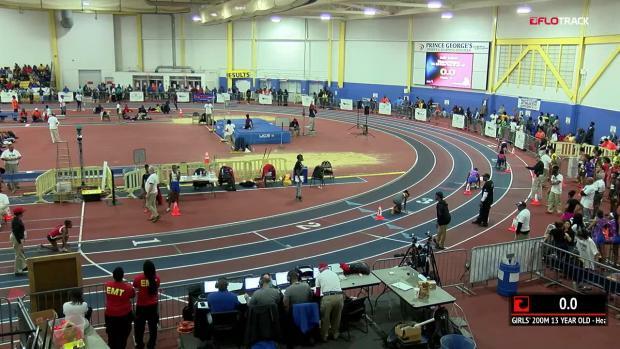 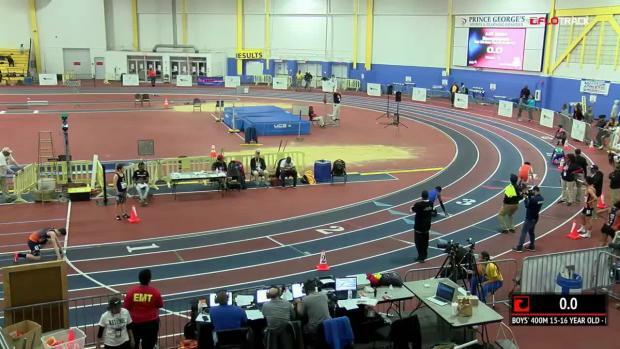 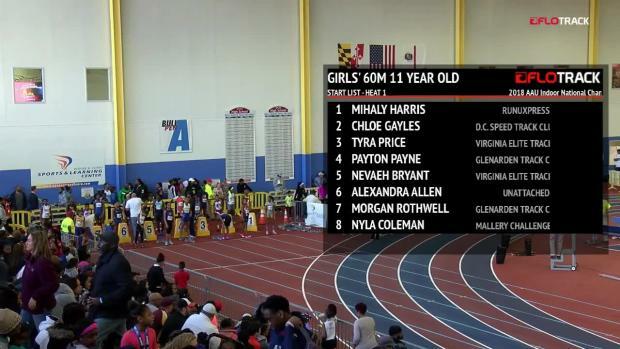 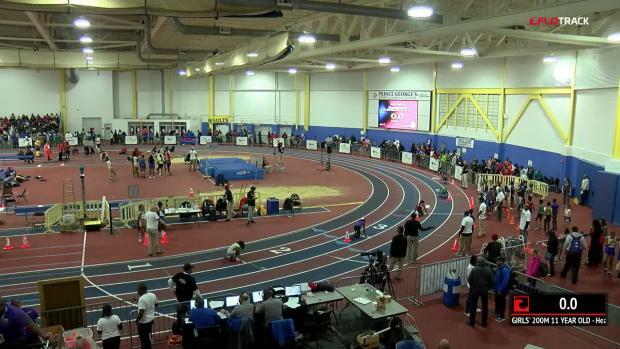 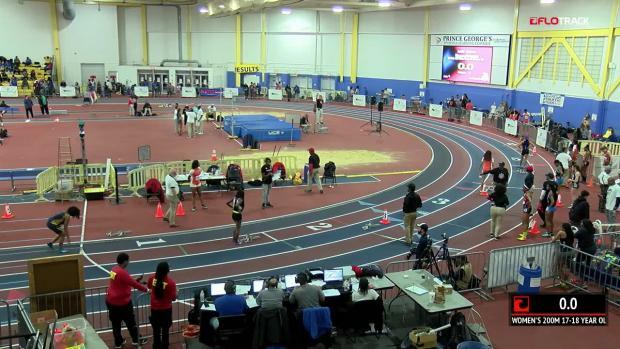 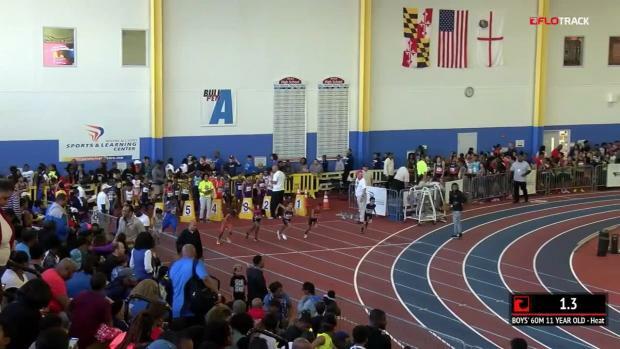 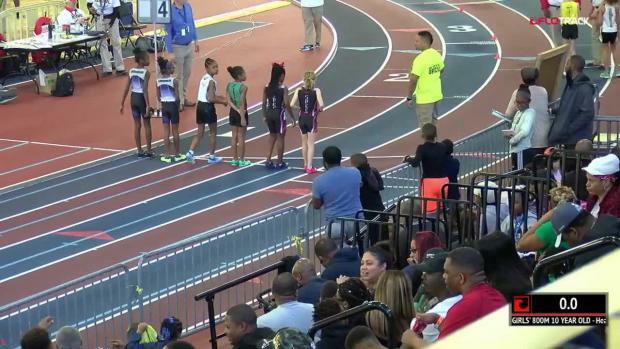 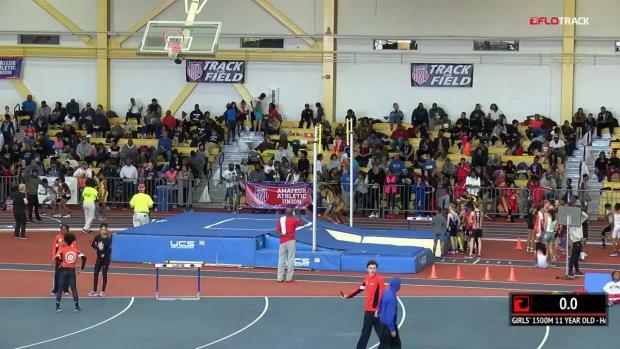 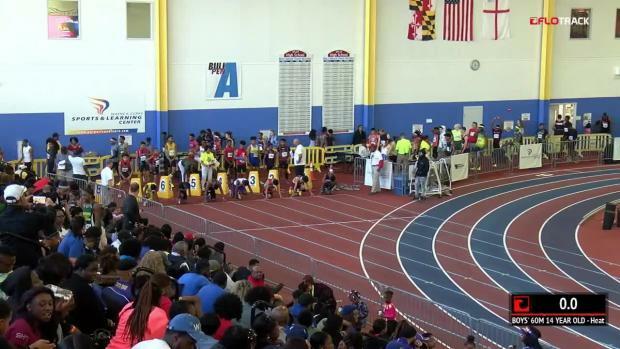 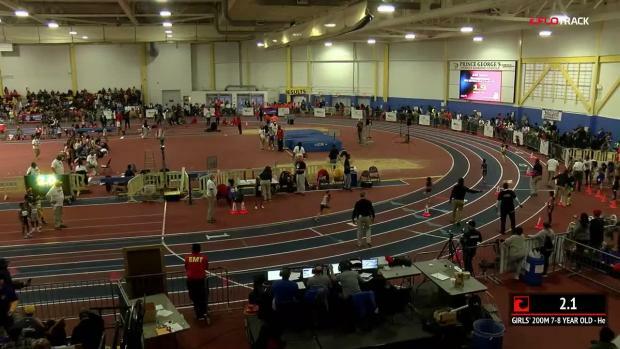 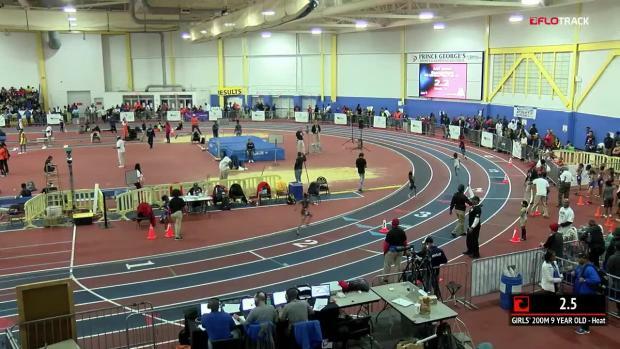 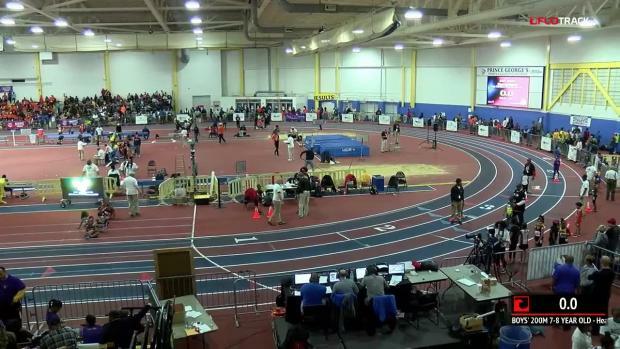 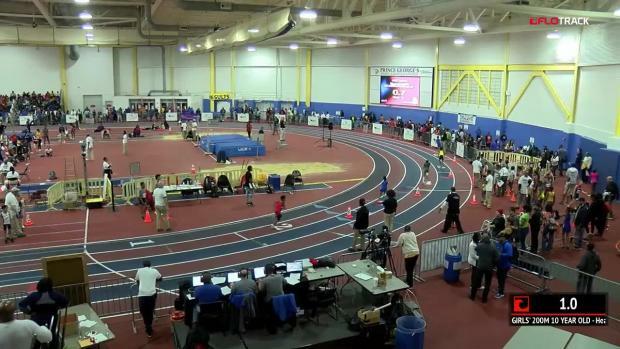 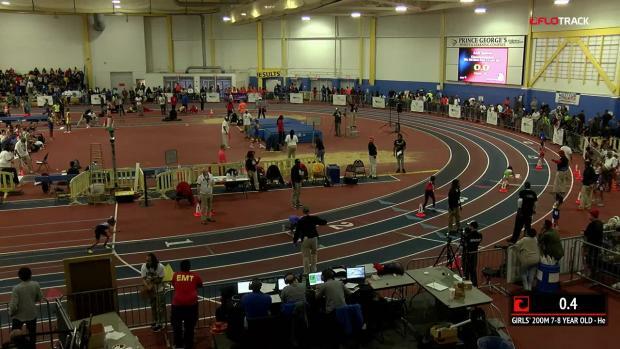 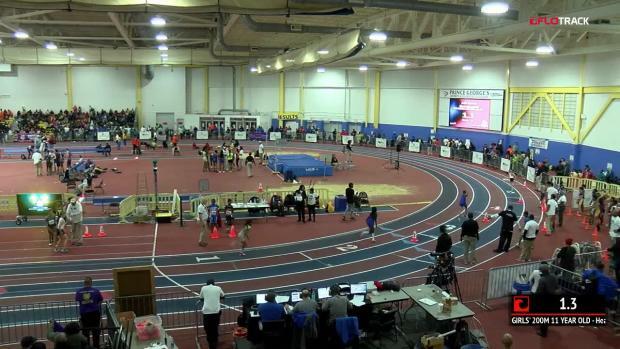 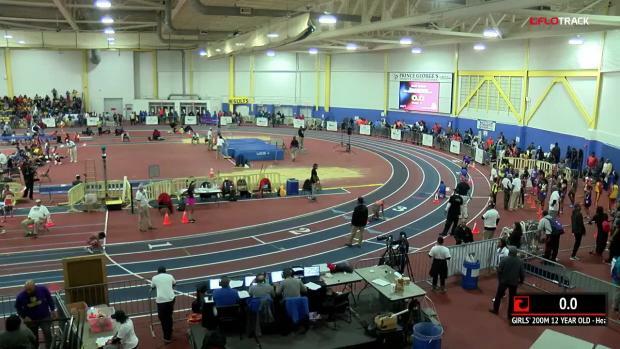 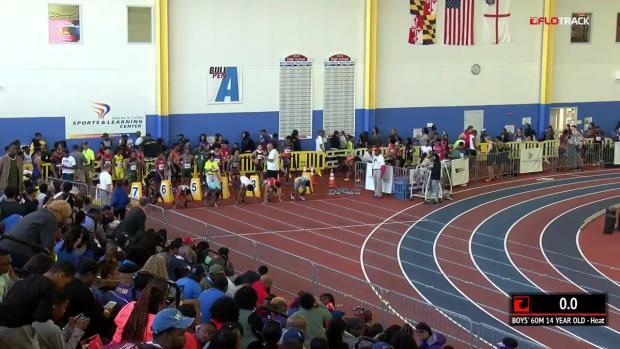 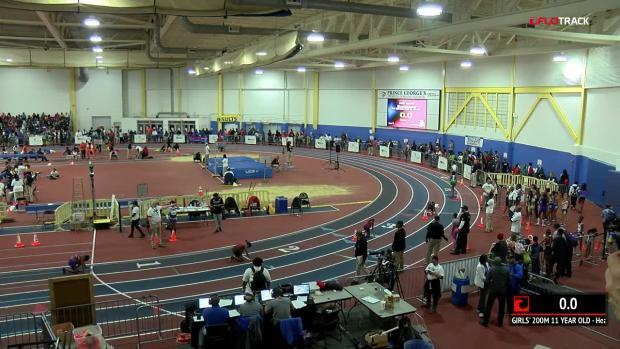 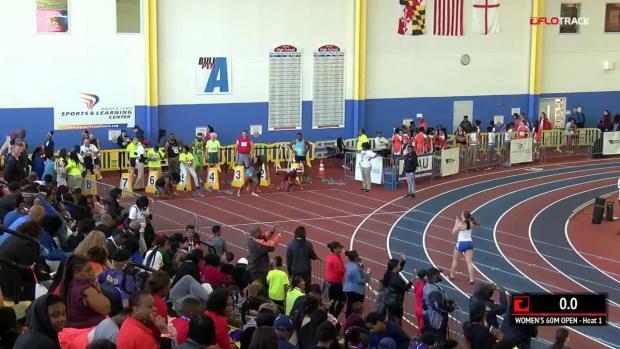 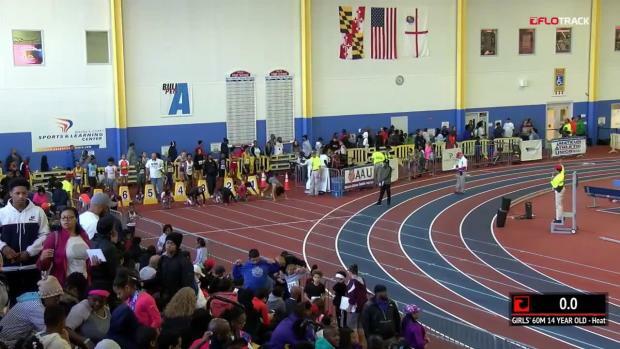 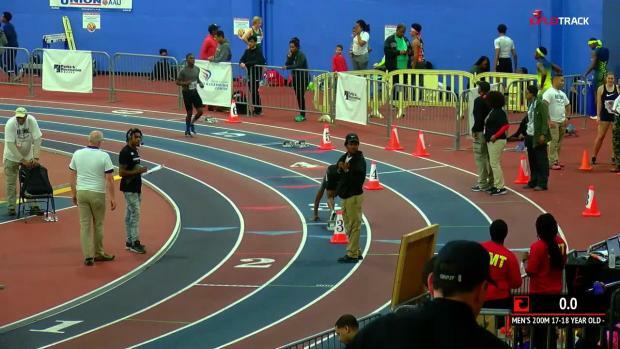 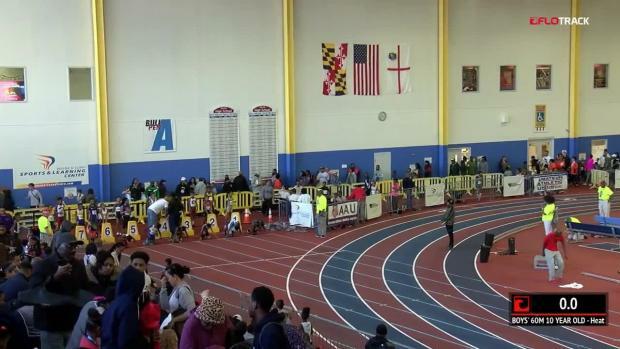 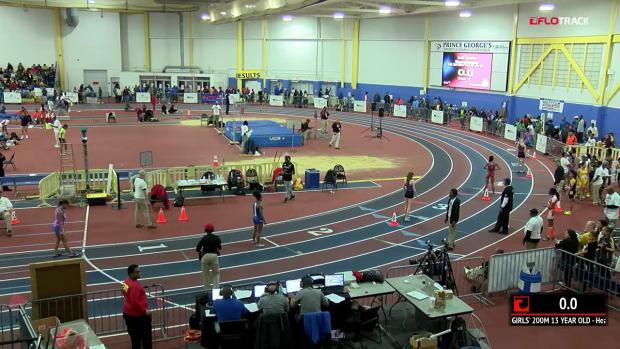 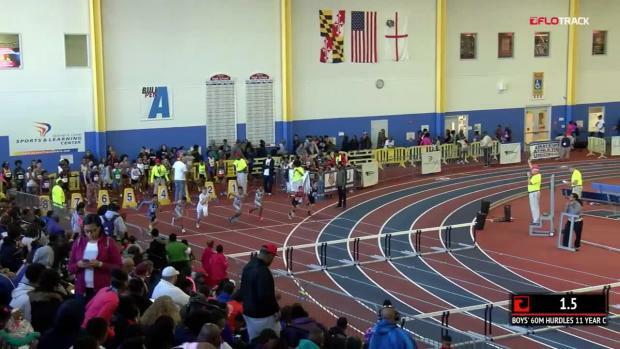 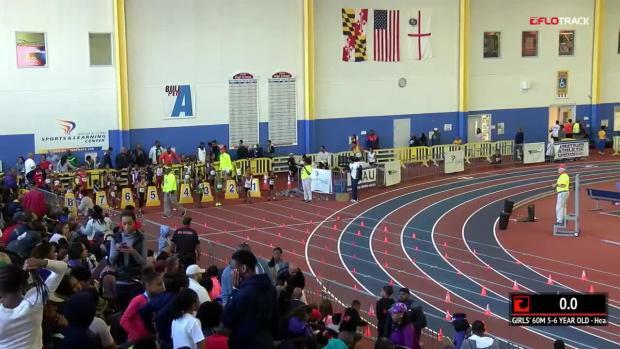 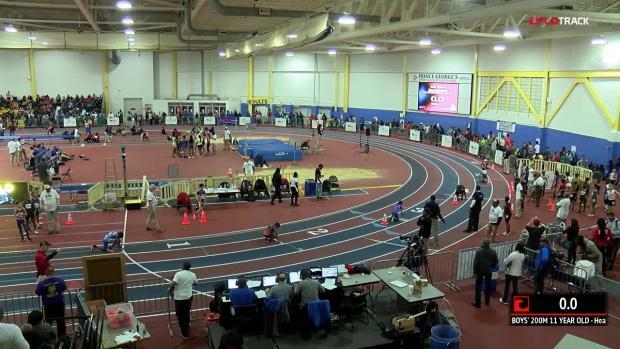 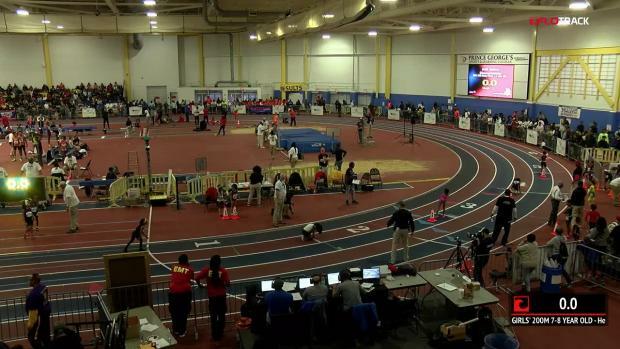 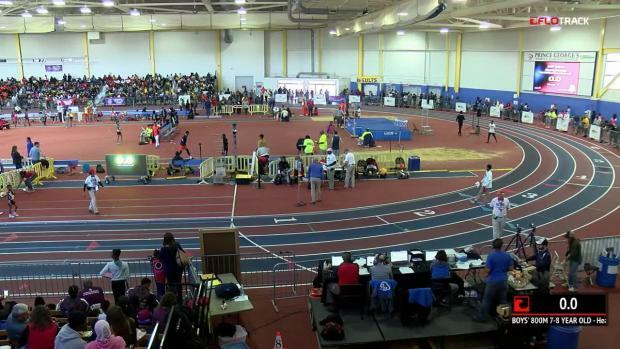 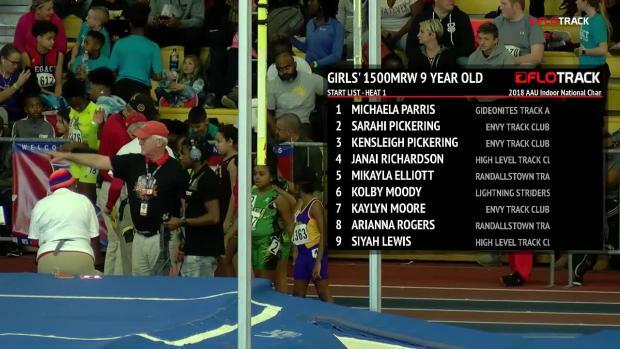 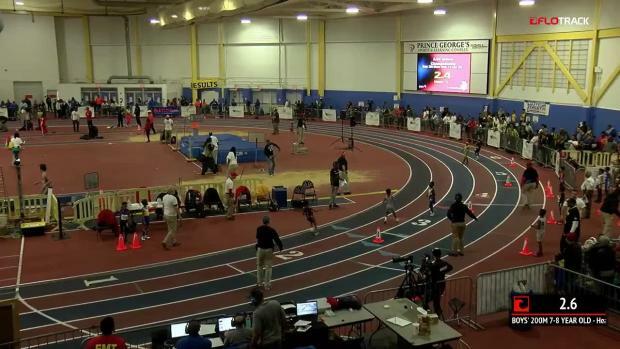 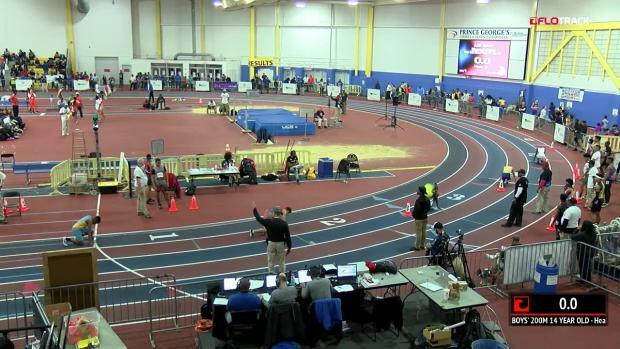 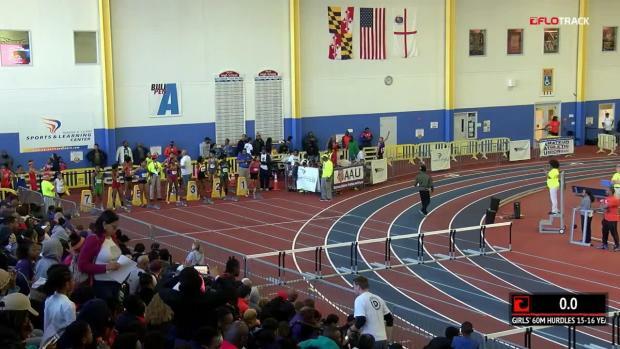 MileSplit Maryland will be on-site with coverage over next three days at the AAU Indoor National Championships being held at the Prince George's County Sportsplex in Landover, Maryland. 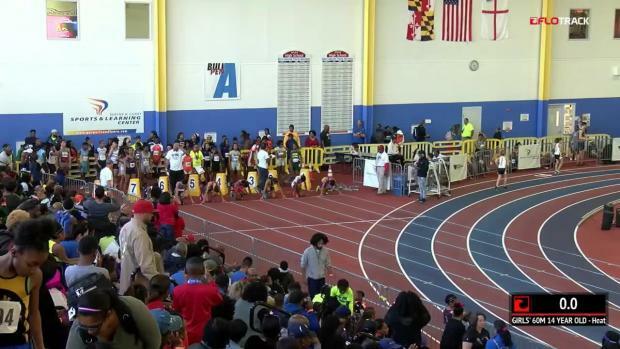 The meet will be LIVE streamed on FloTrack! 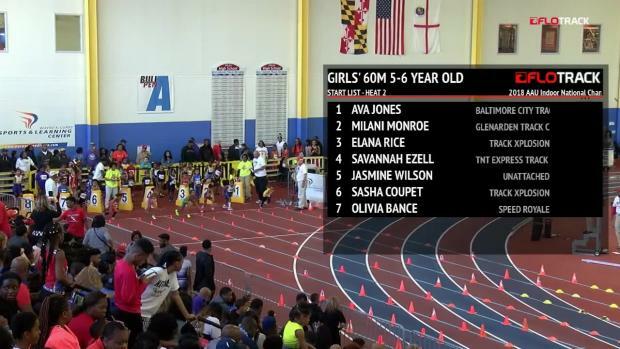 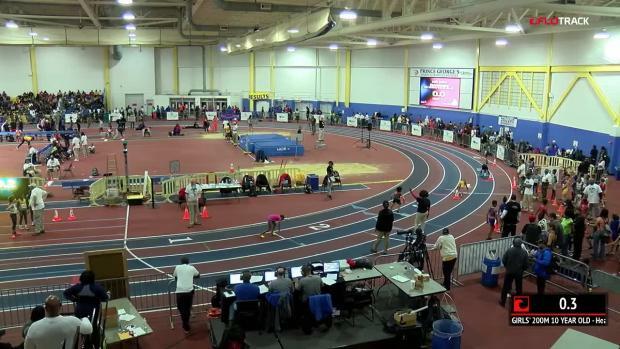 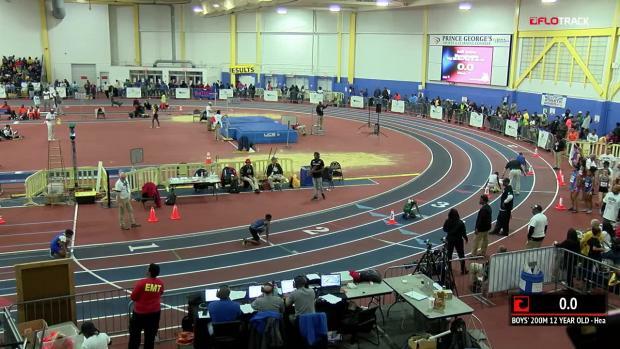 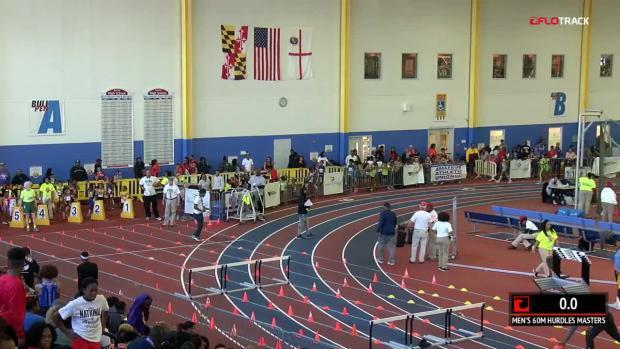 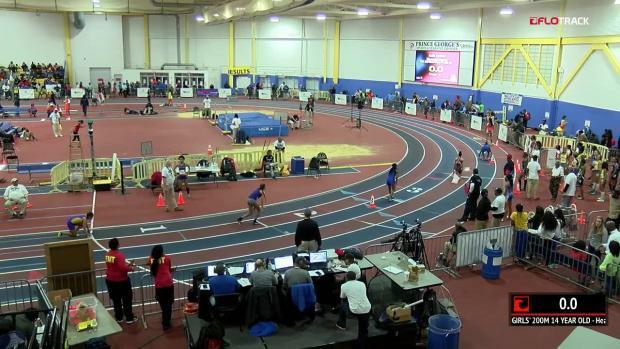 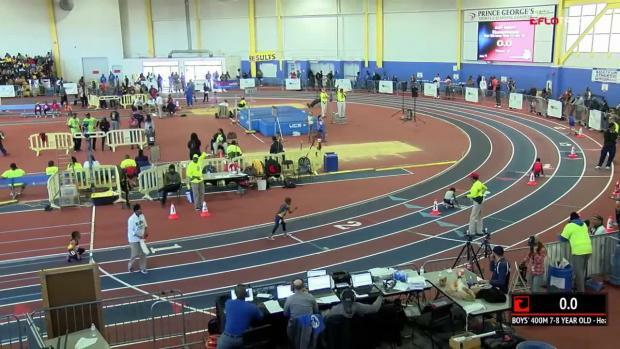 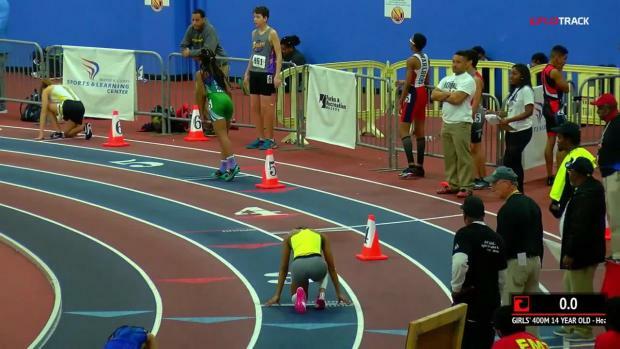 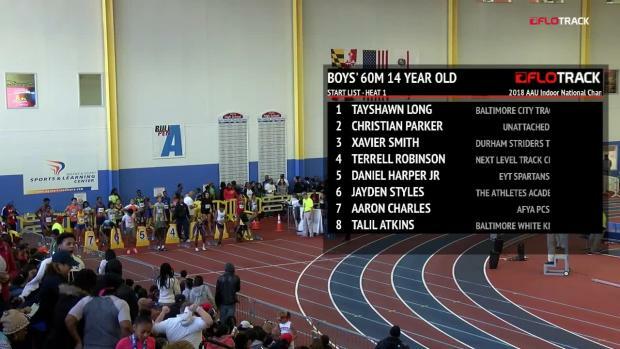 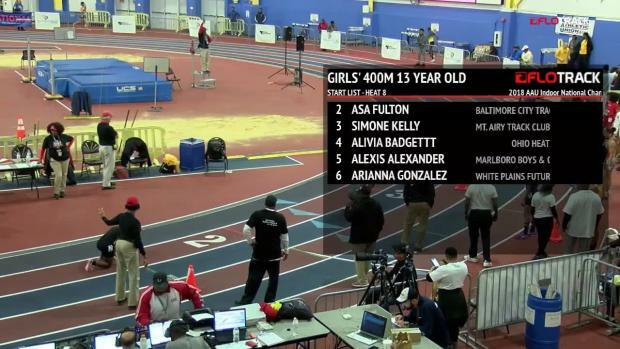 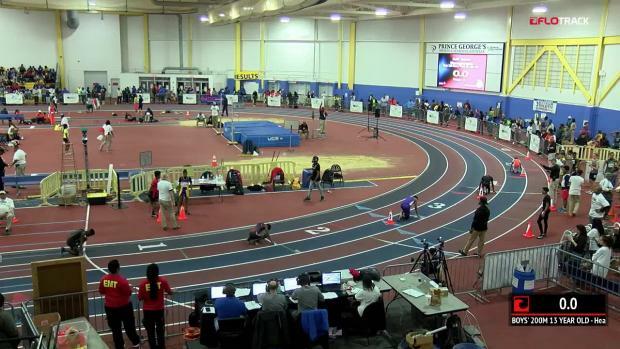 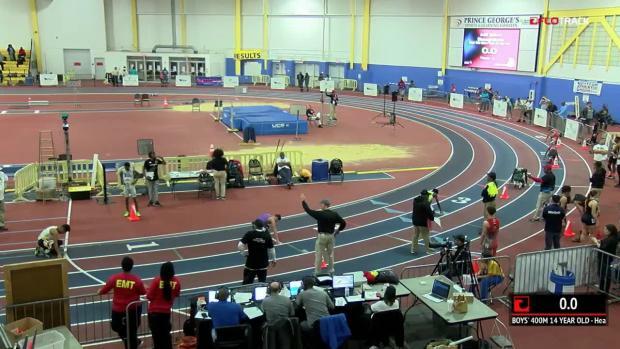 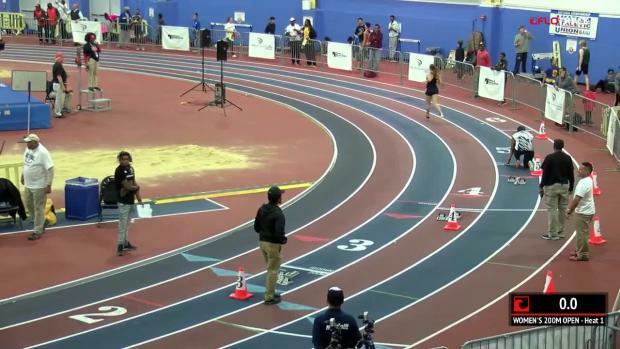 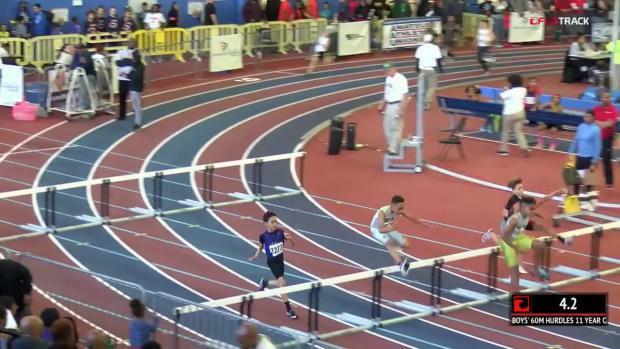 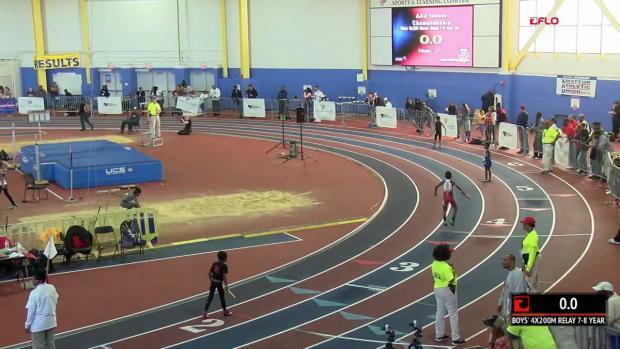 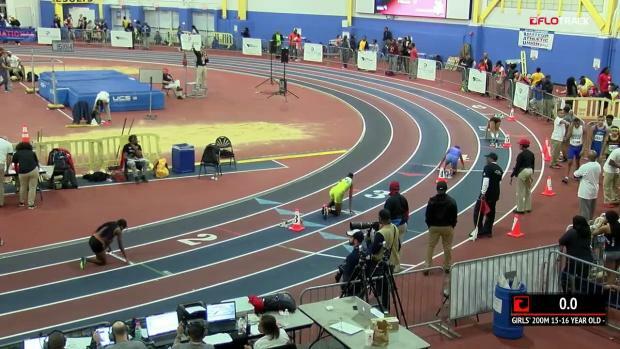 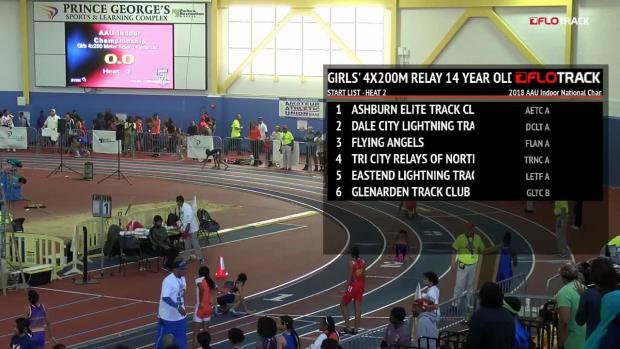 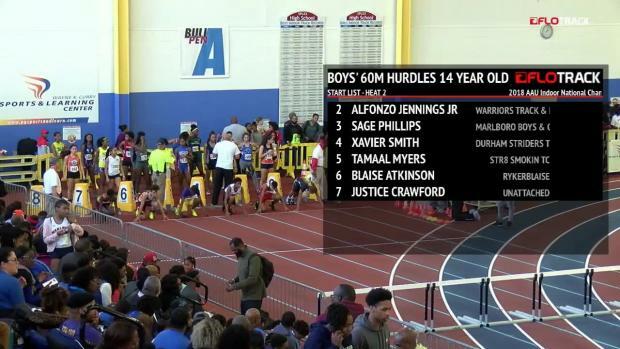 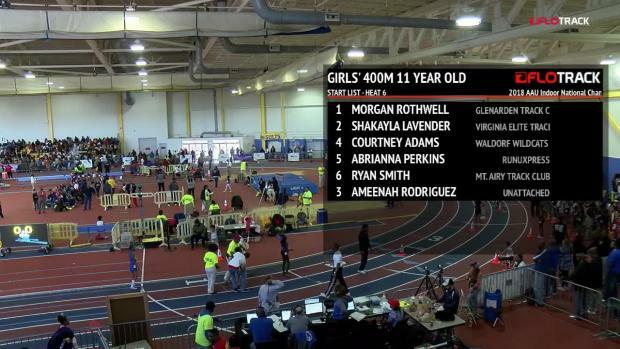 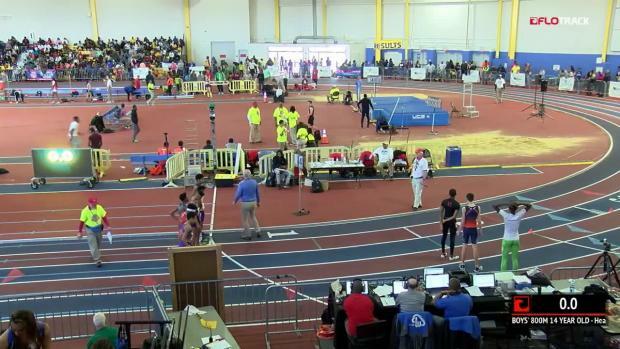 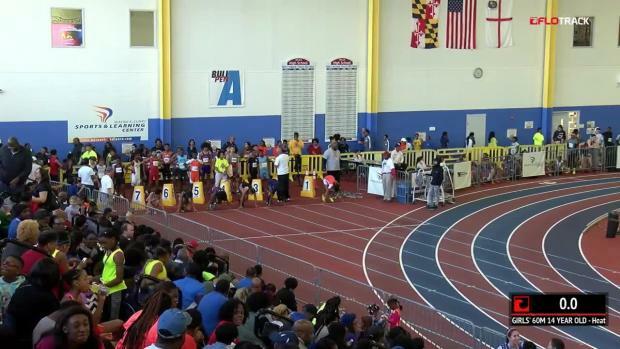 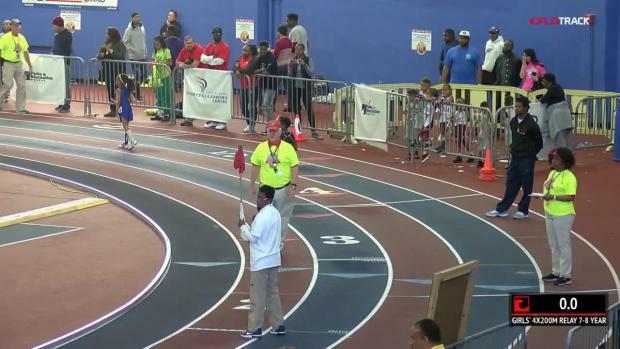 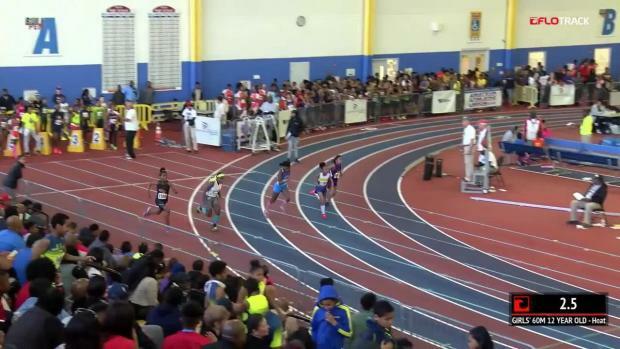 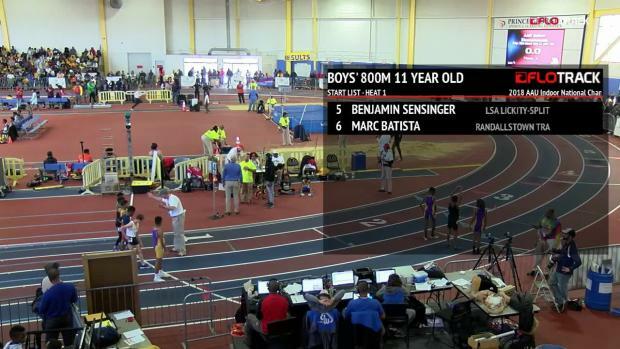 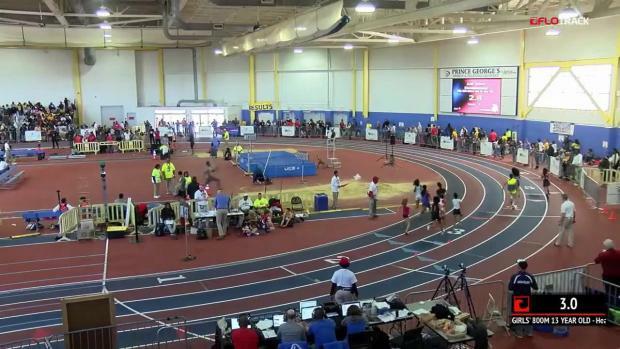 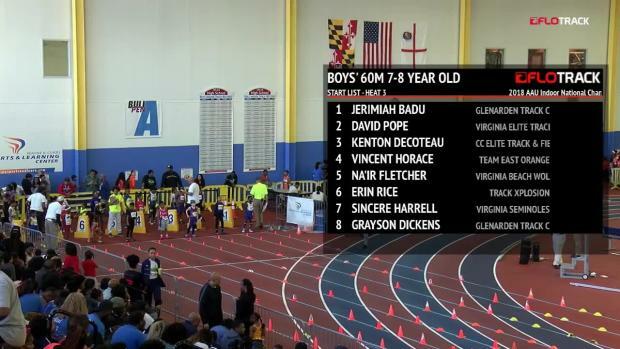 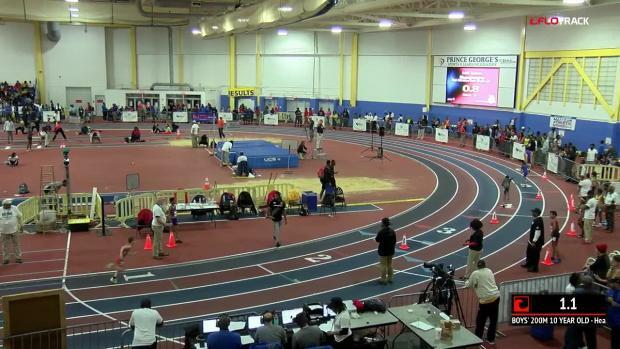 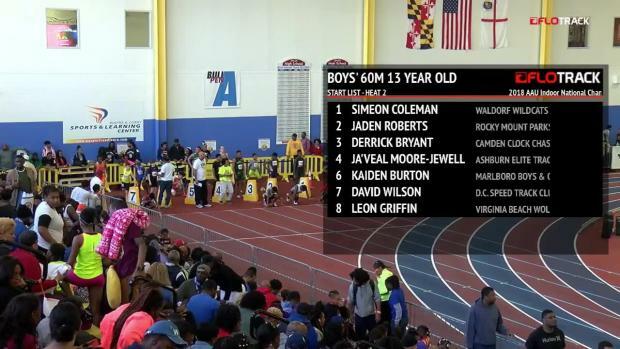 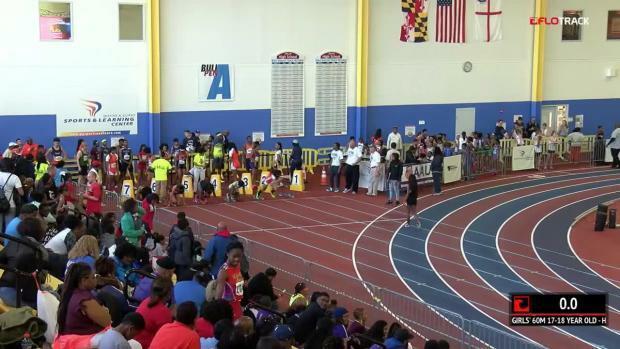 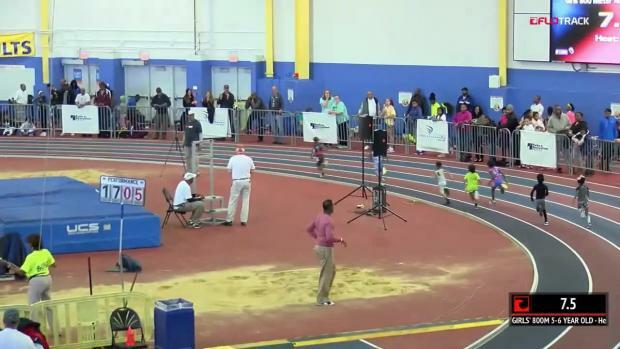 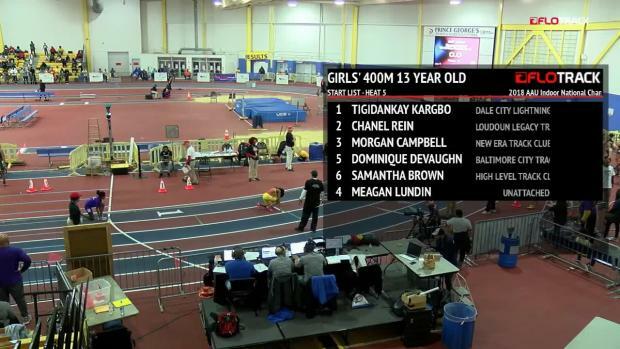 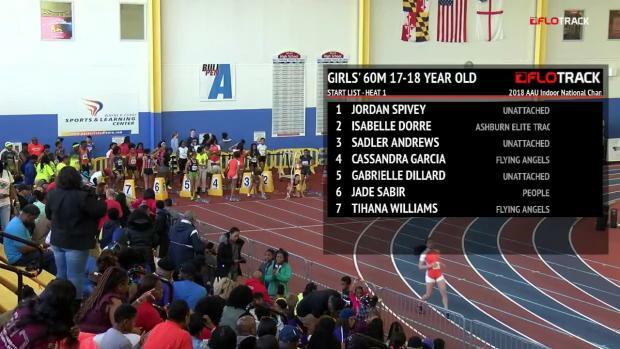 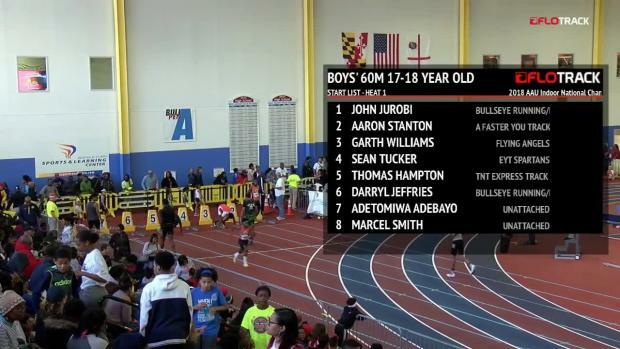 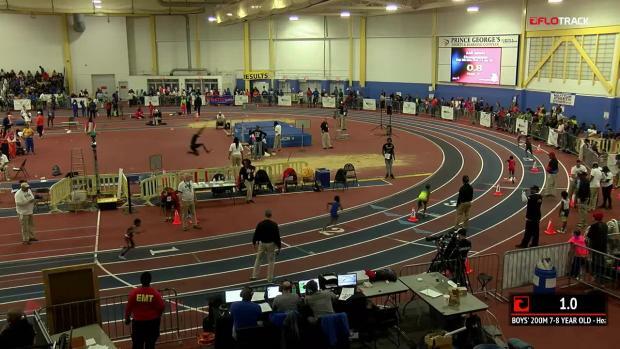 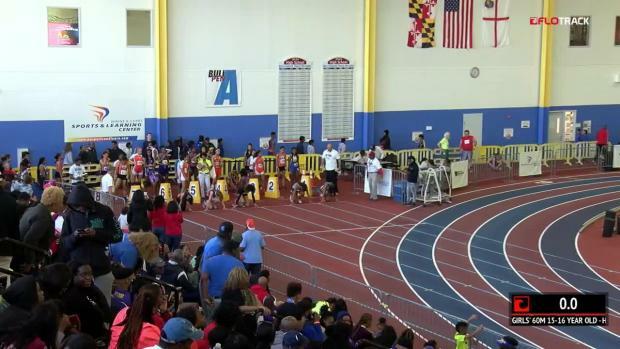 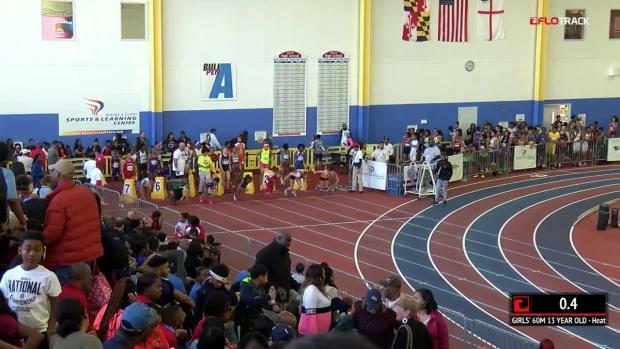 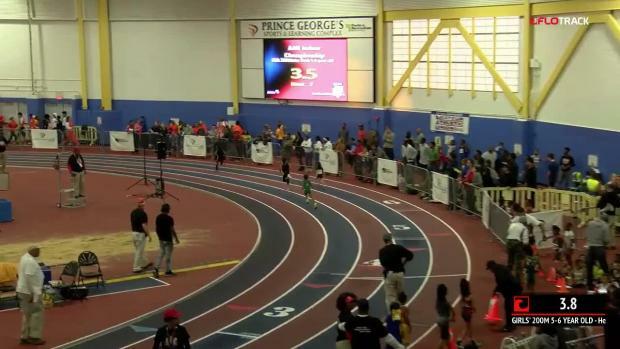 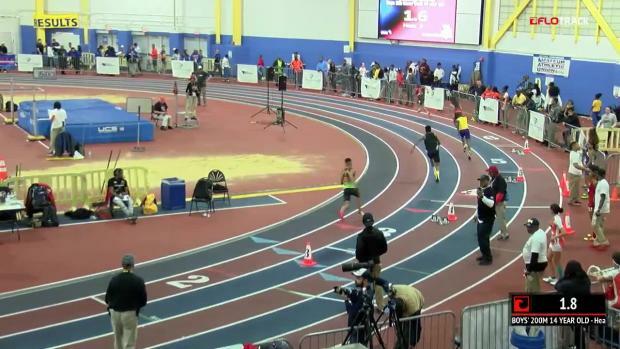 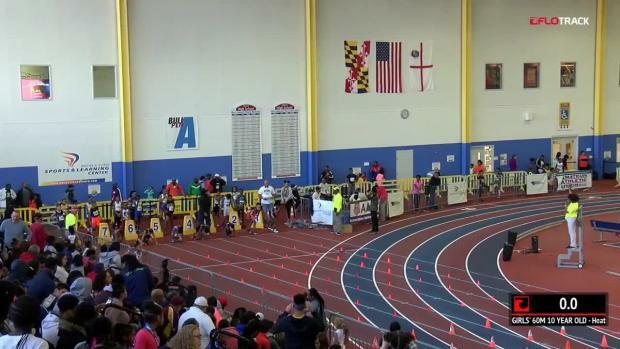 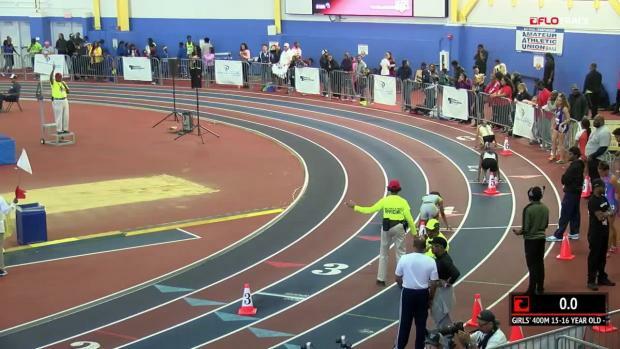 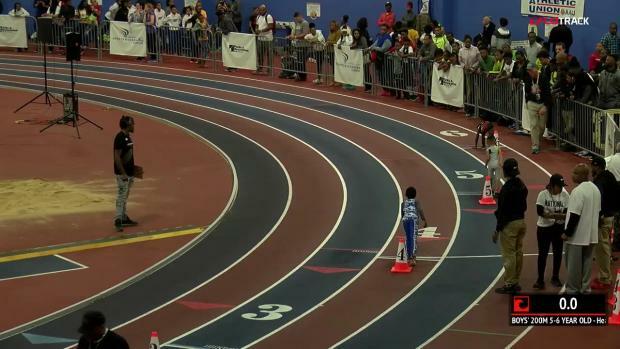 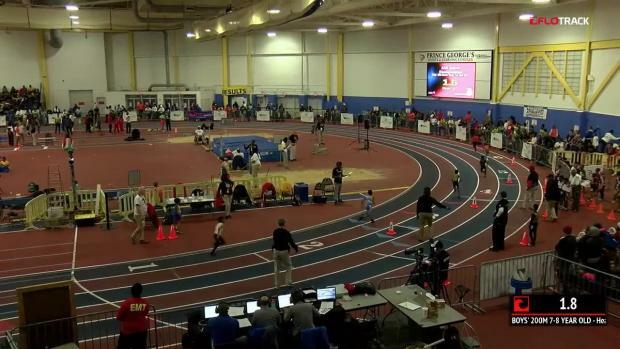 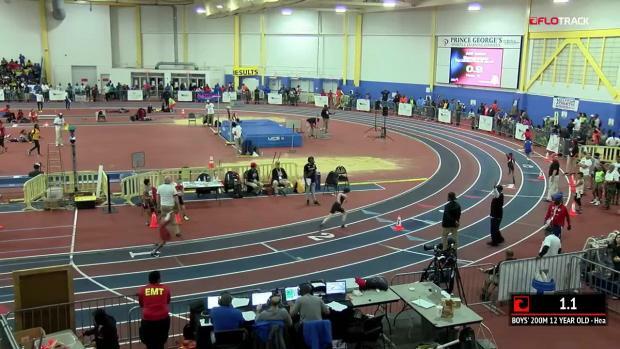 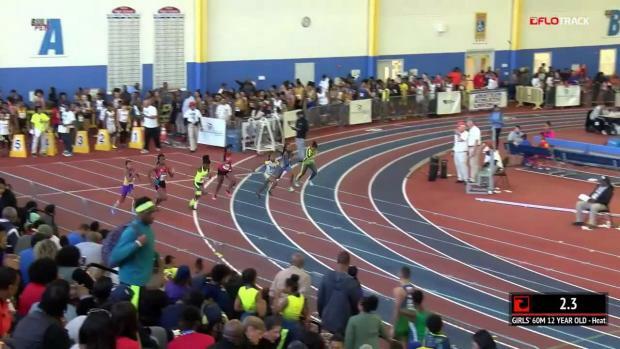 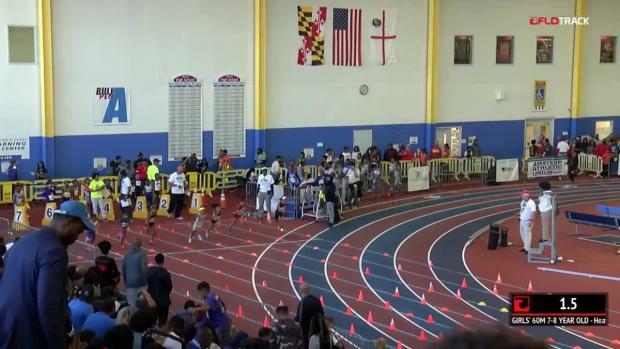 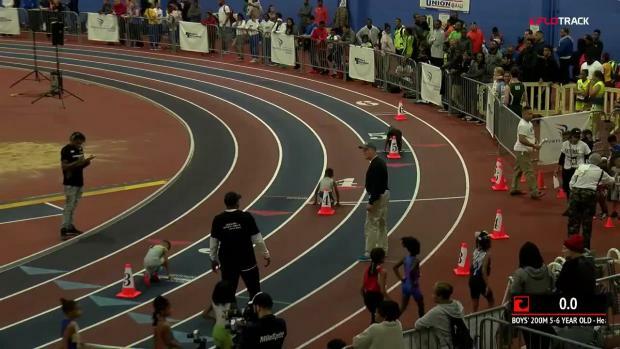 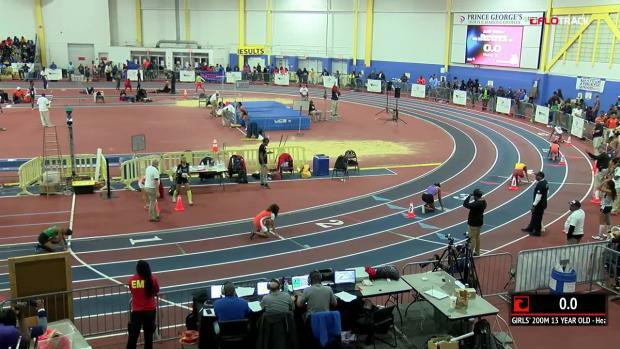 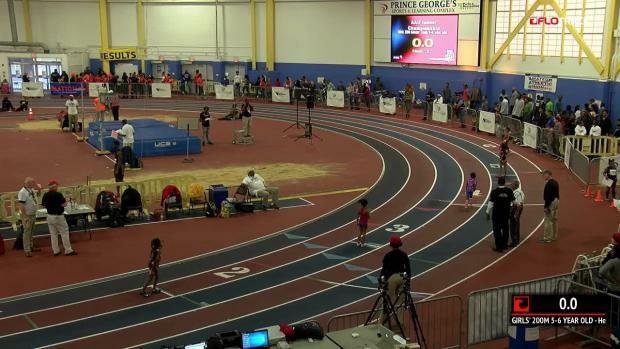 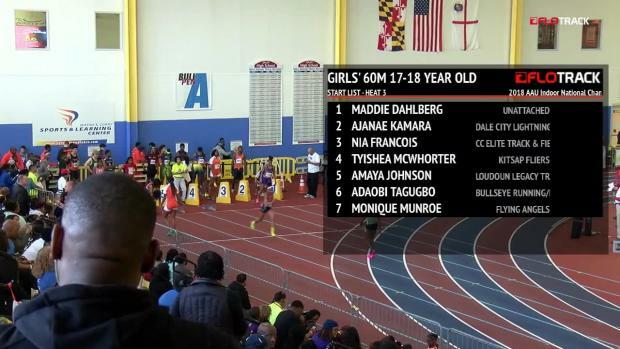 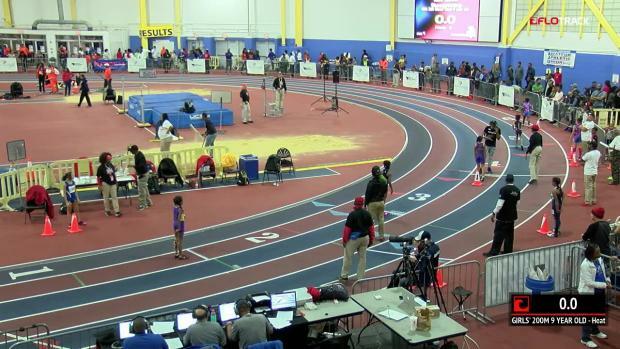 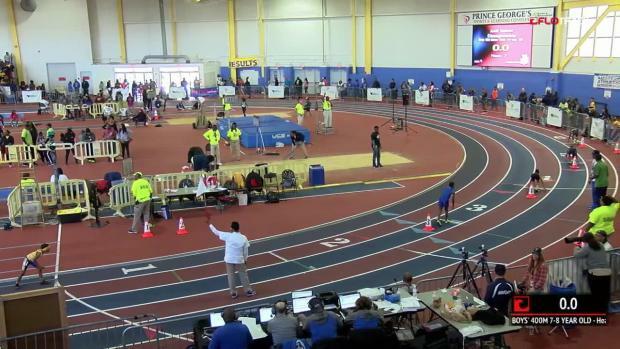 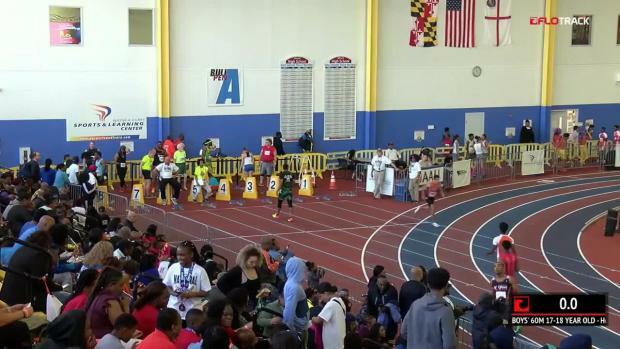 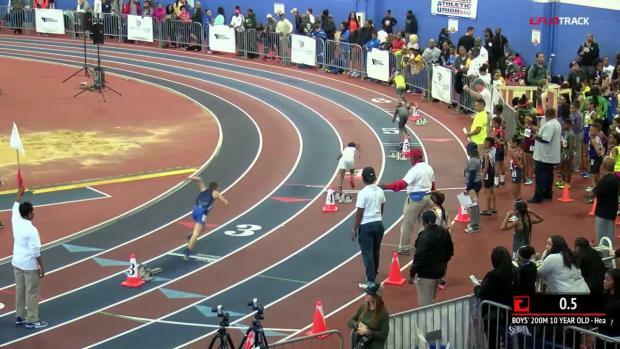 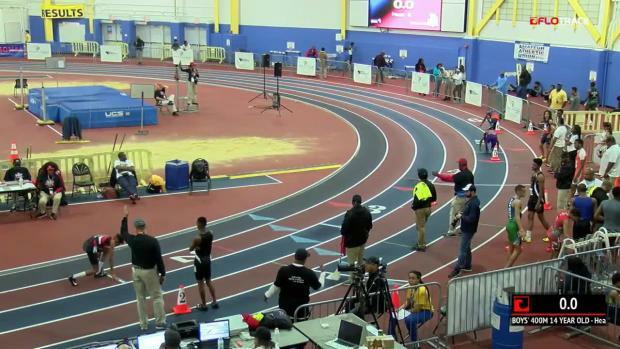 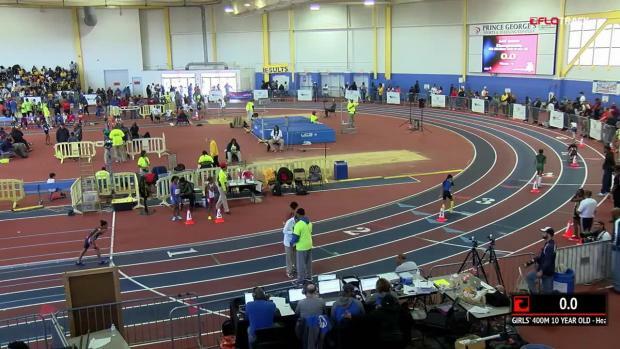 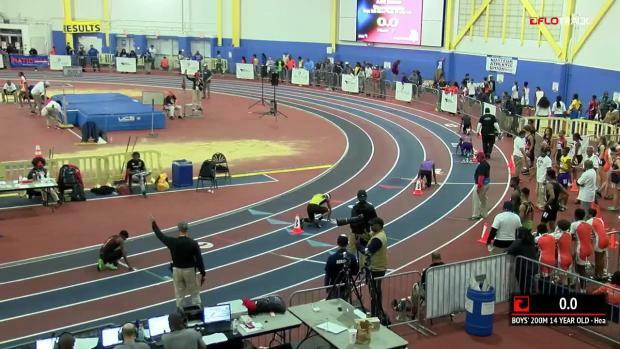 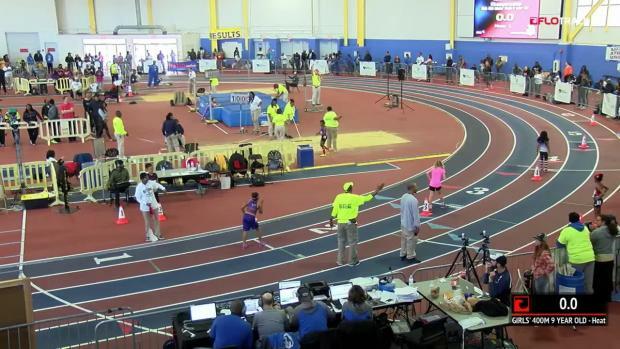 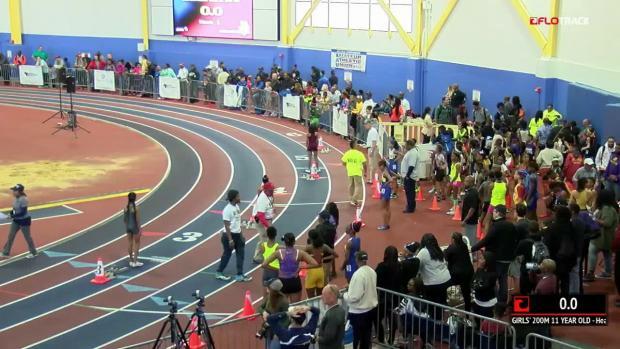 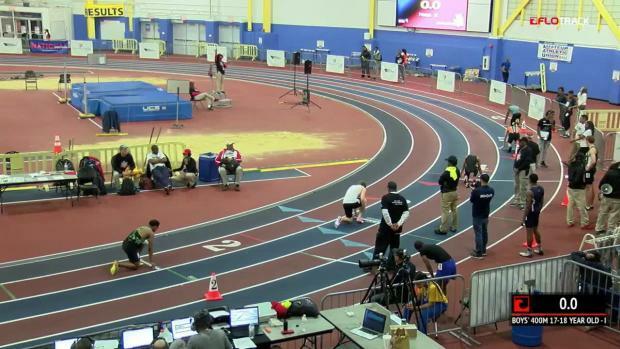 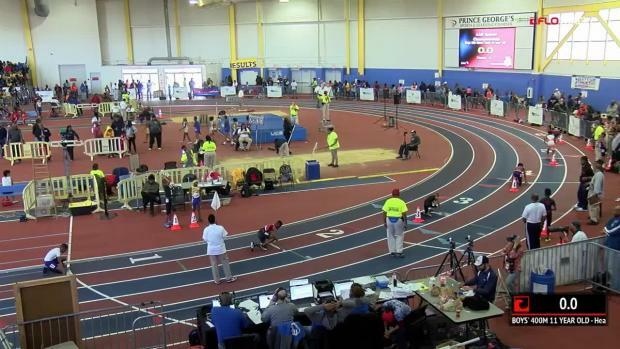 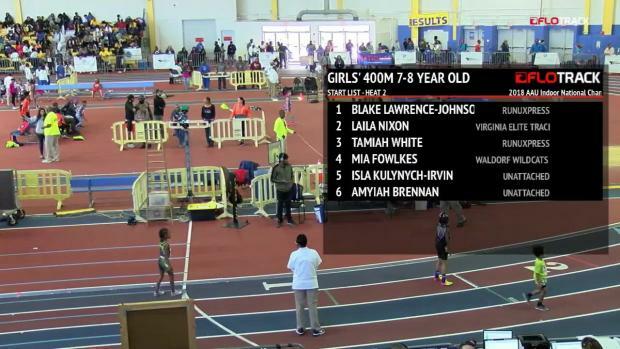 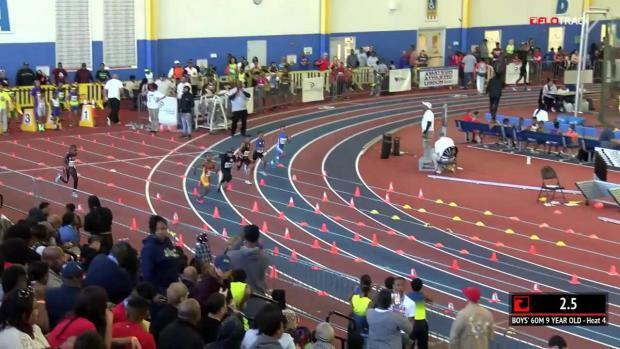 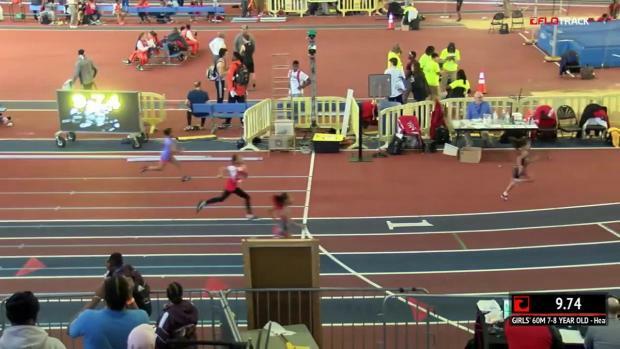 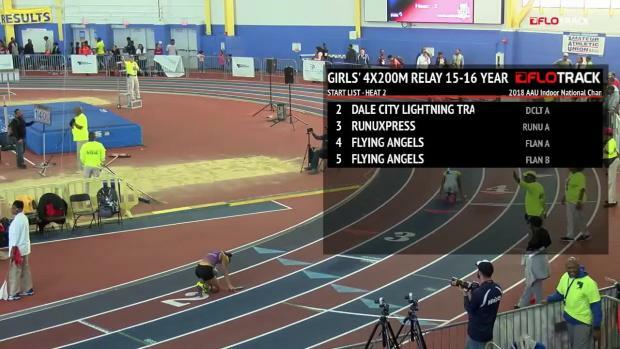 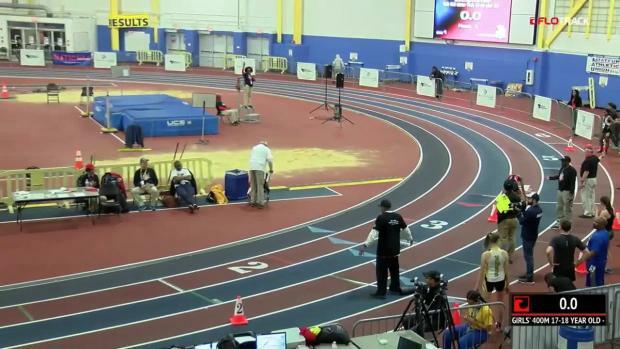 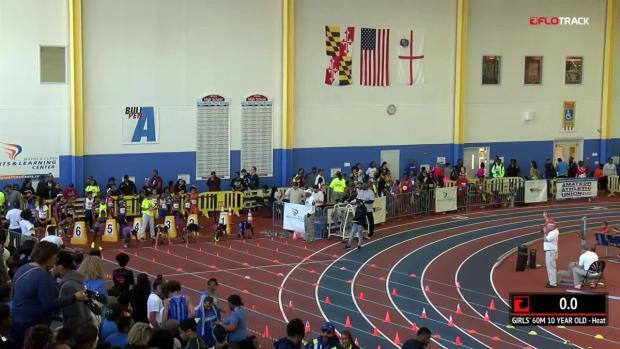 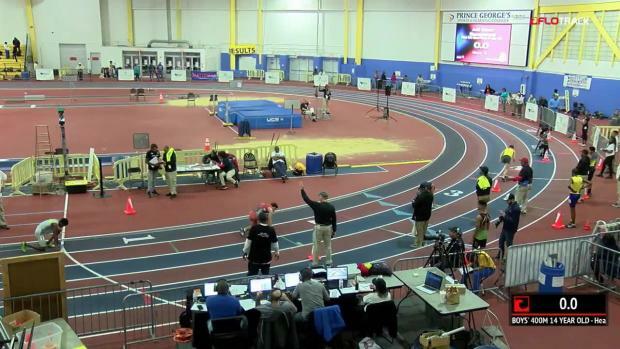 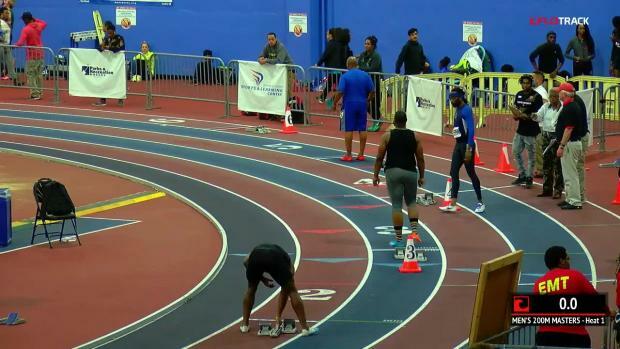 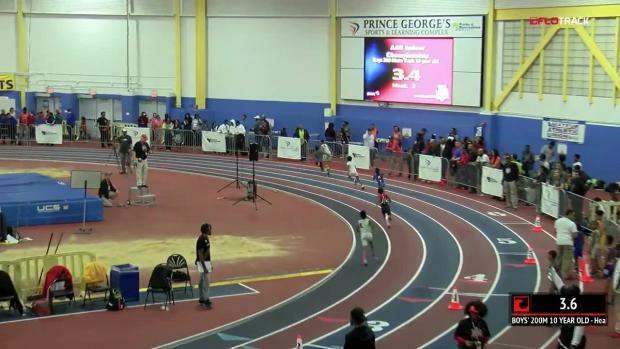 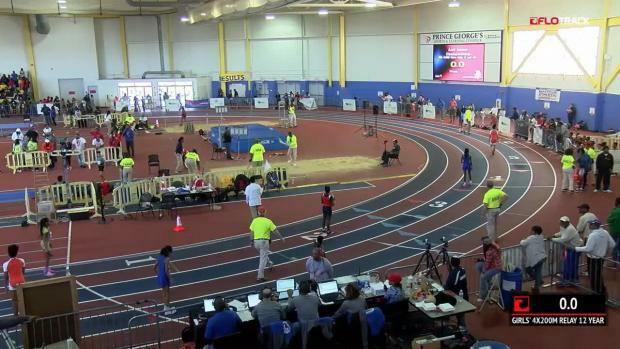 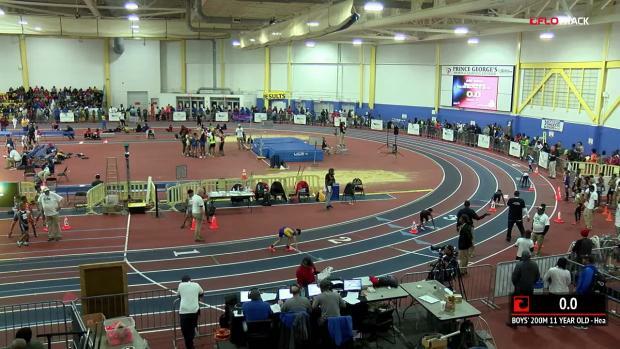 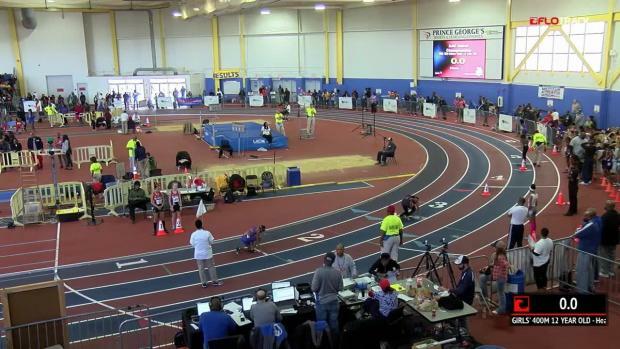 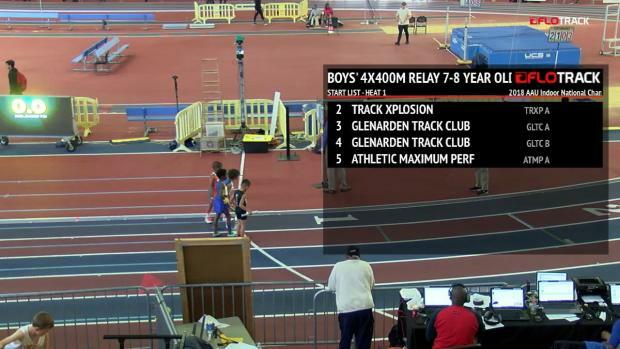 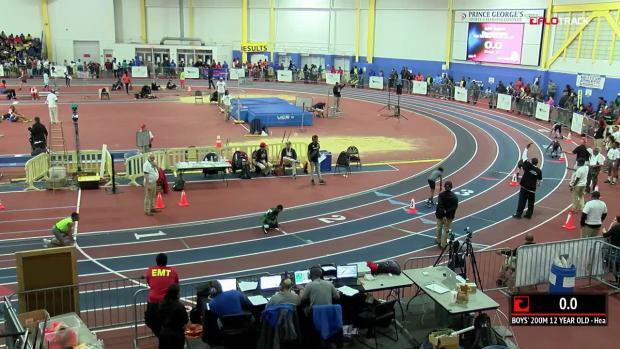 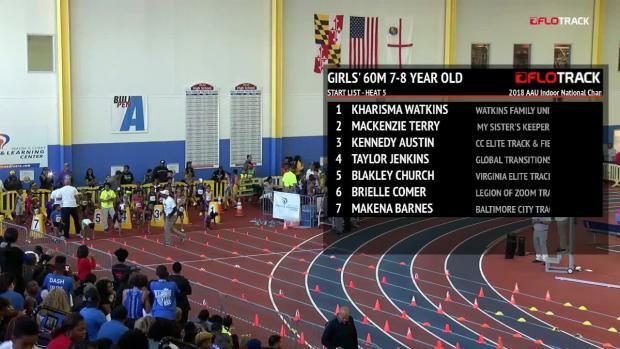 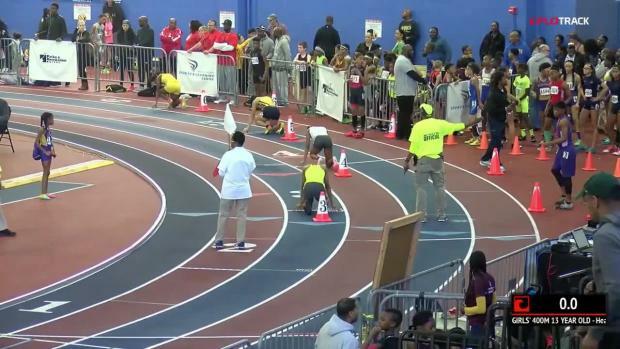 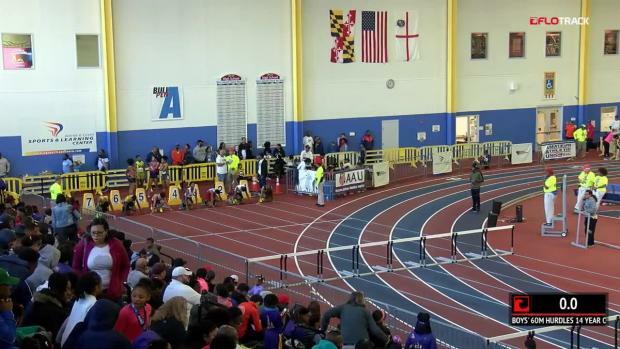 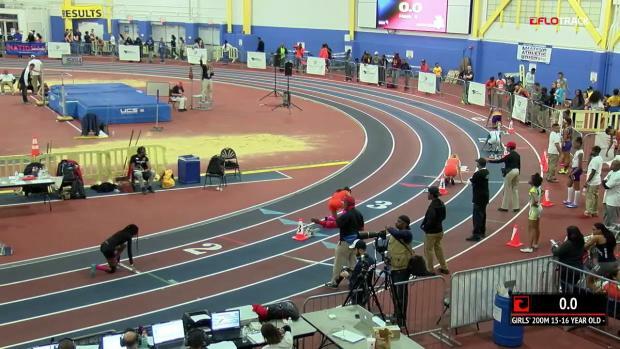 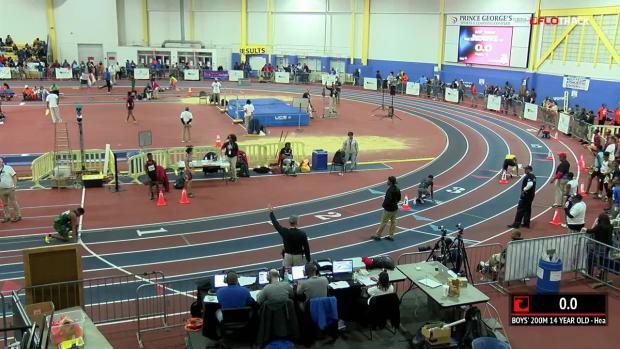 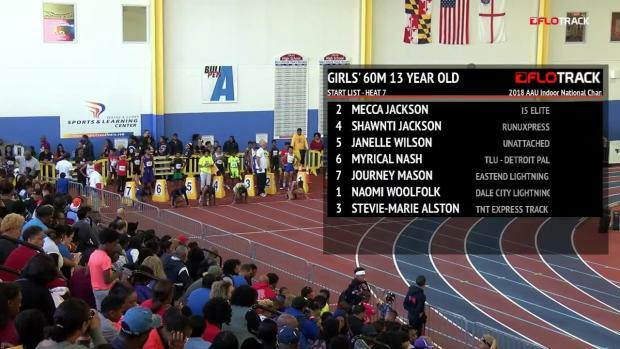 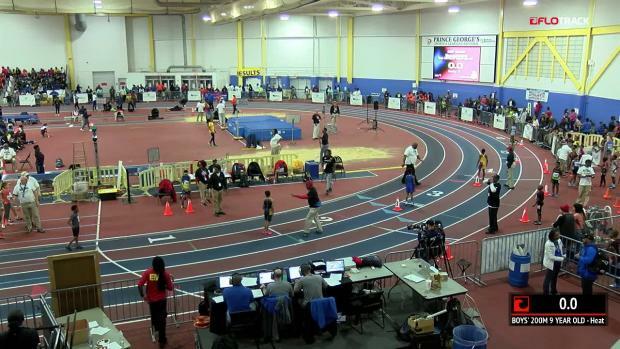 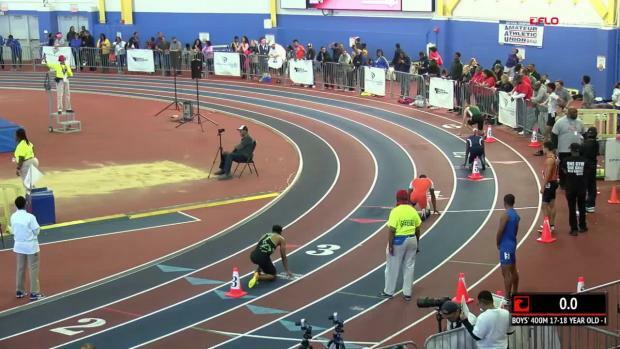 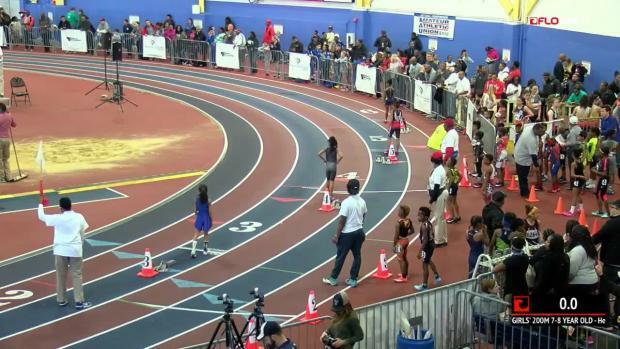 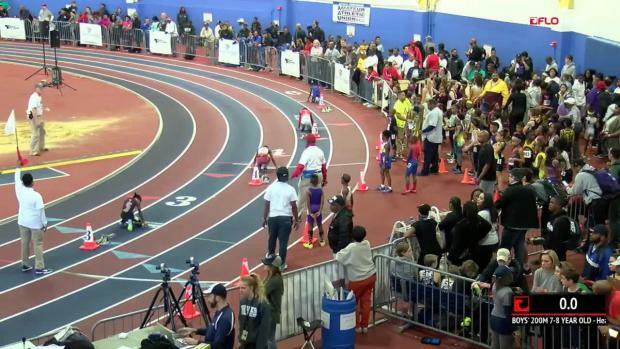 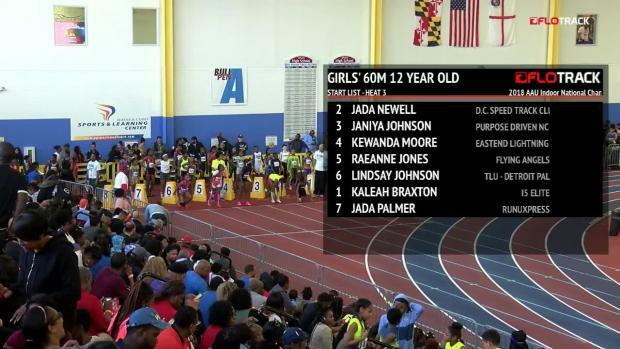 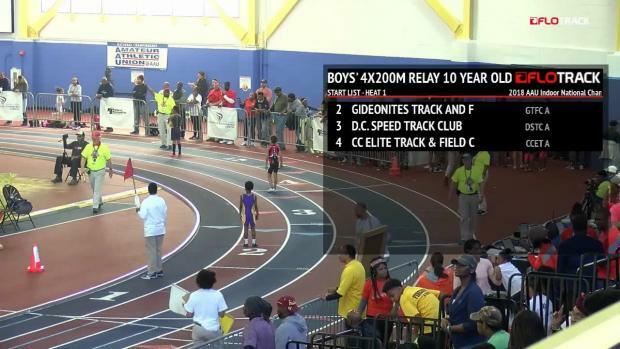 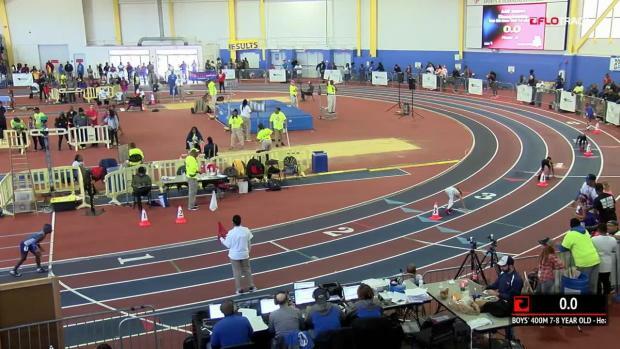 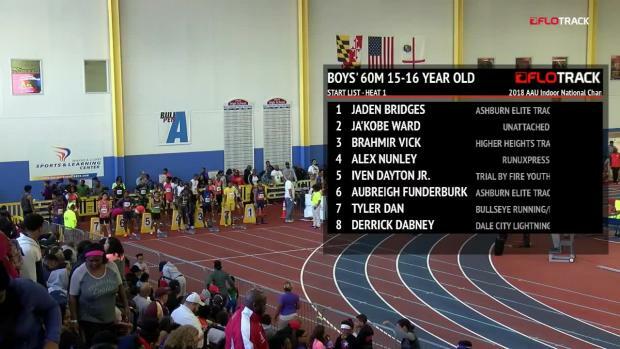 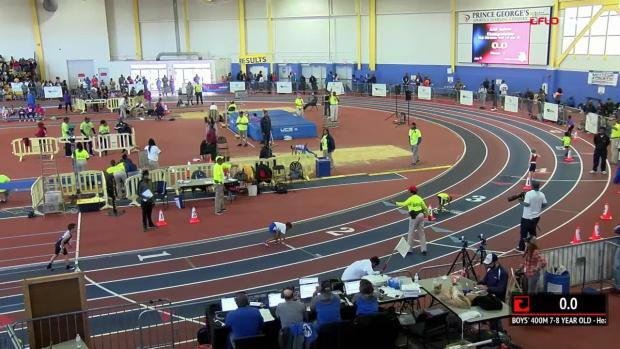 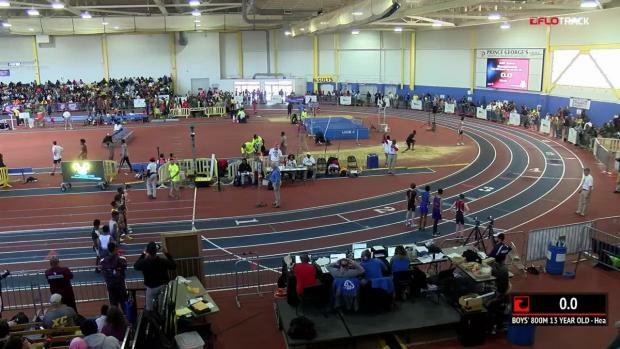 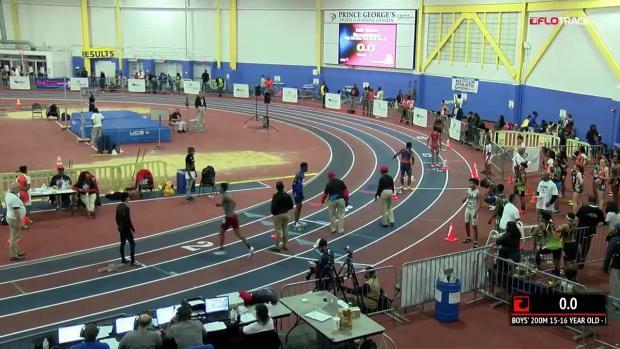 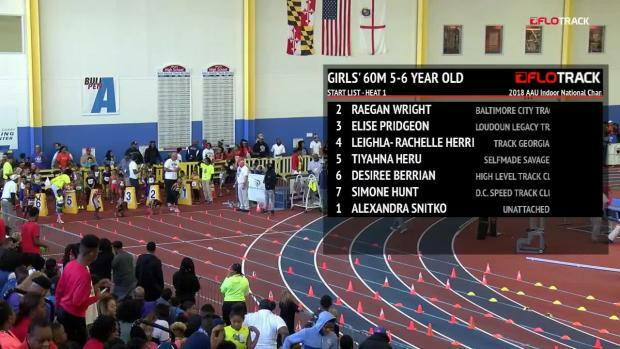 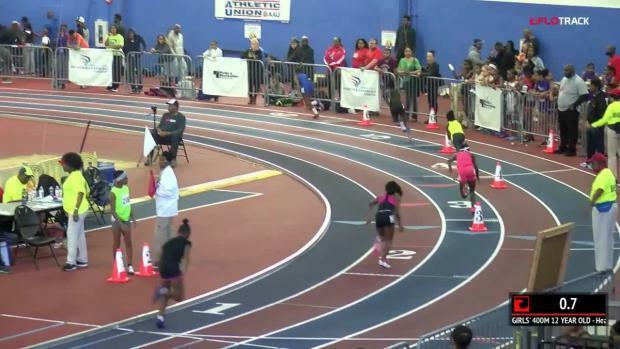 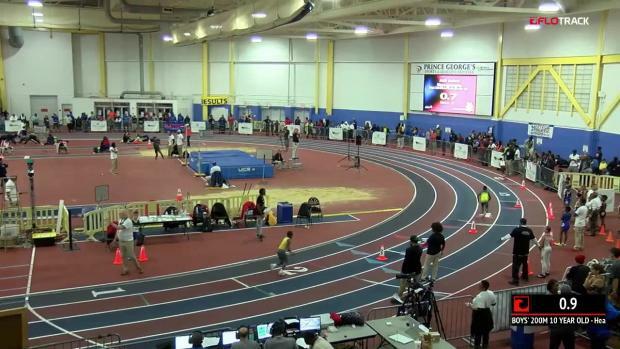 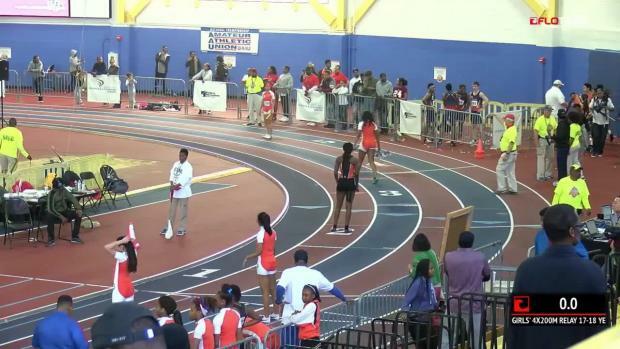 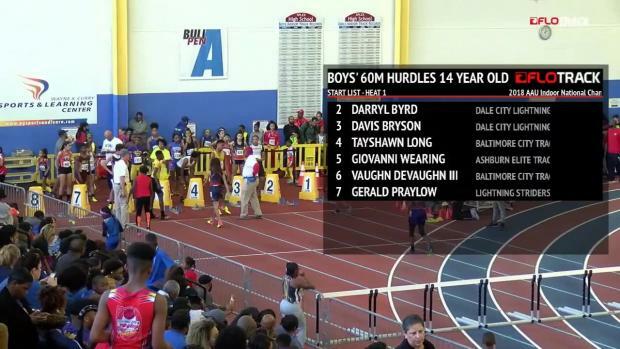 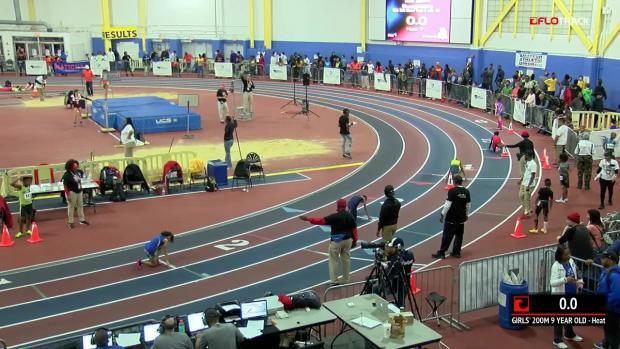 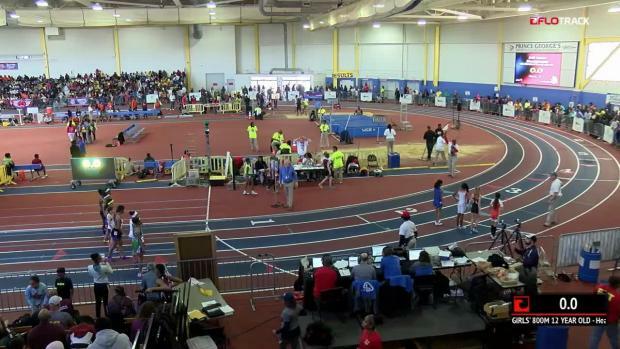 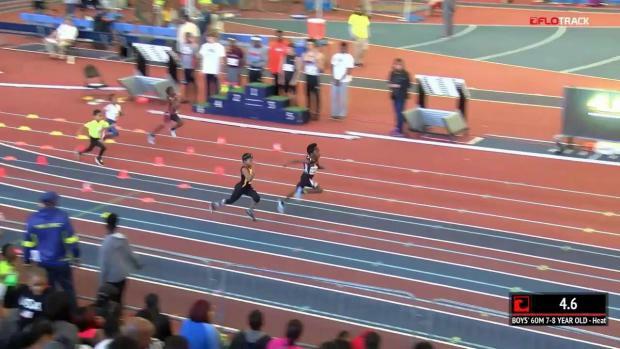 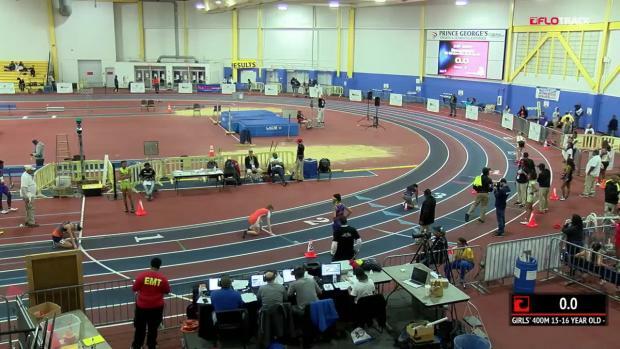 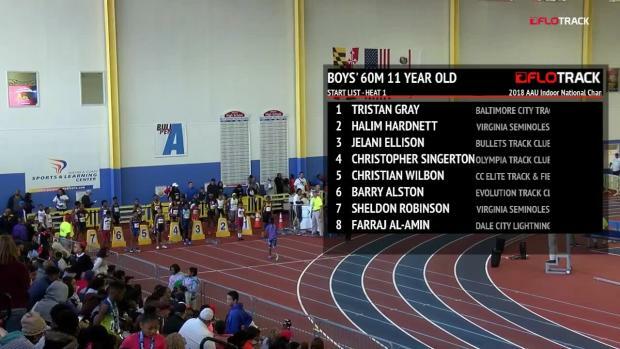 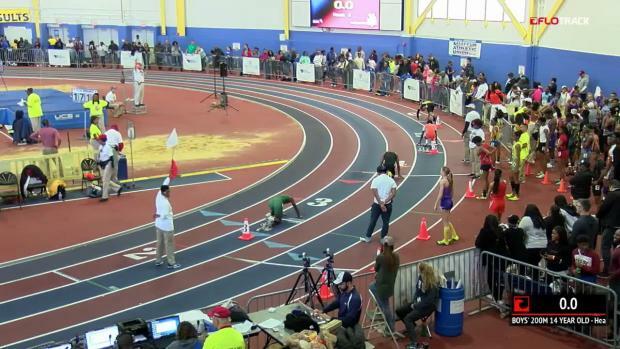 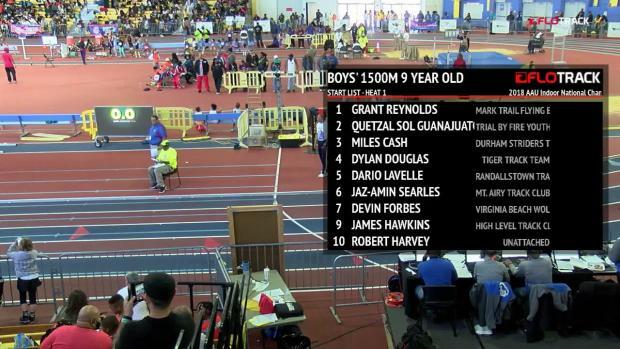 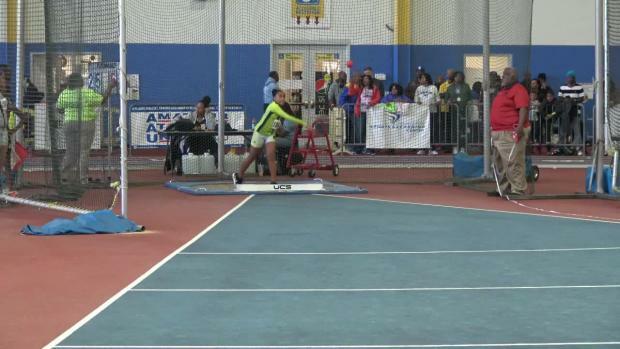 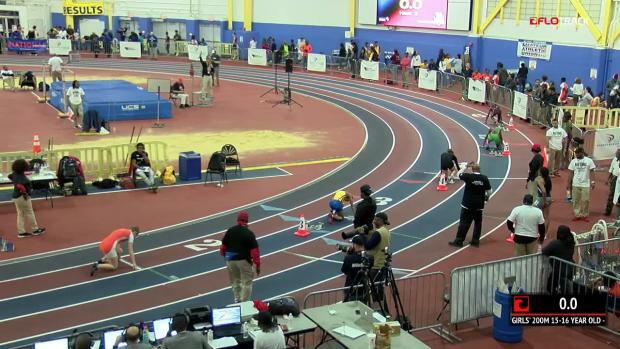 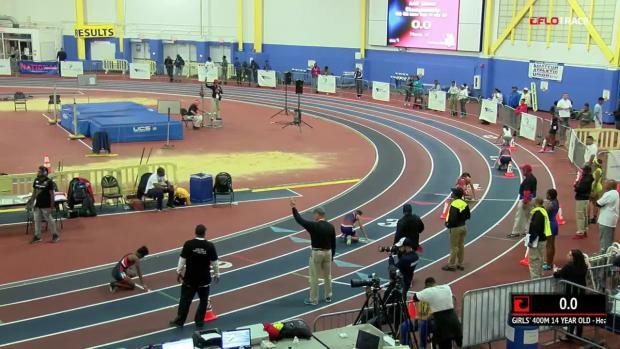 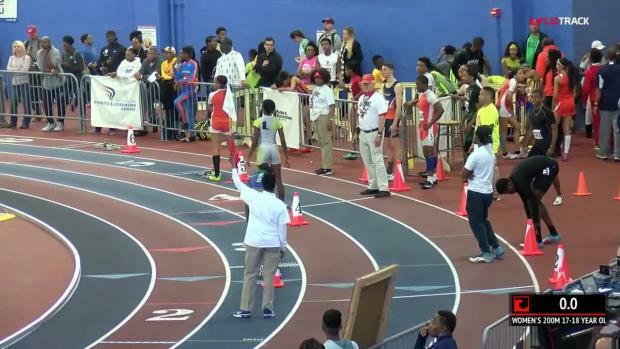 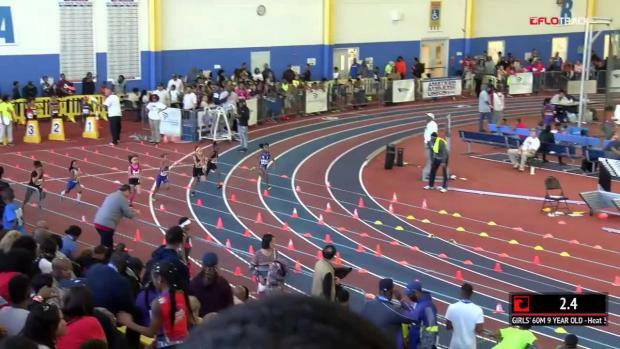 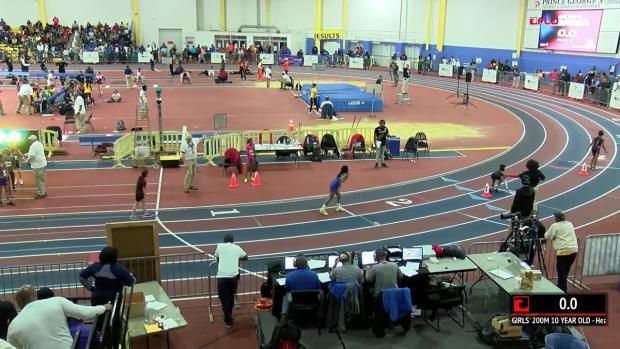 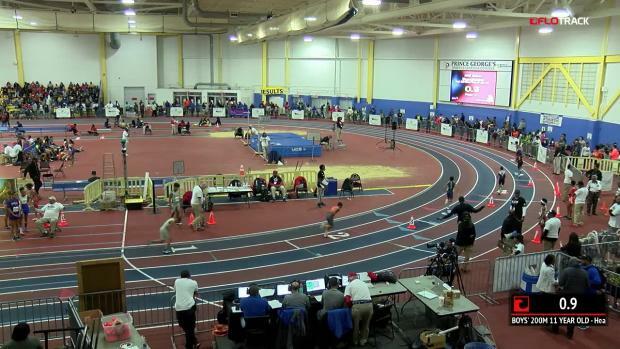 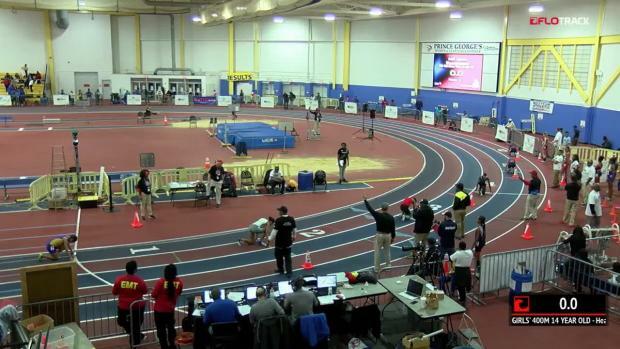 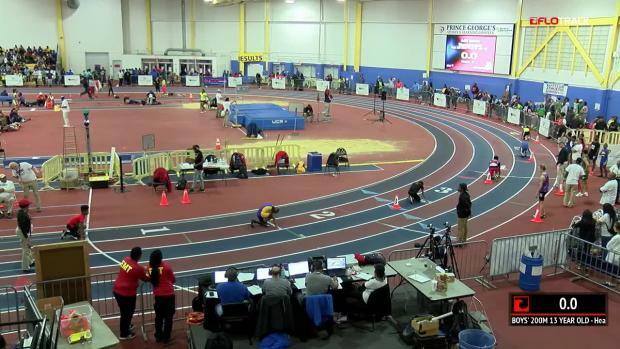 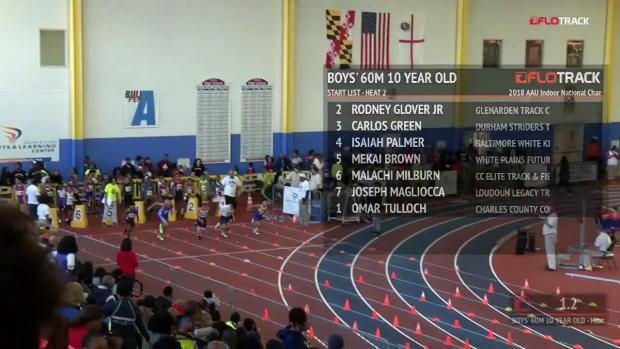 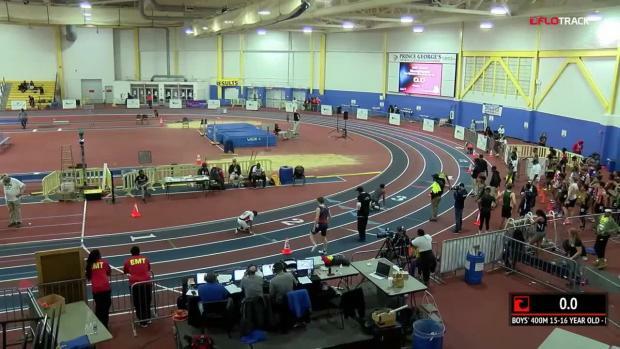 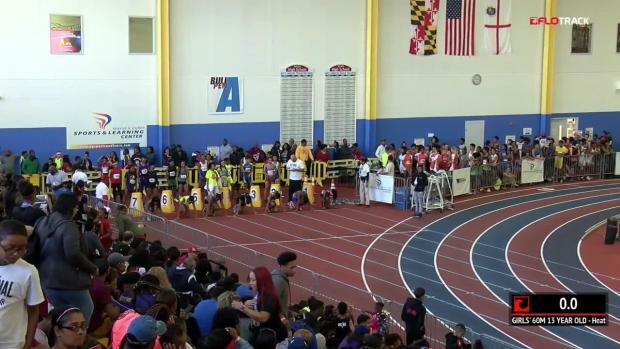 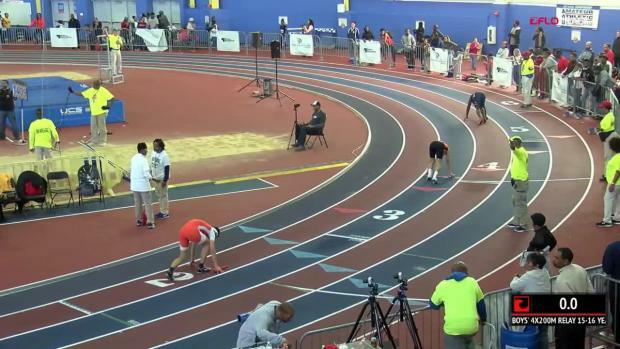 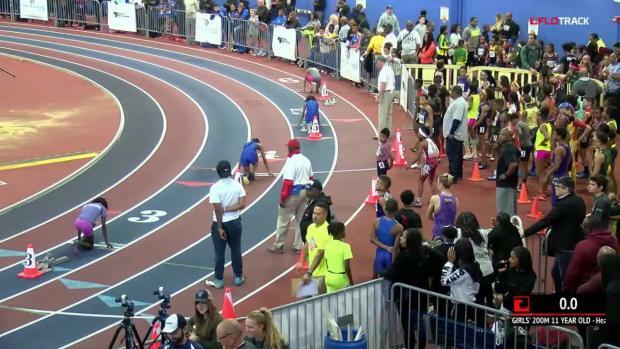 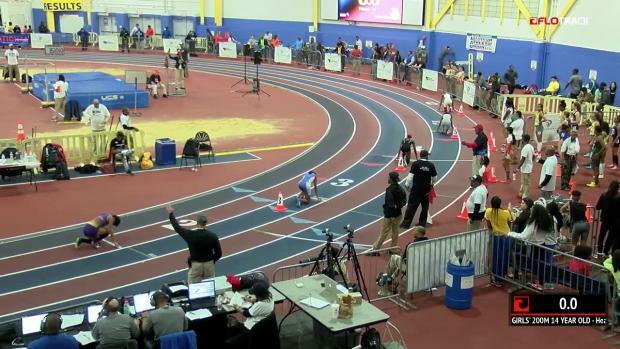 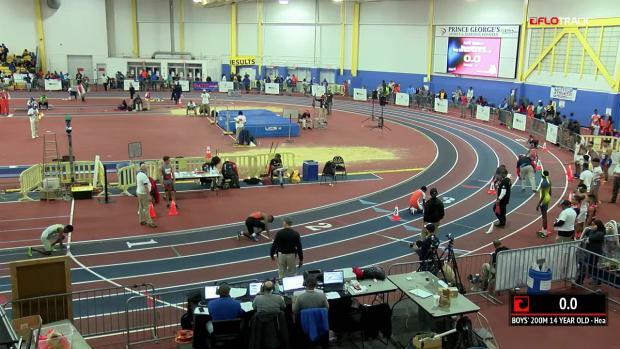 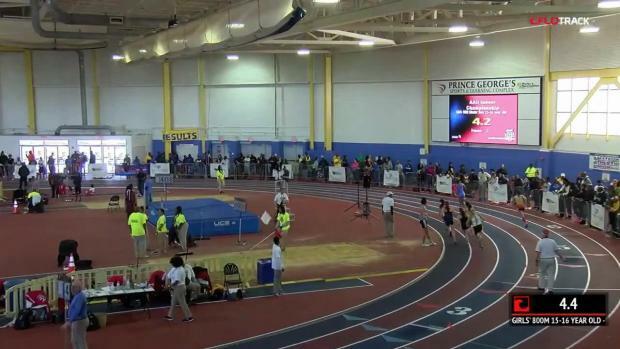 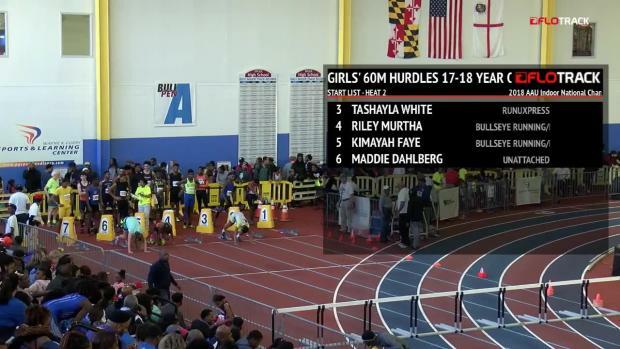 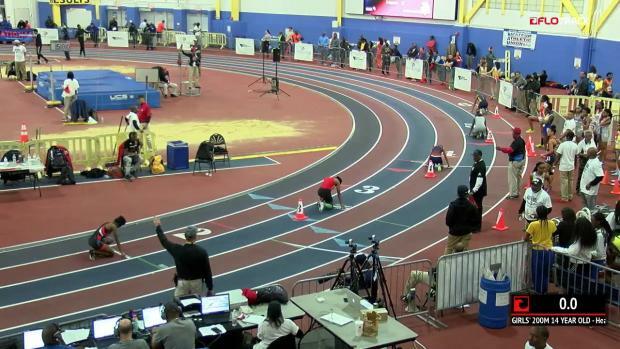 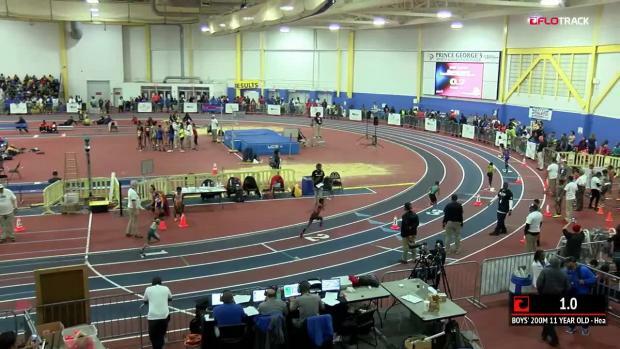 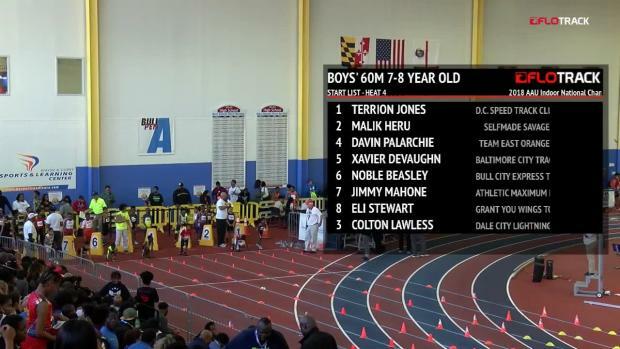 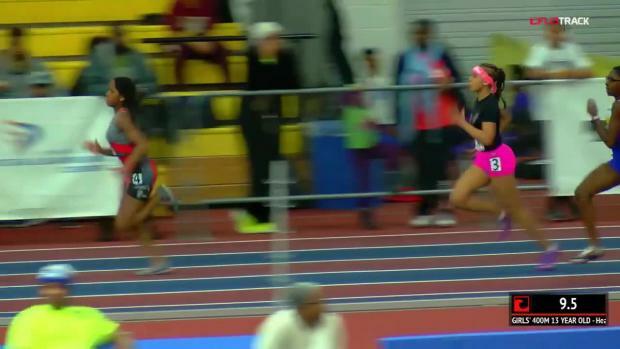 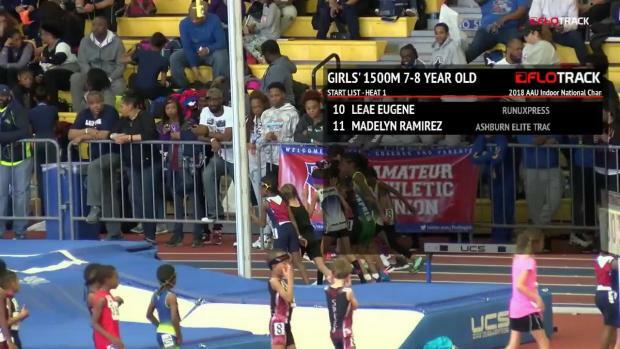 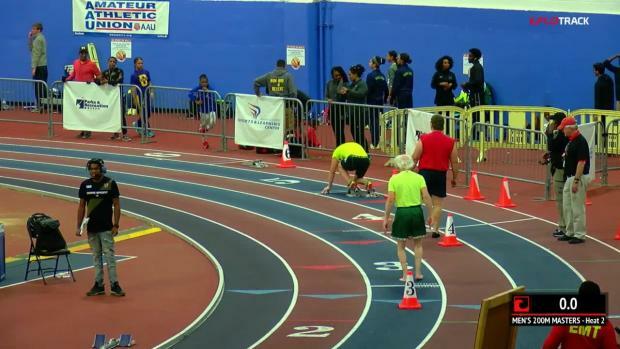 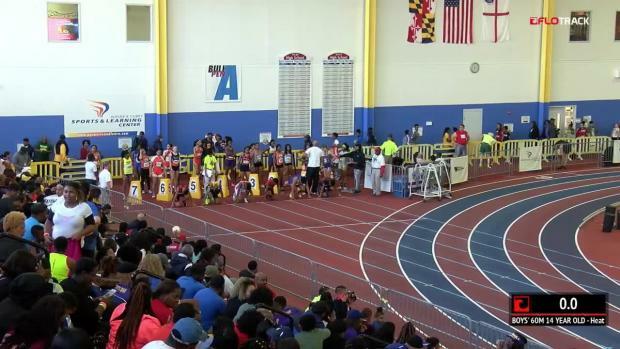 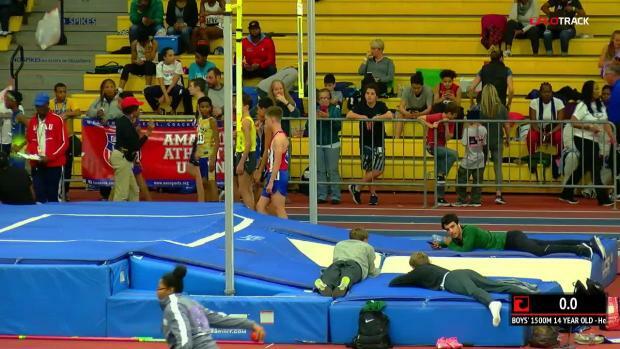 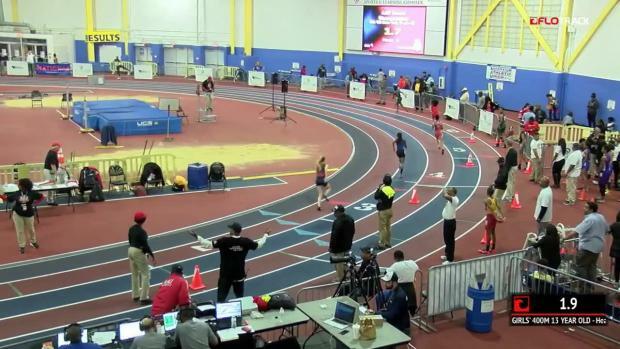 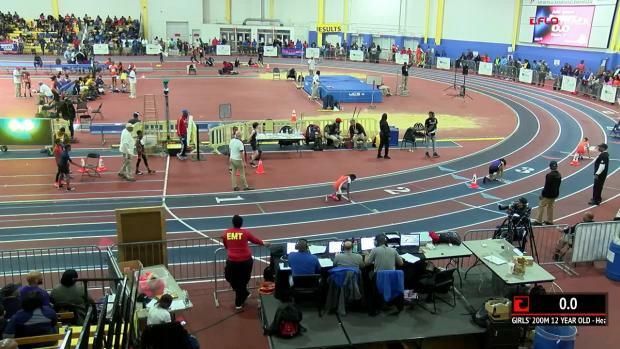 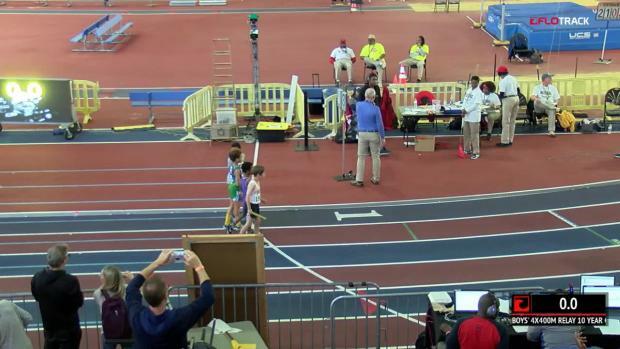 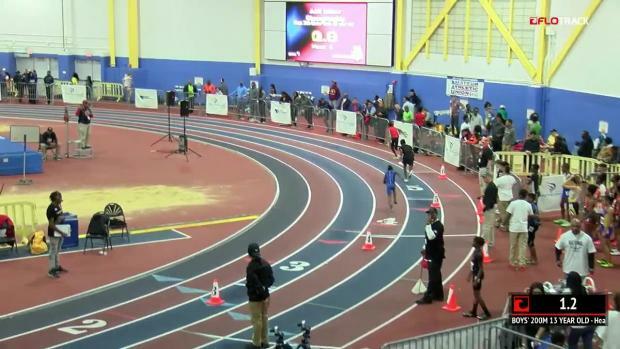 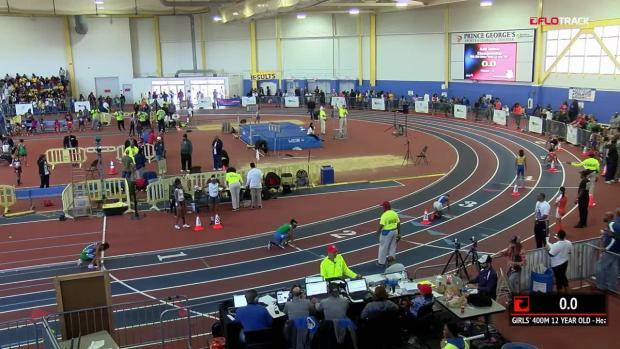 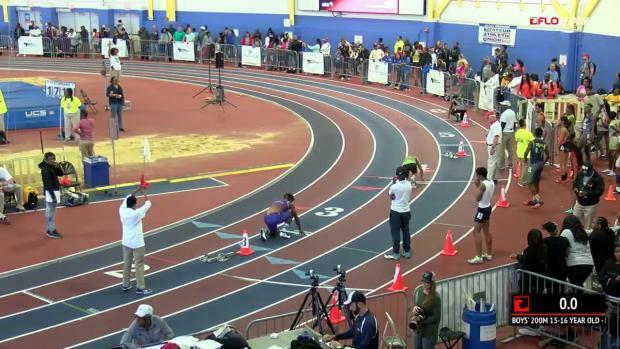 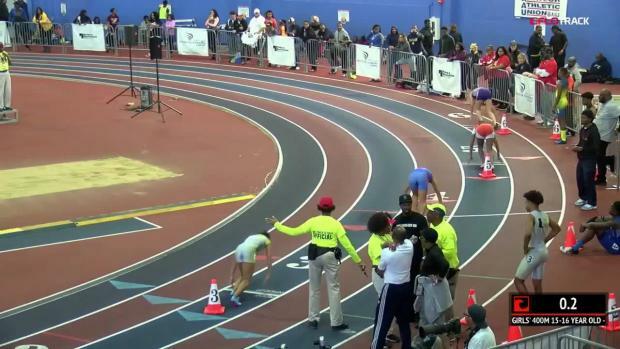 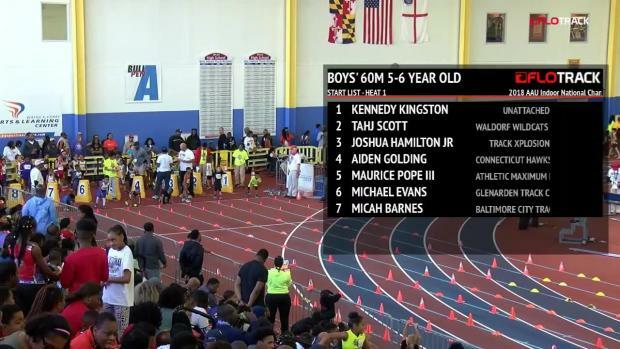 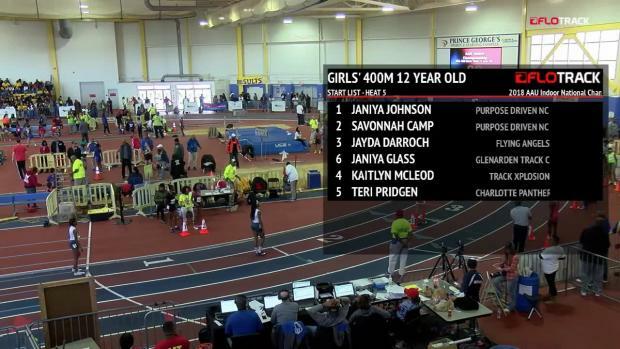 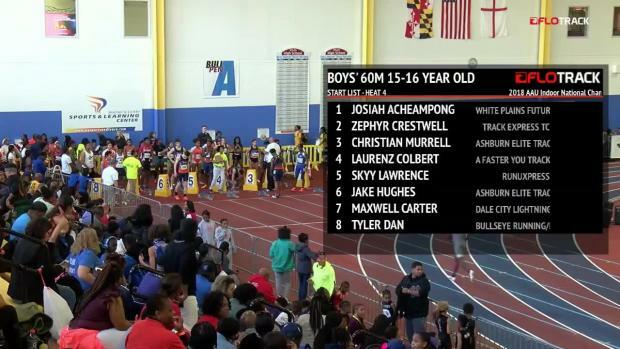 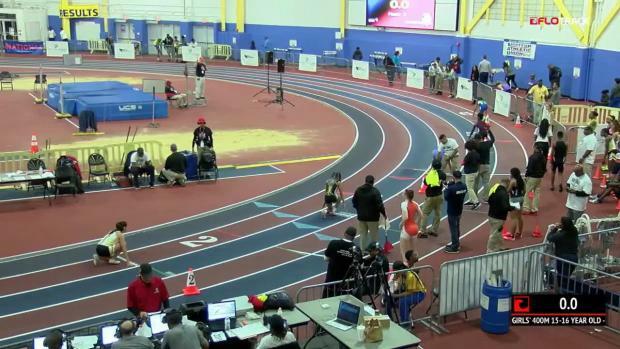 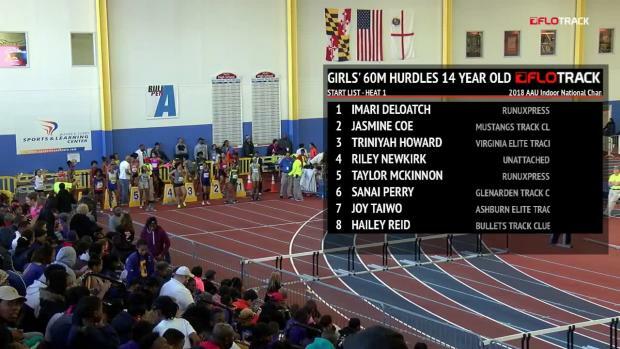 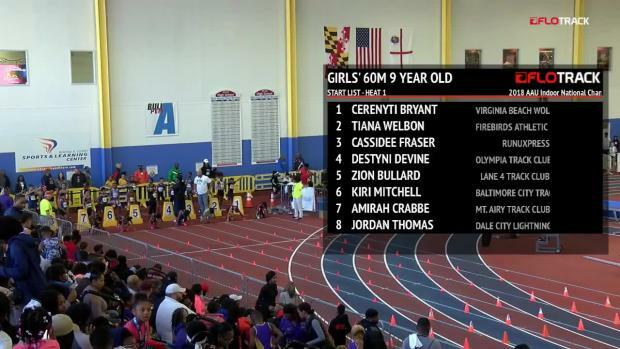 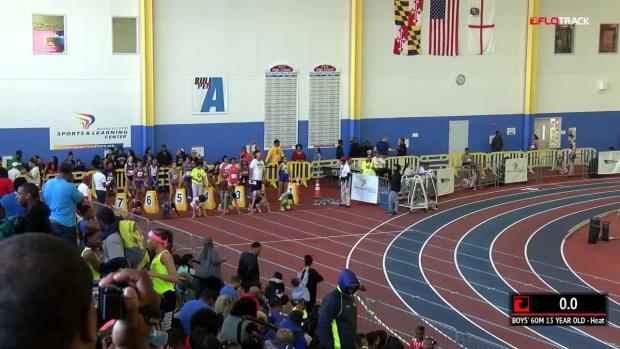 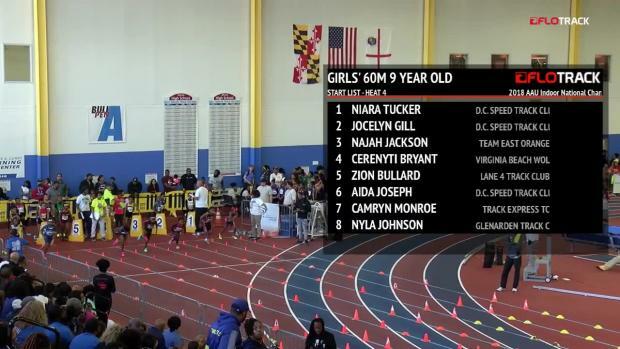 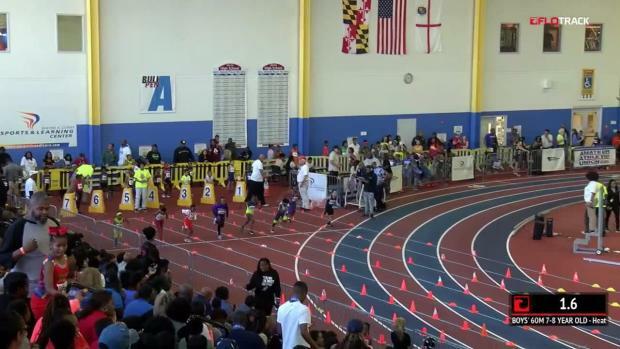 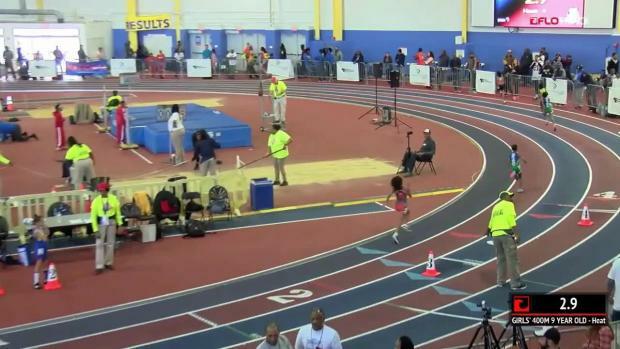 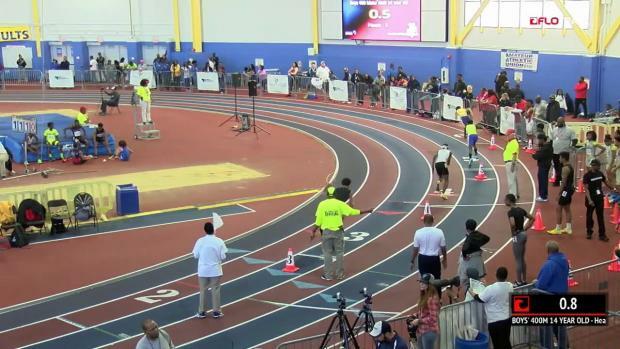 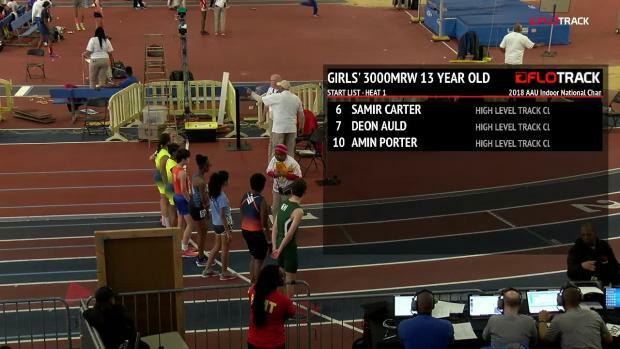 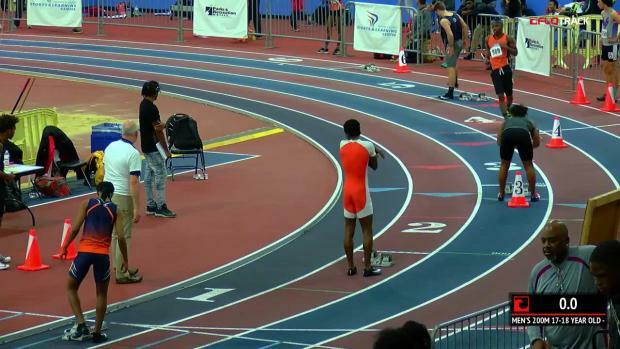 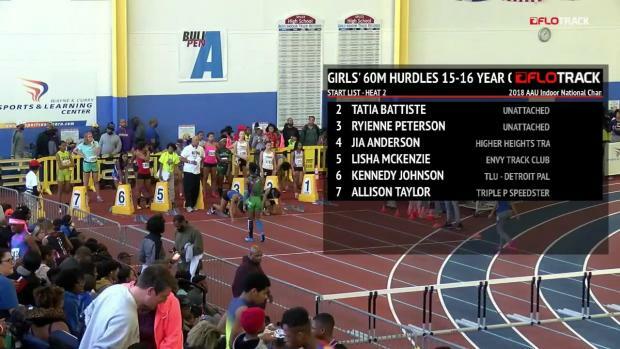 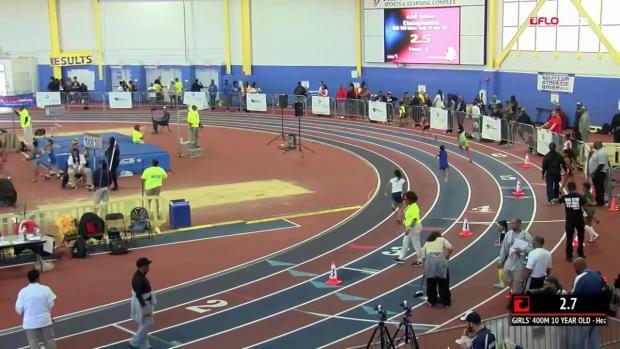 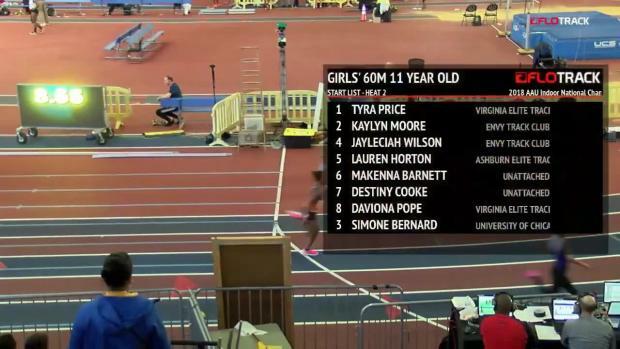 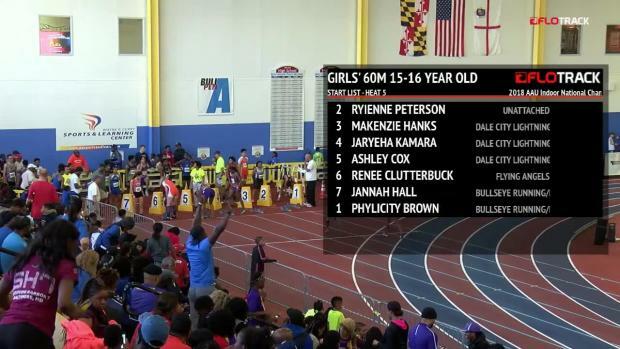 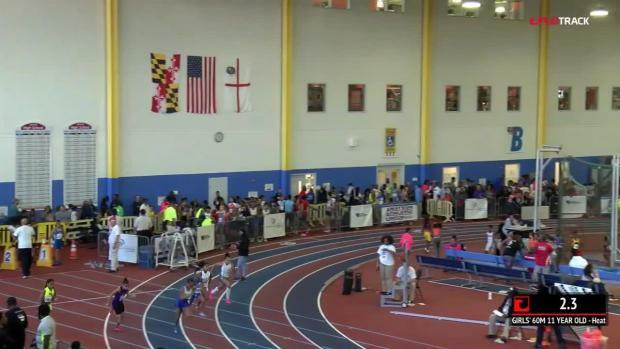 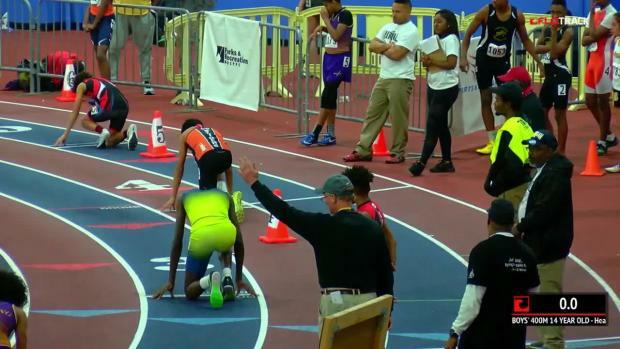 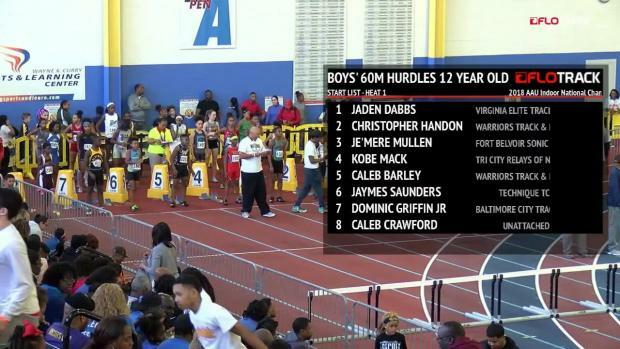 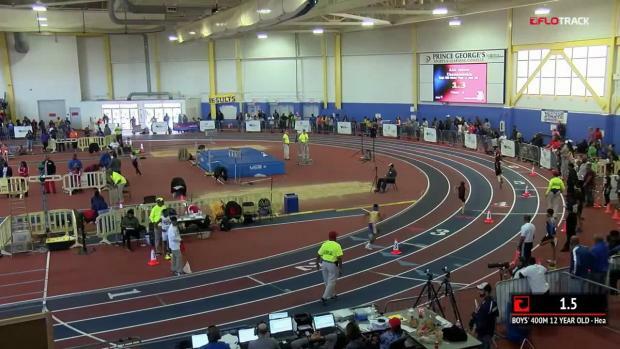 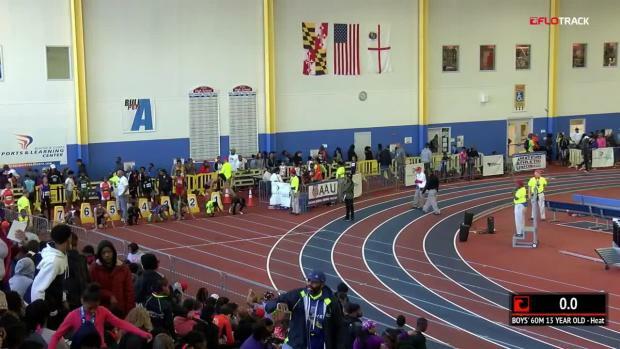 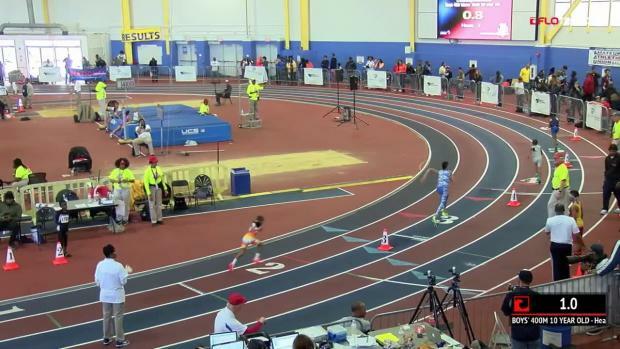 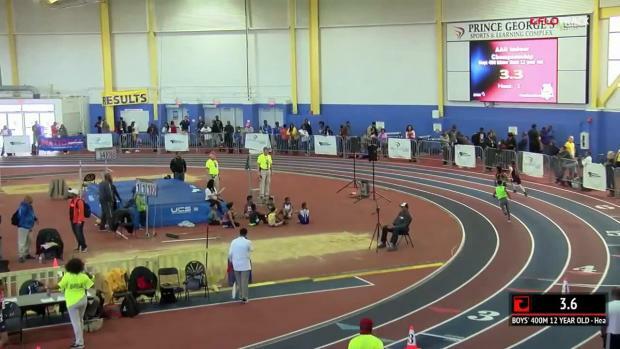 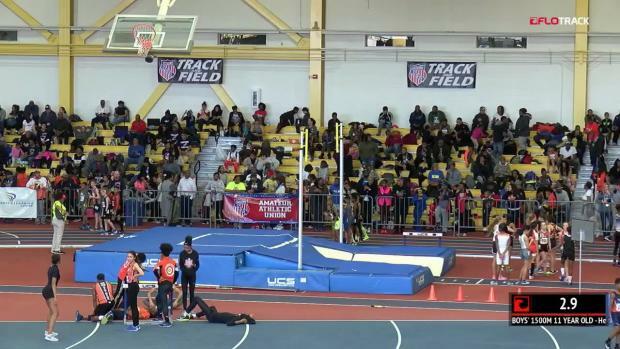 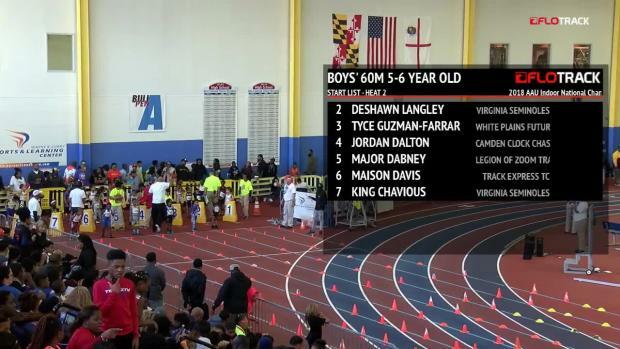 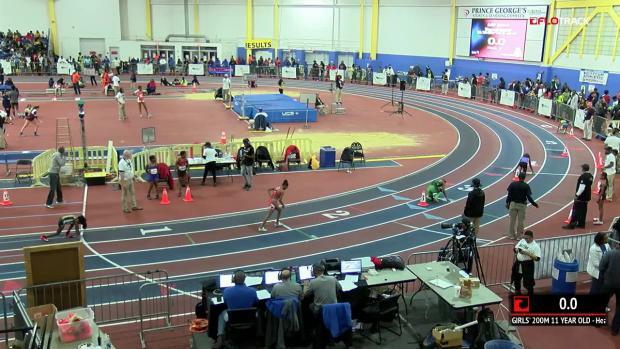 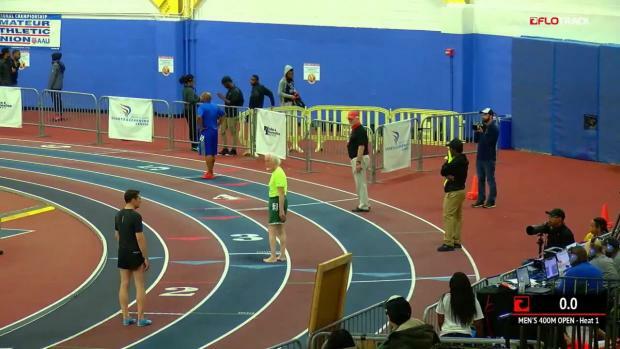 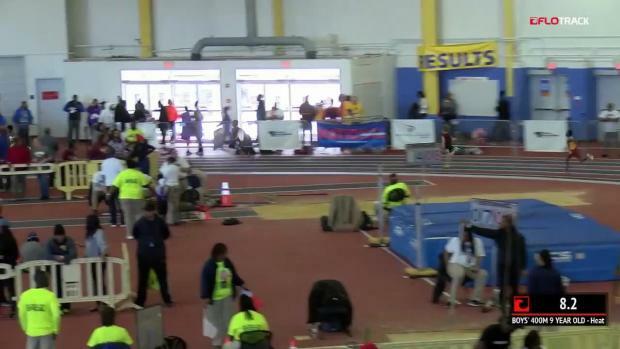 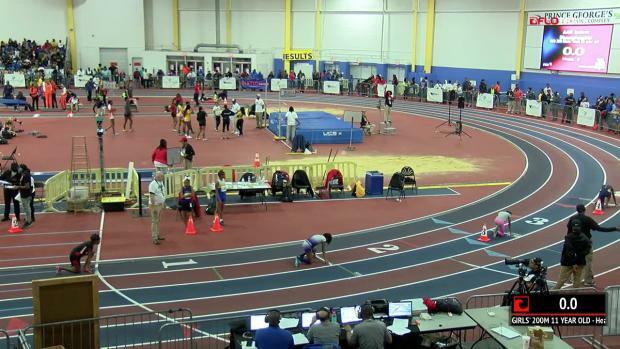 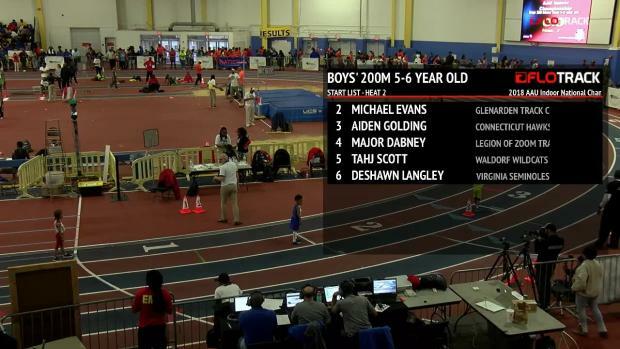 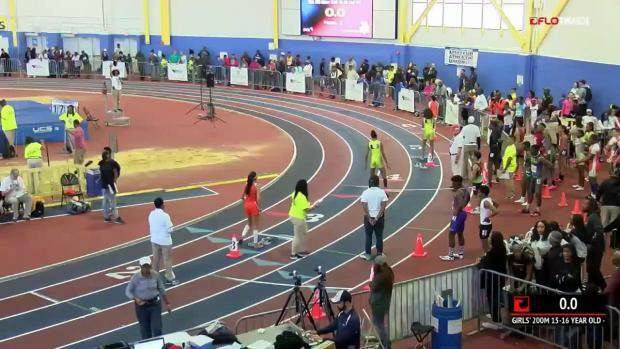 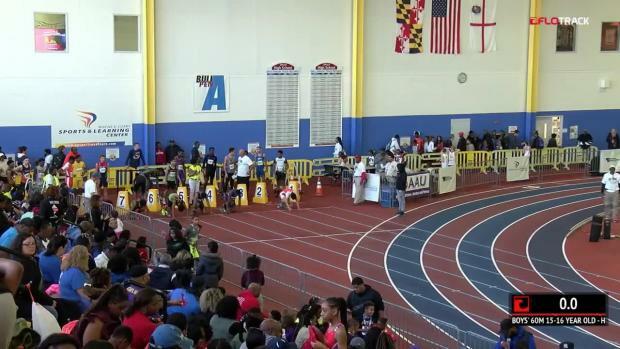 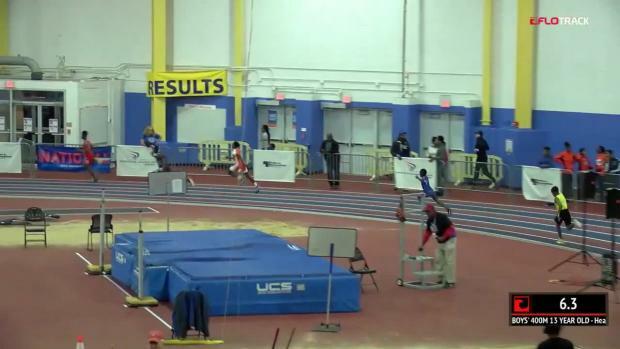 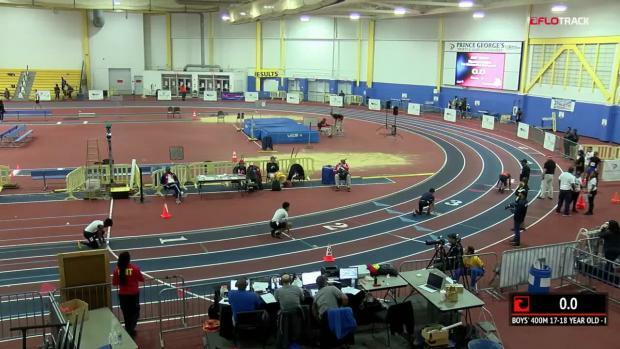 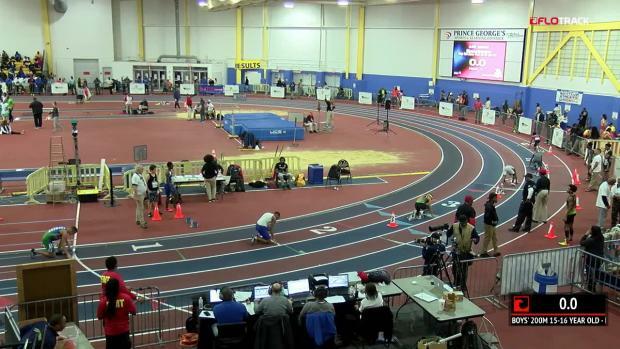 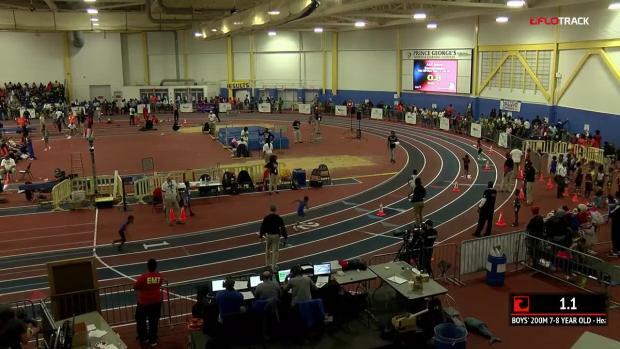 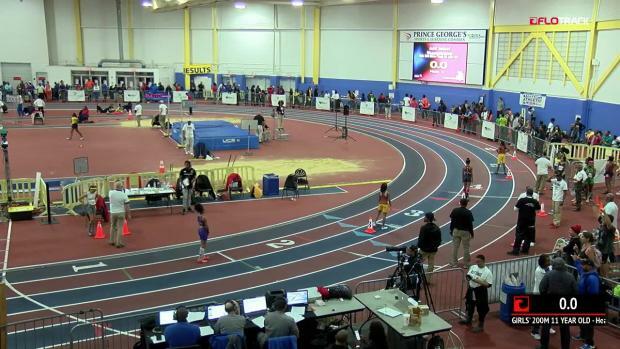 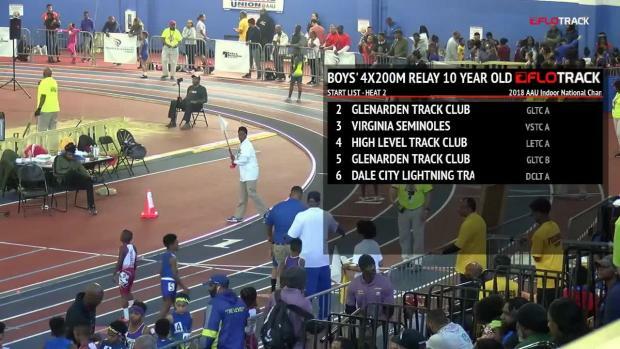 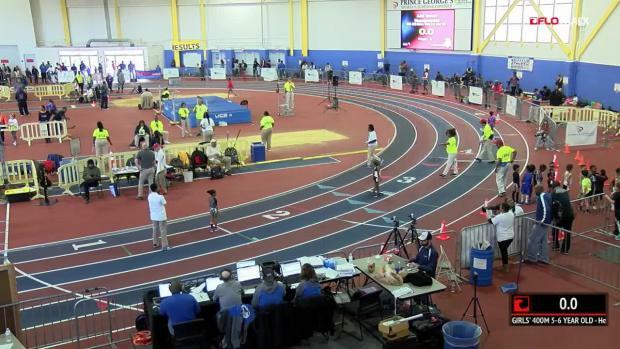 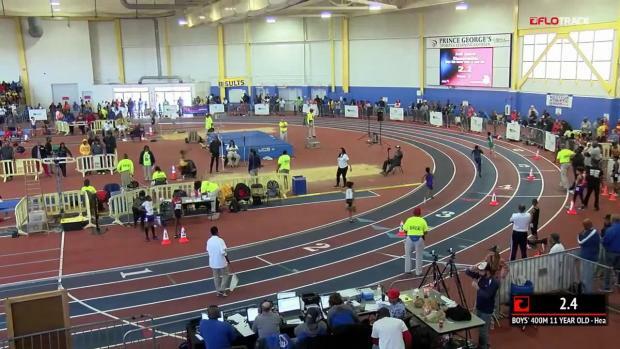 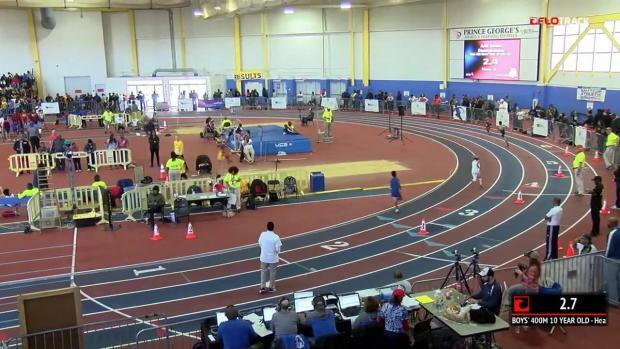 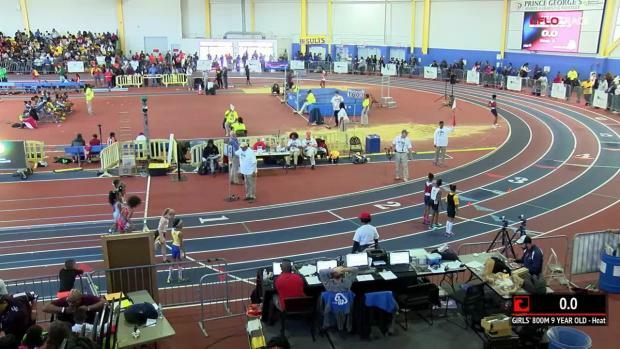 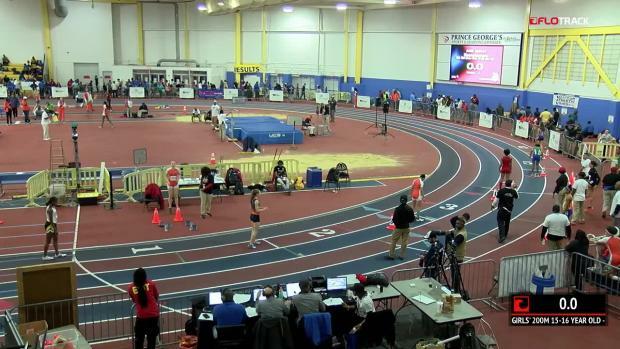 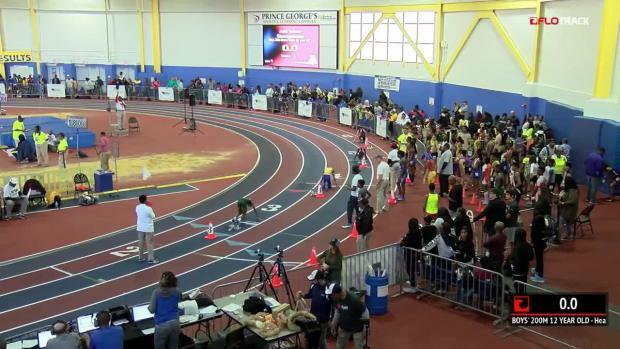 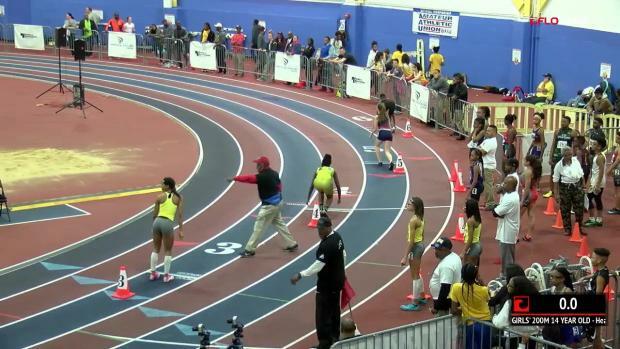 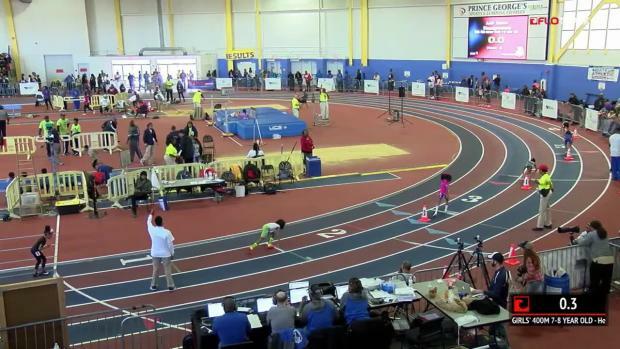 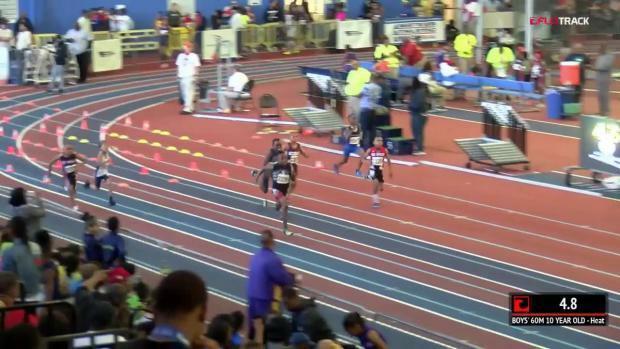 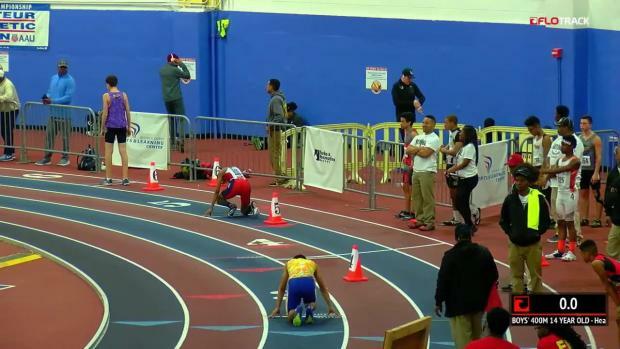 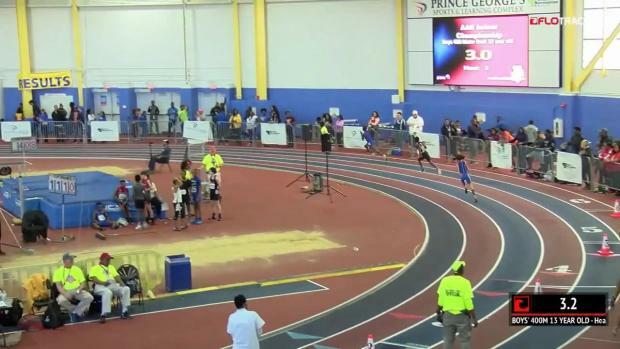 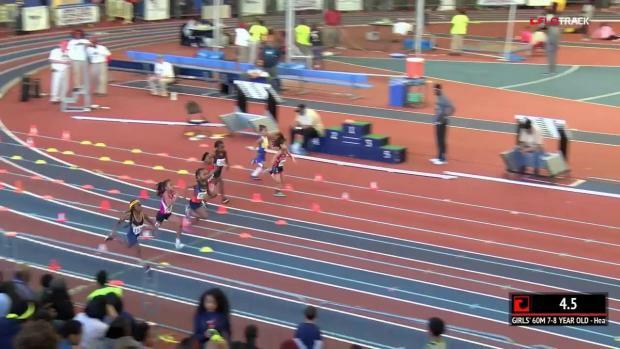 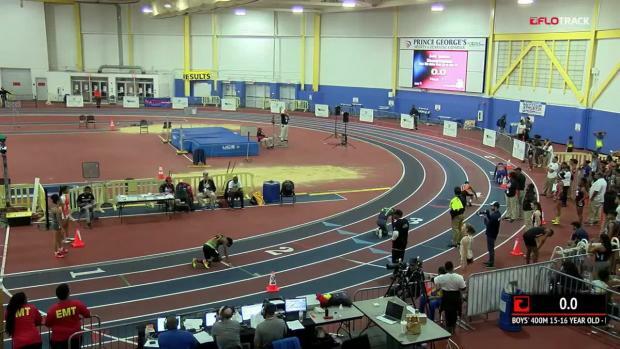 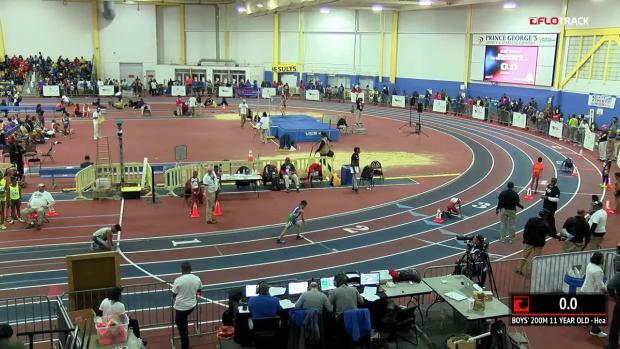 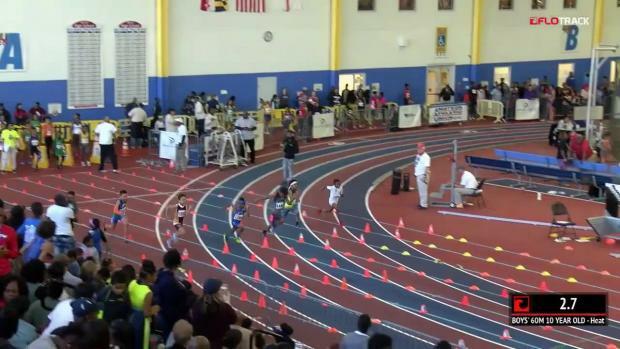 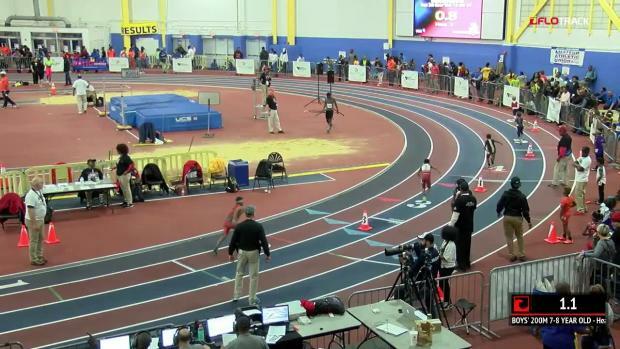 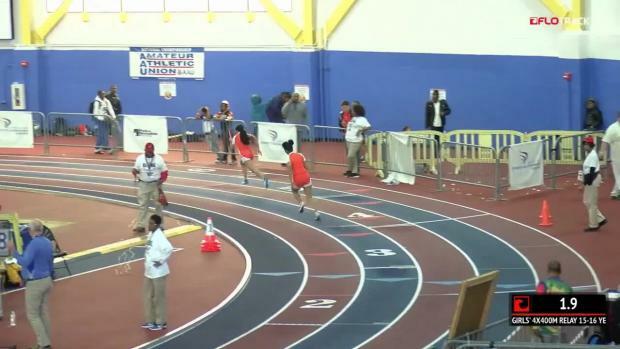 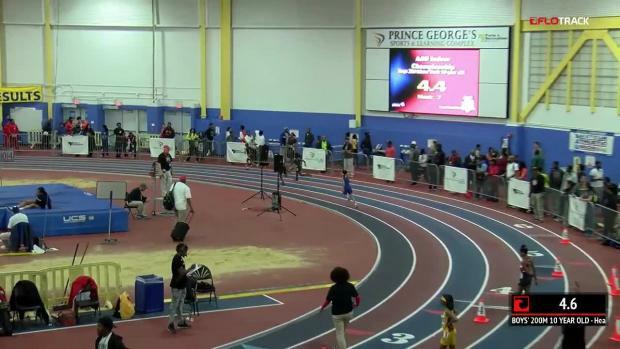 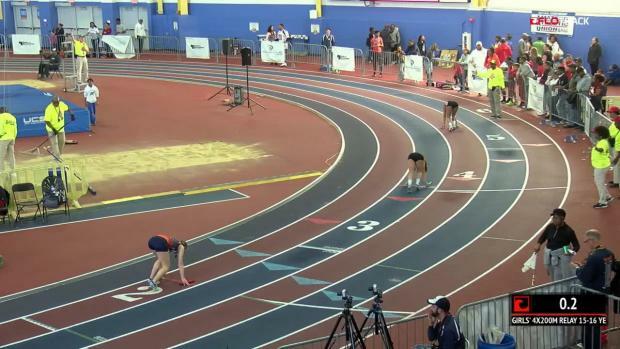 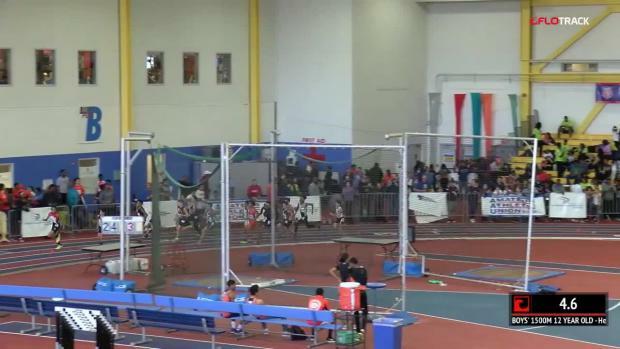 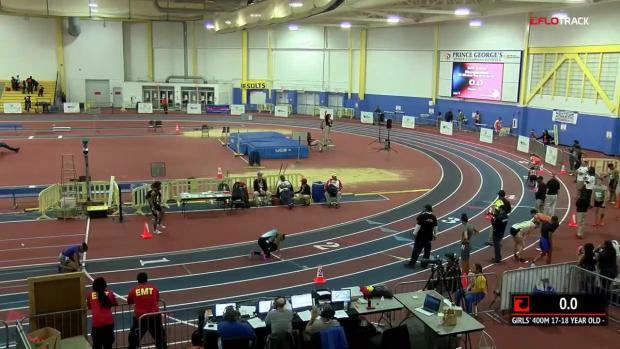 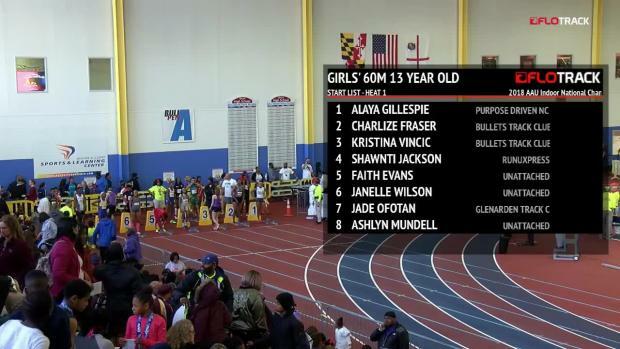 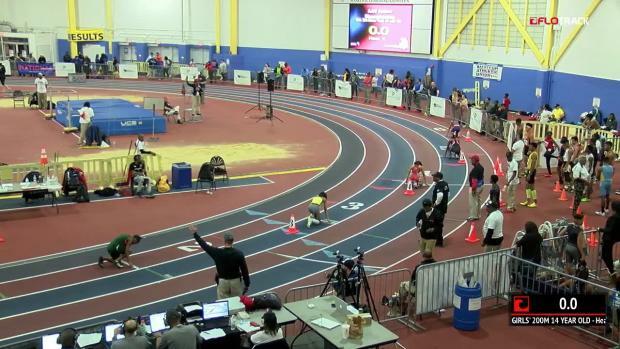 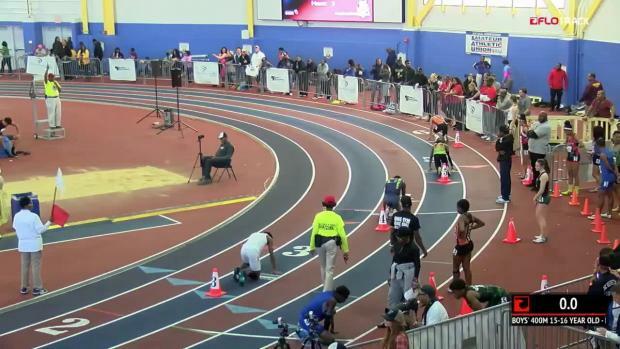 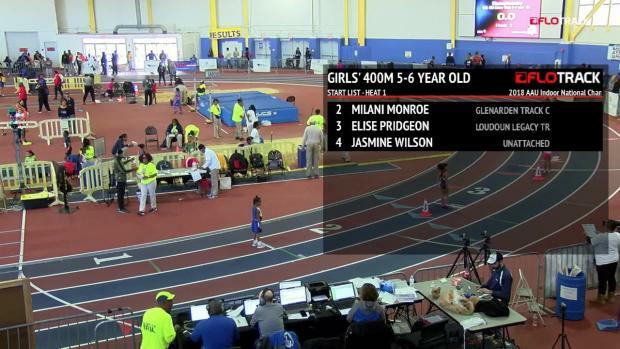 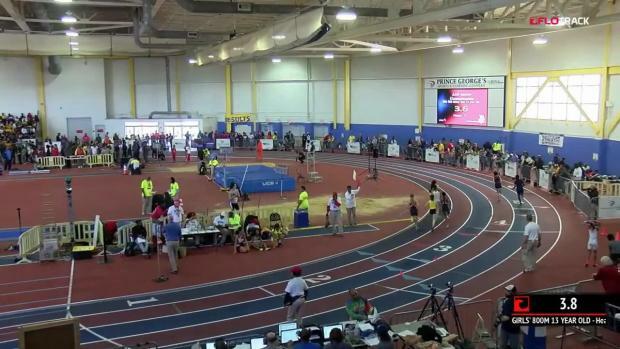 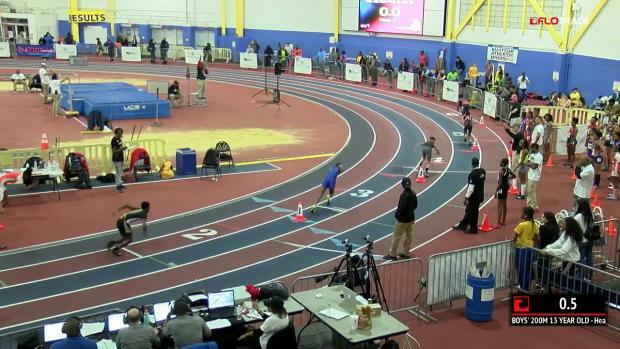 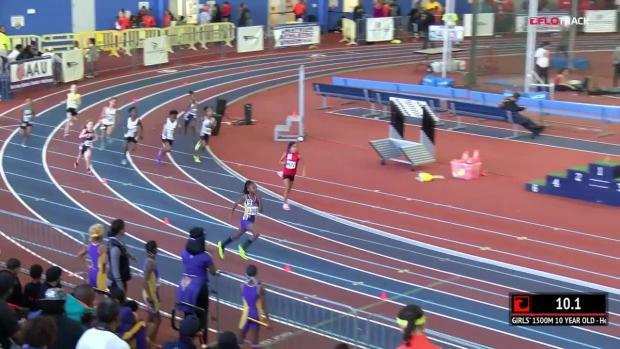 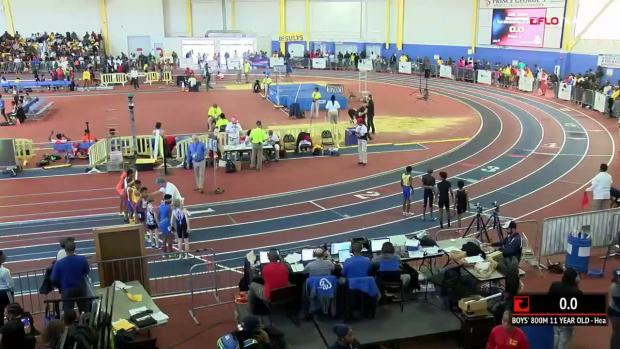 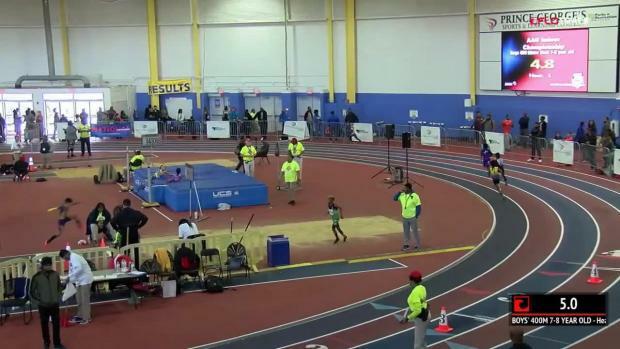 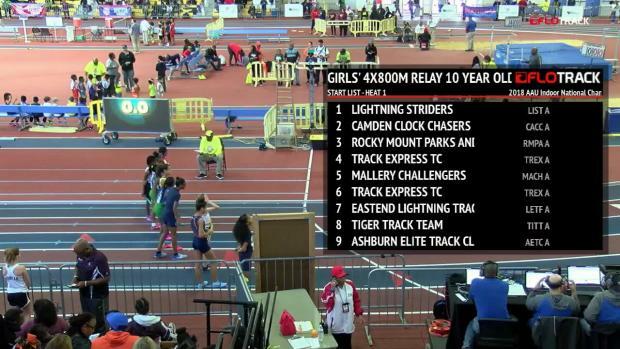 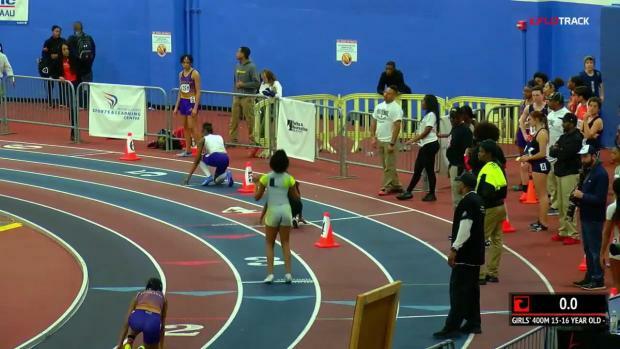 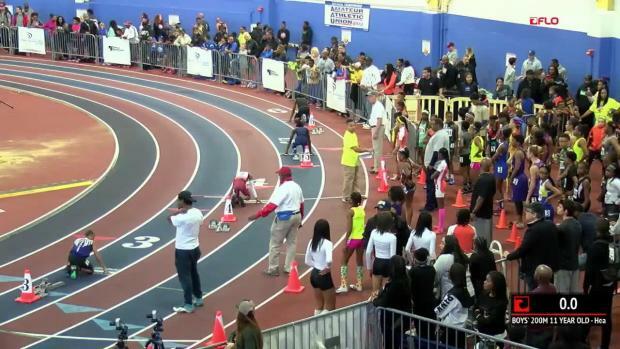 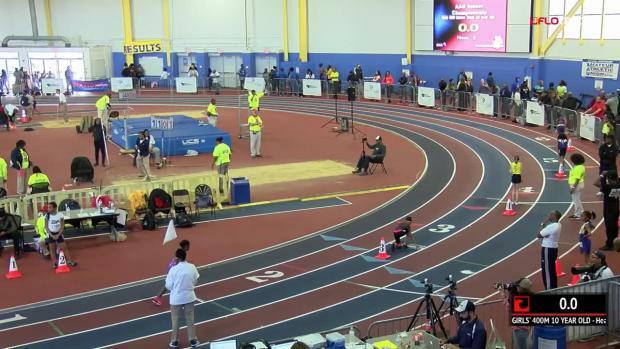 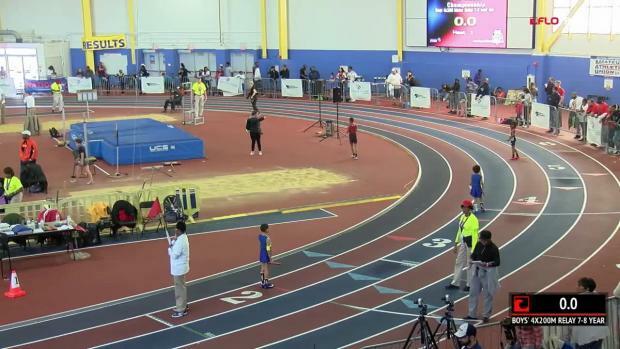 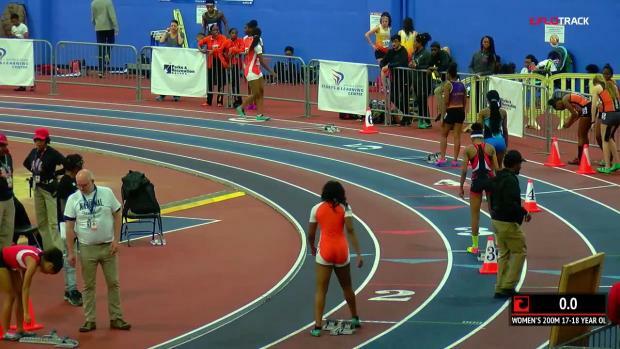 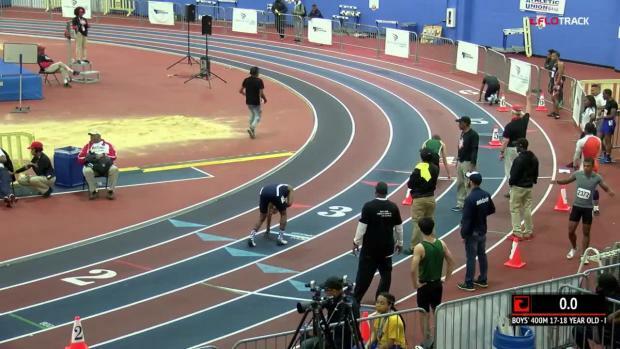 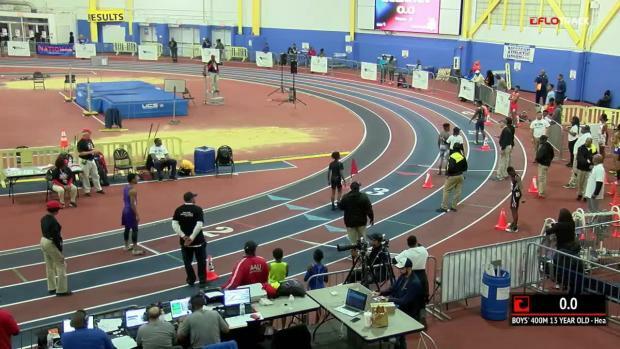 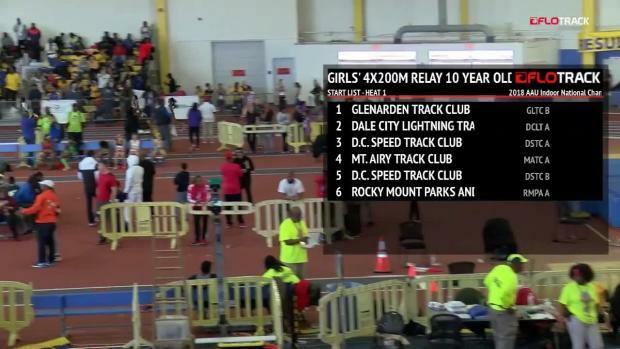 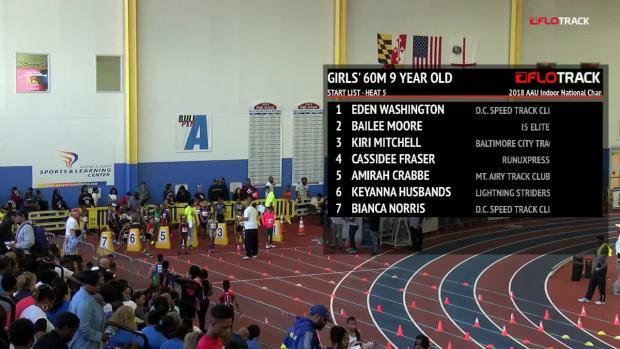 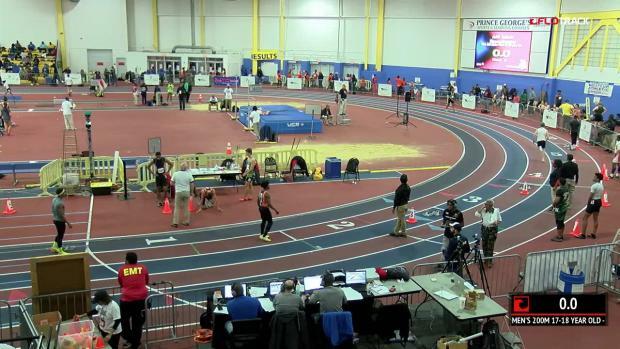 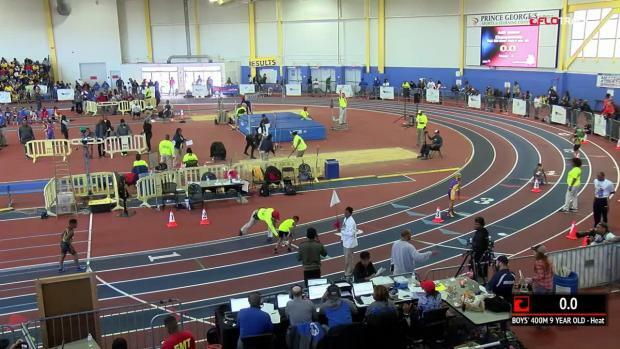 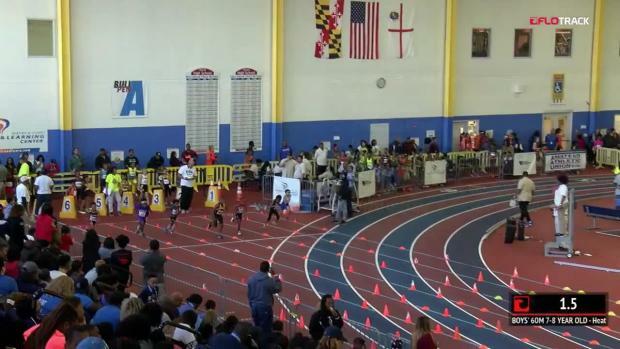 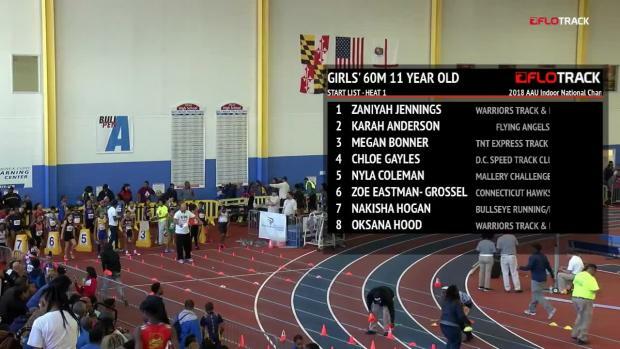 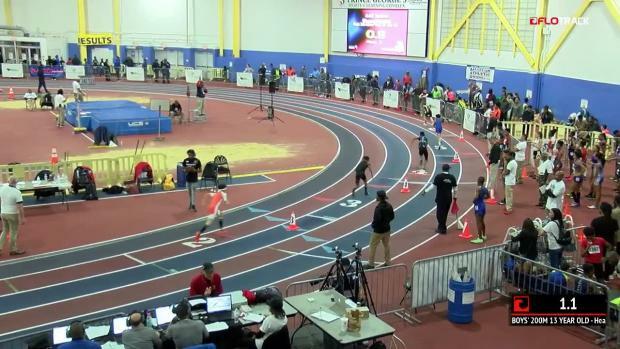 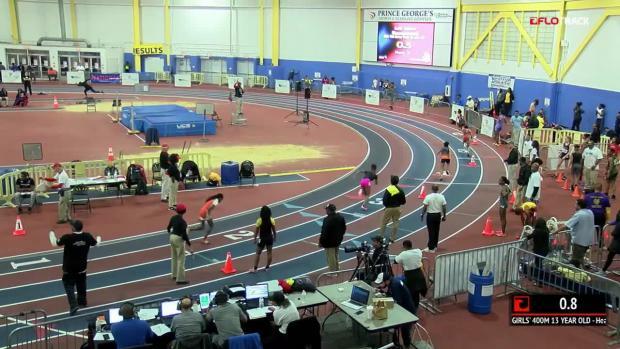 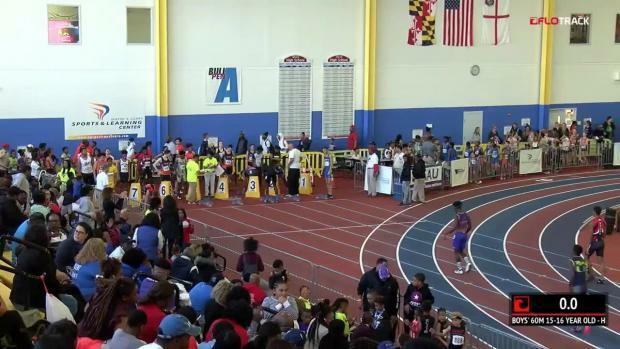 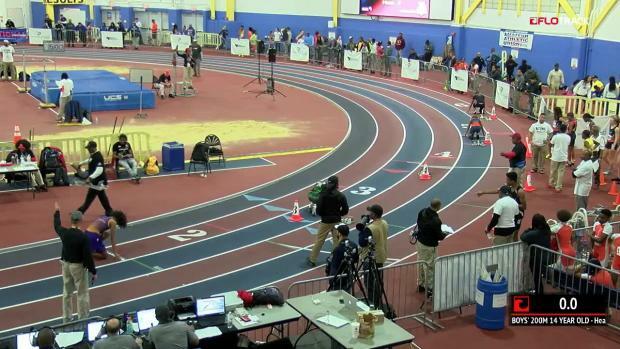 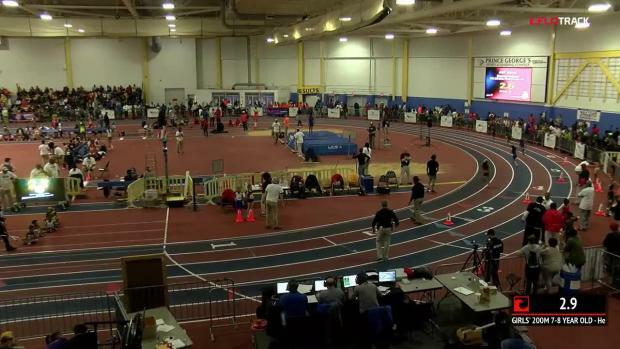 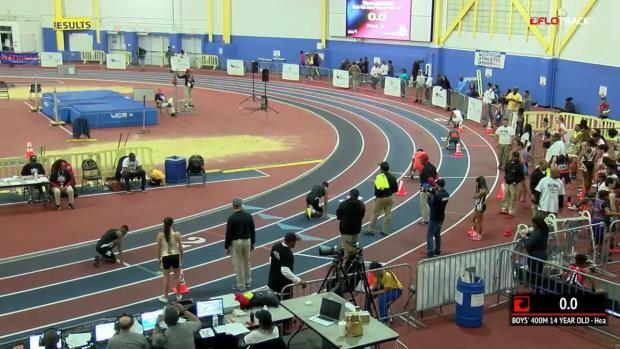 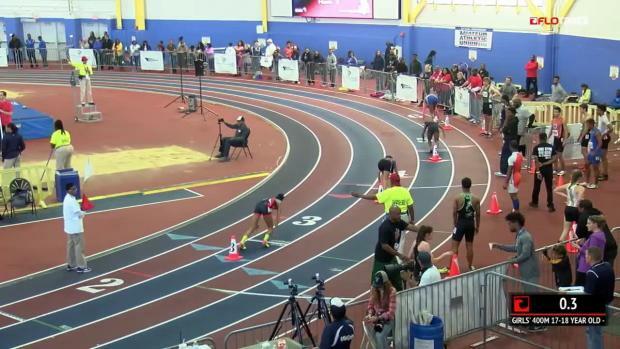 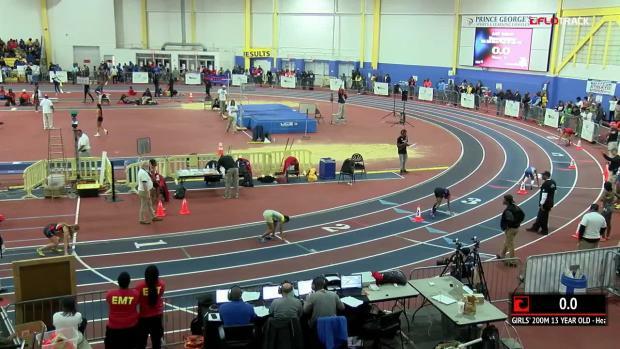 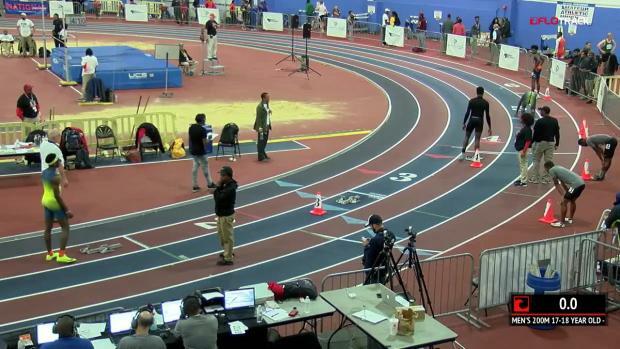 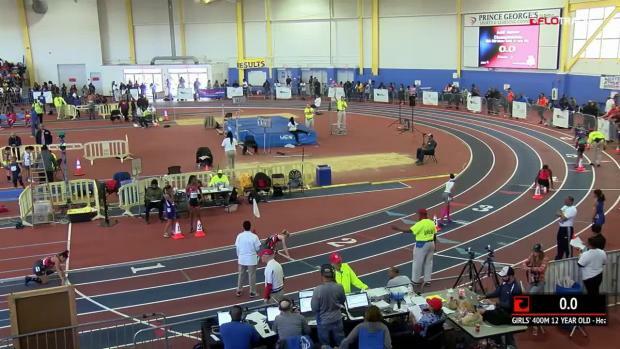 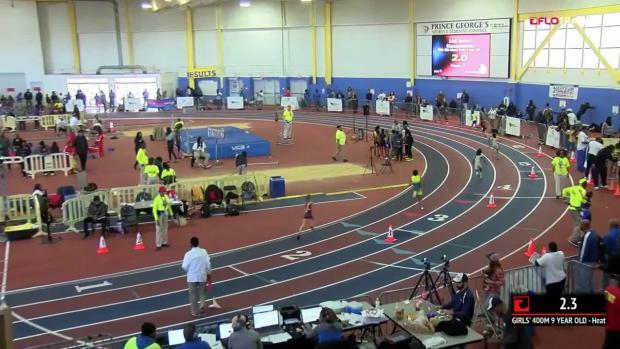 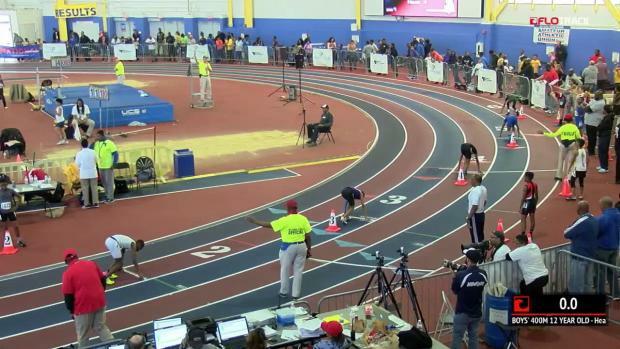 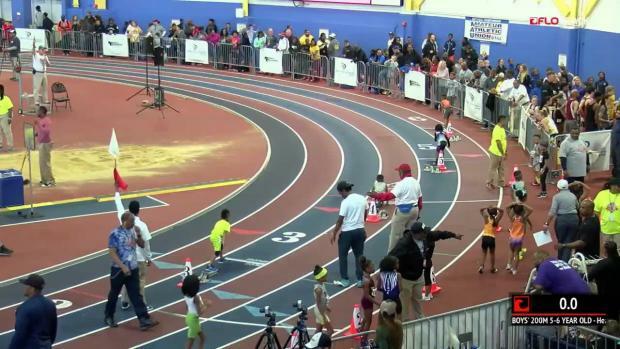 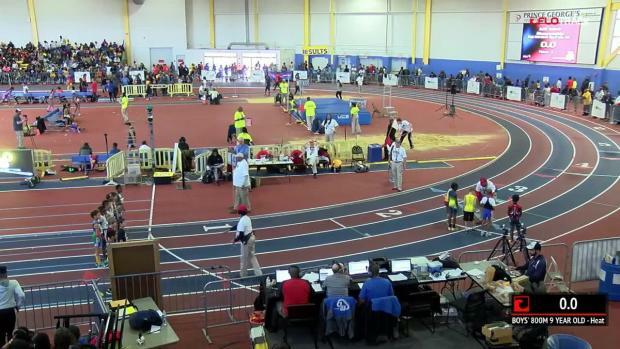 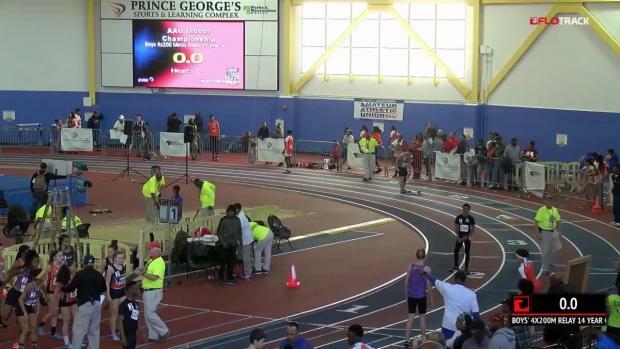 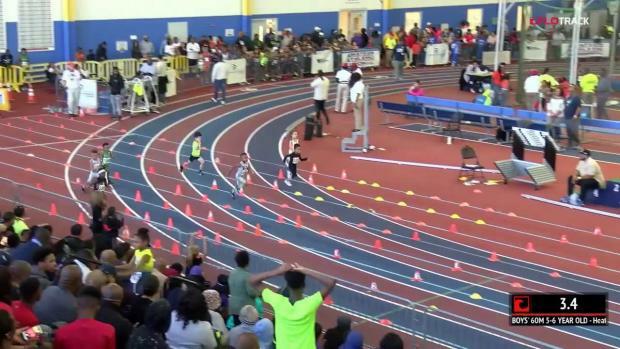 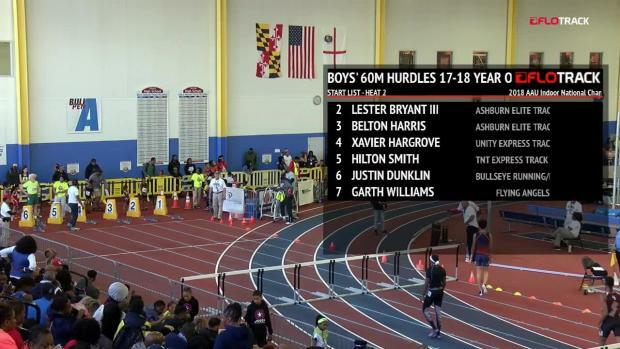 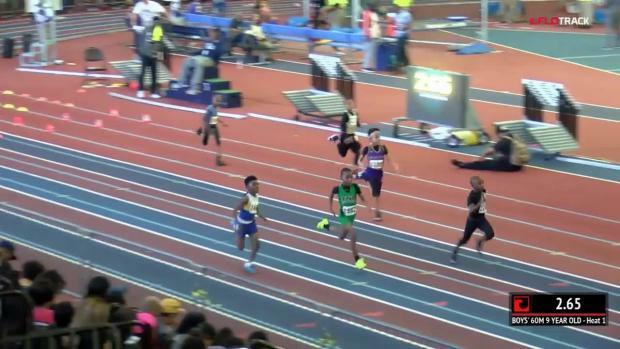 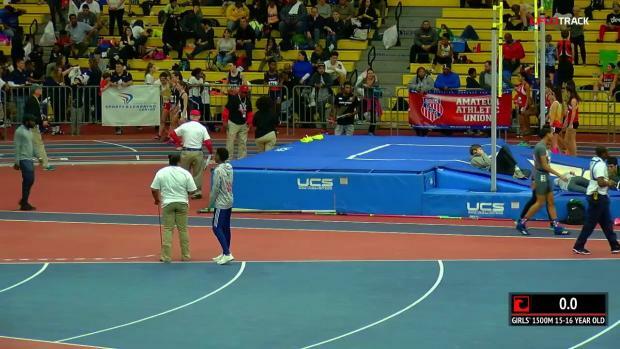 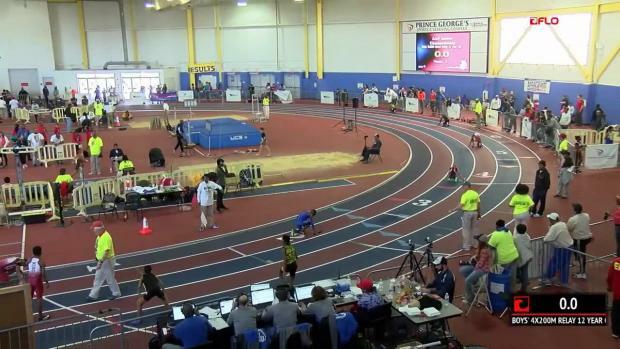 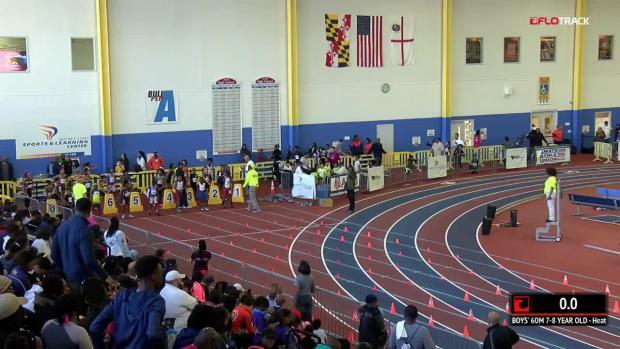 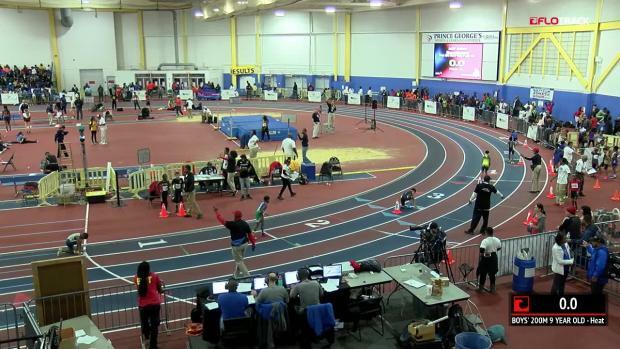 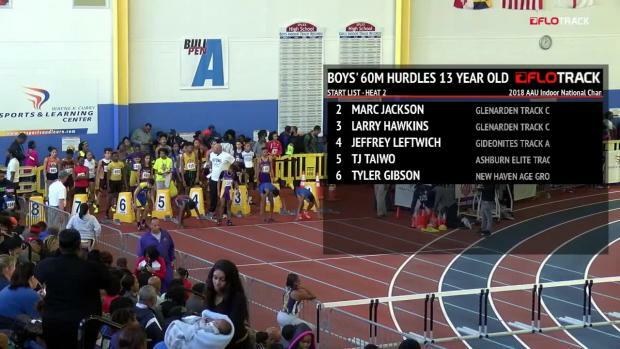 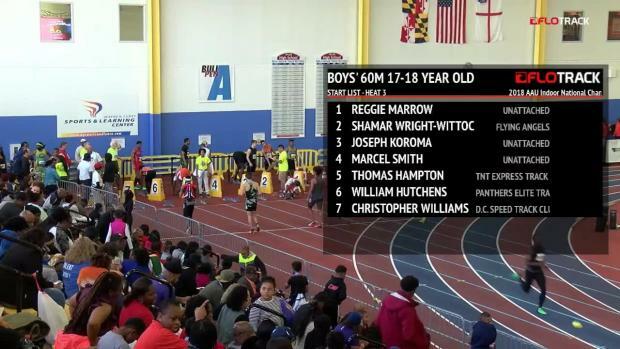 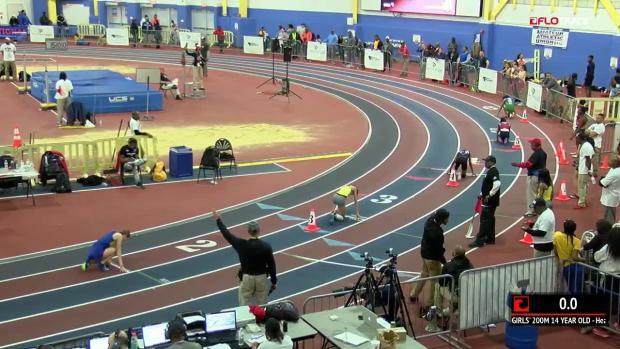 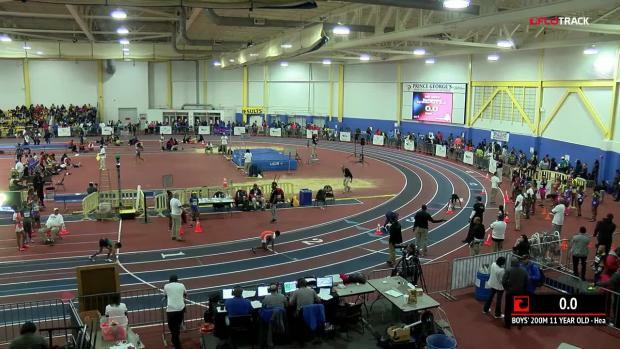 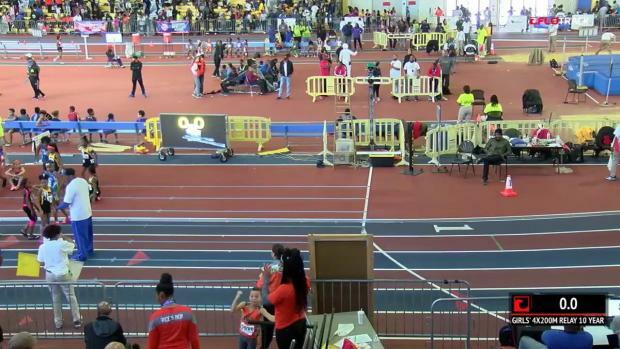 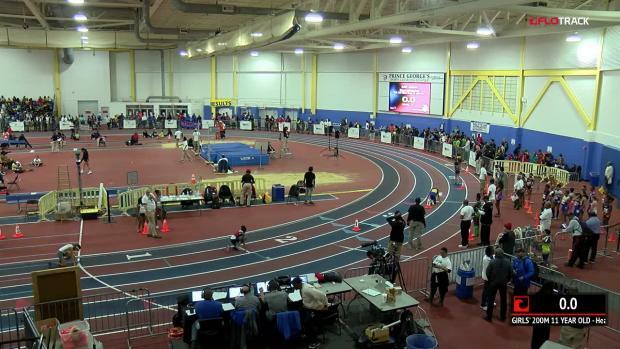 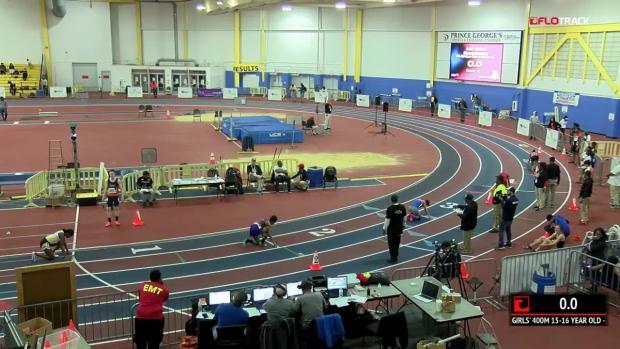 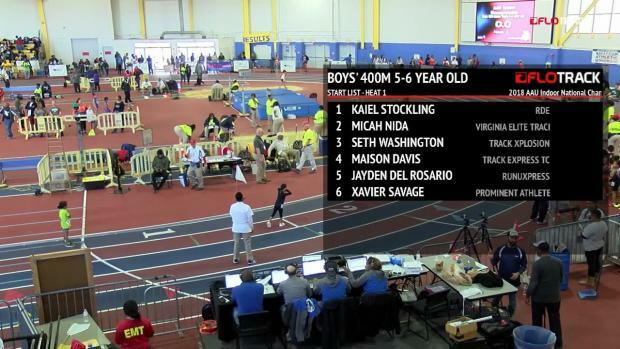 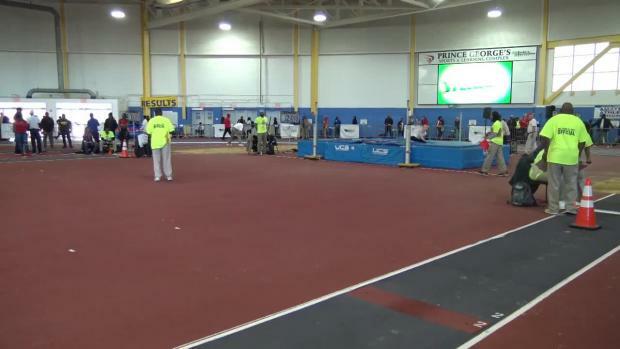 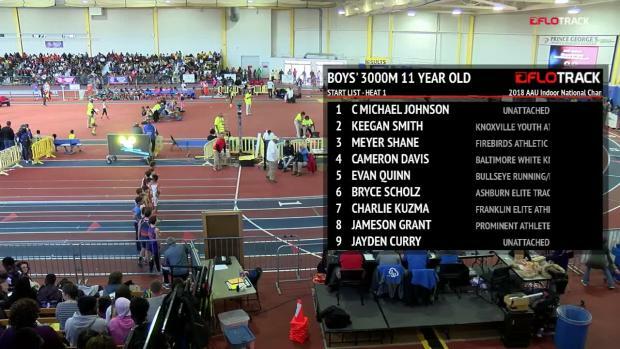 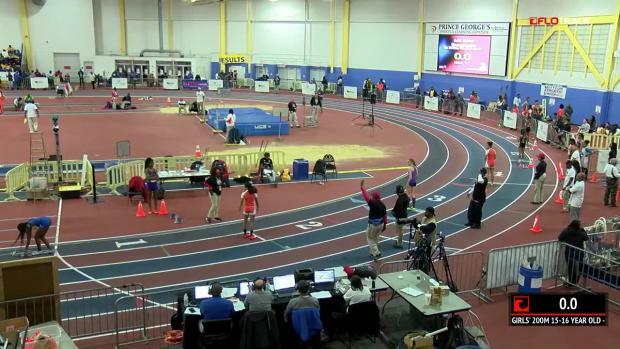 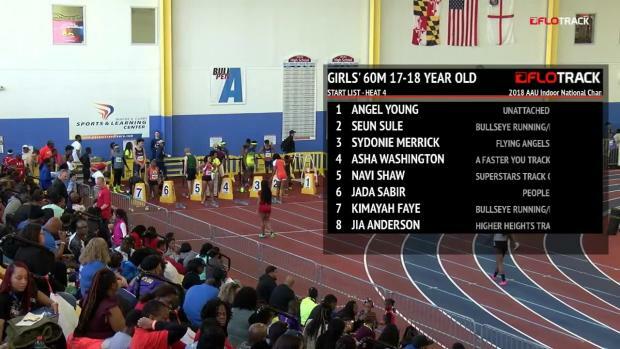 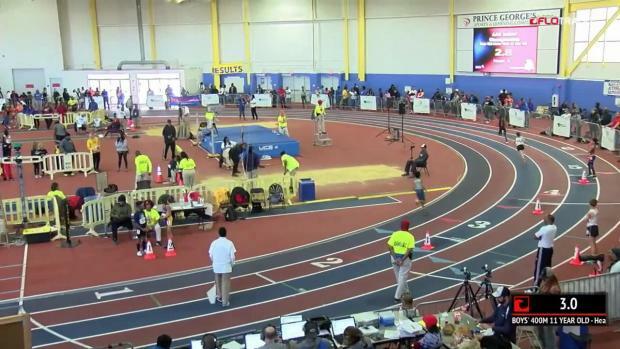 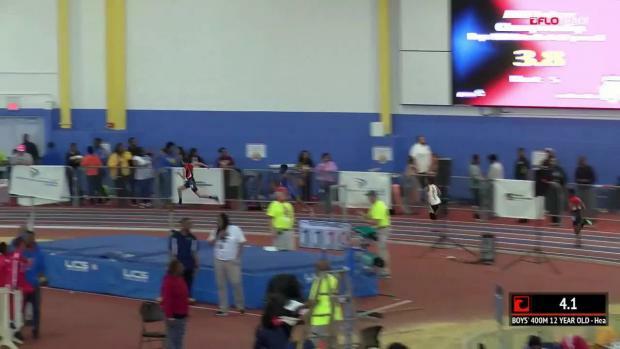 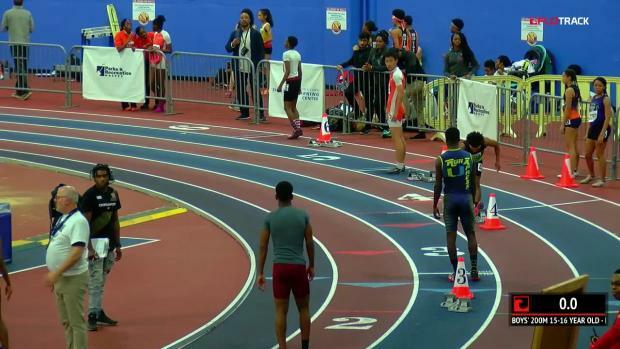 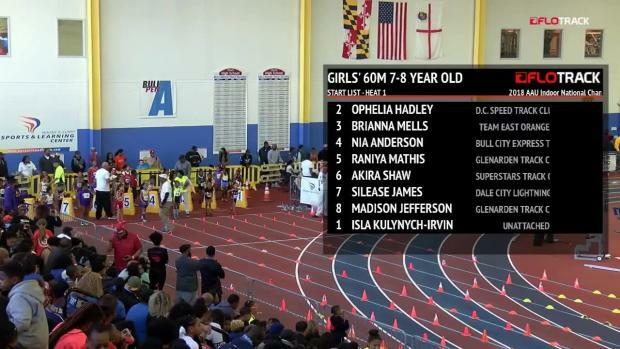 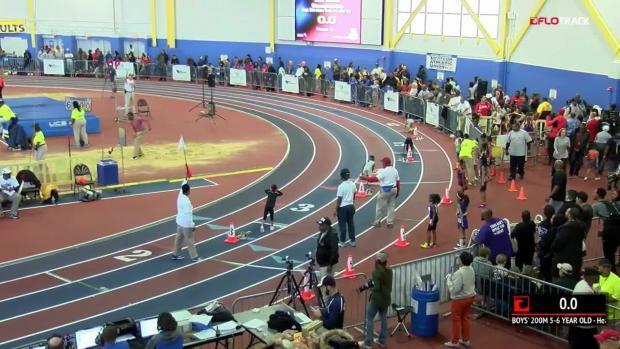 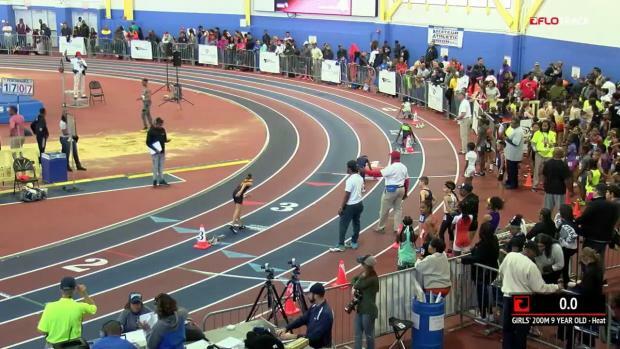 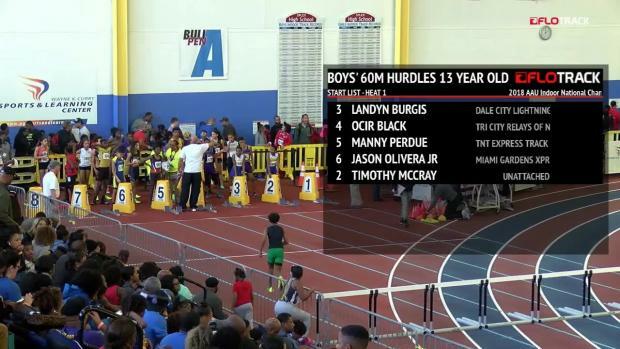 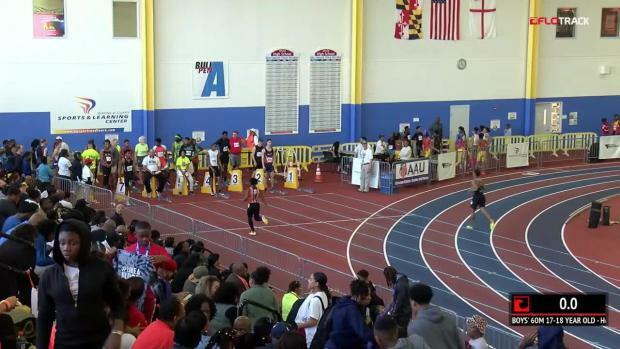 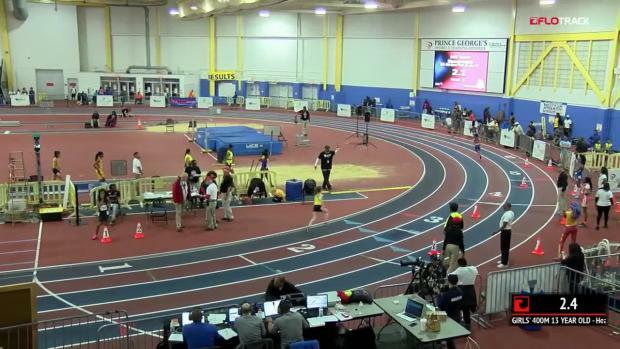 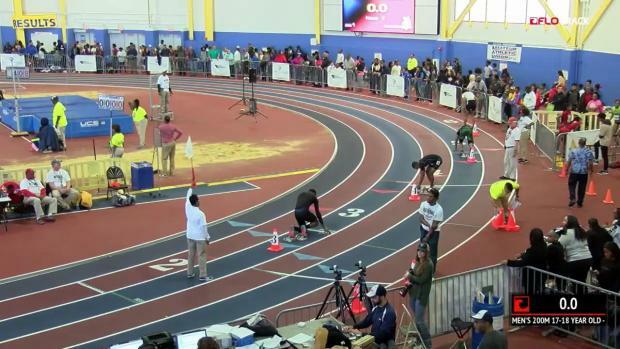 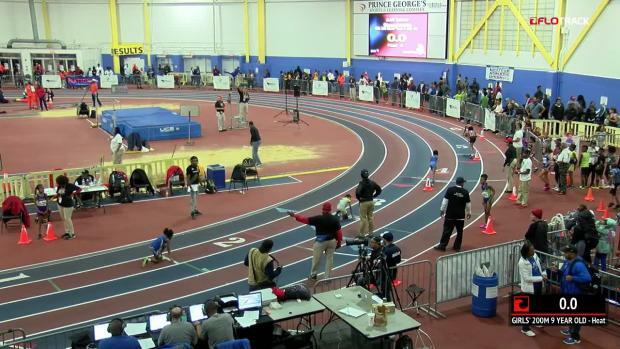 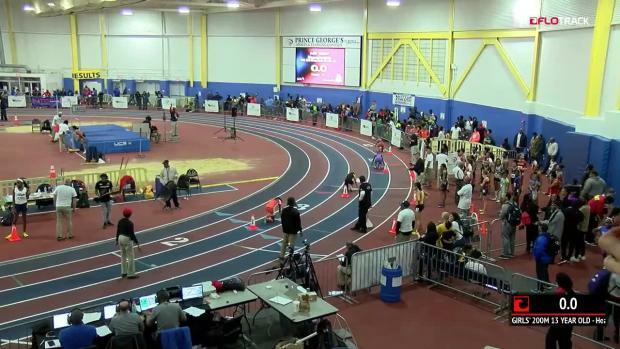 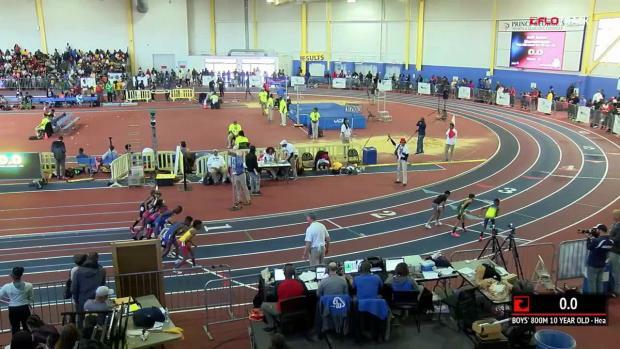 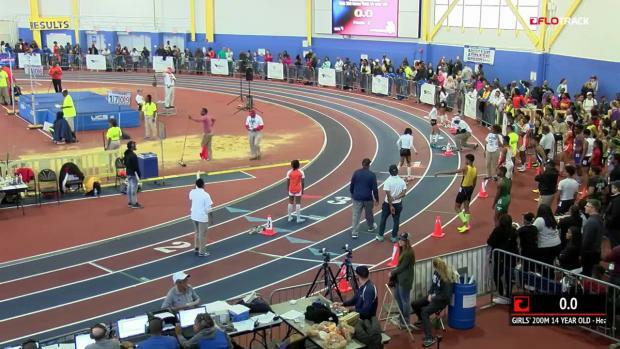 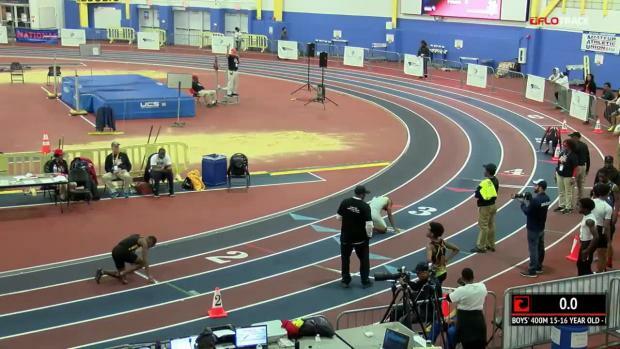 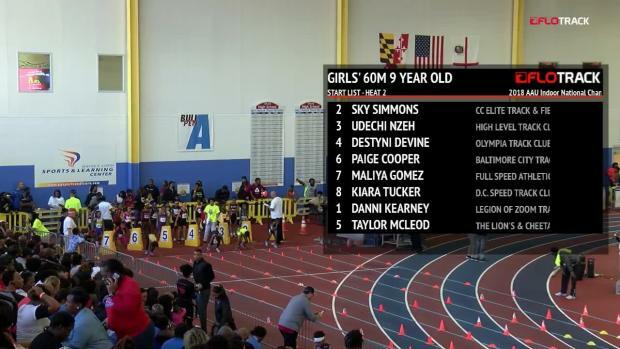 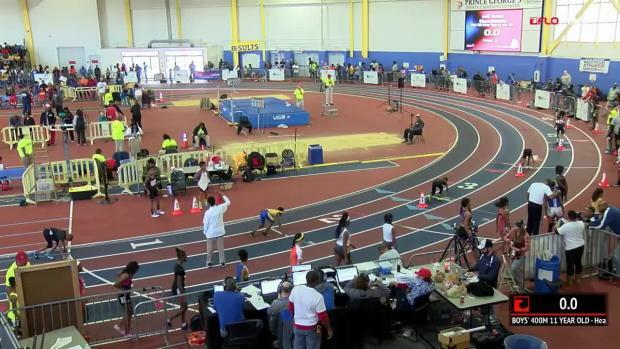 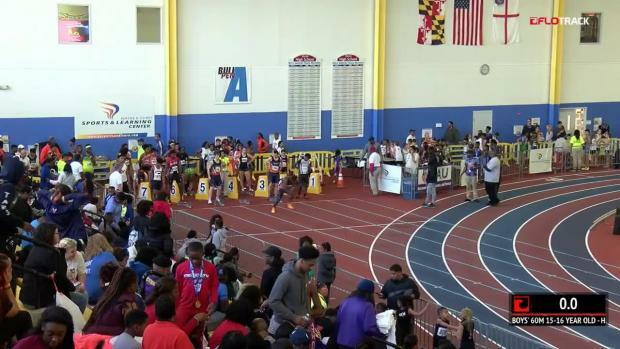 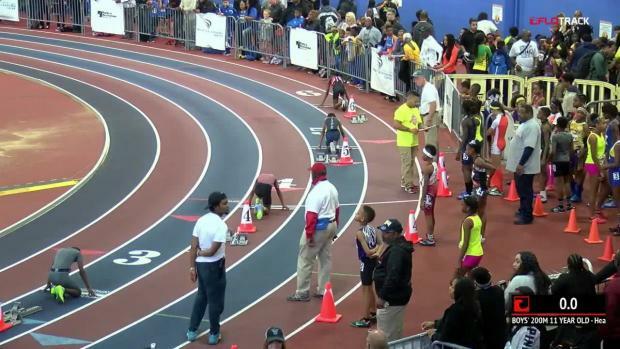 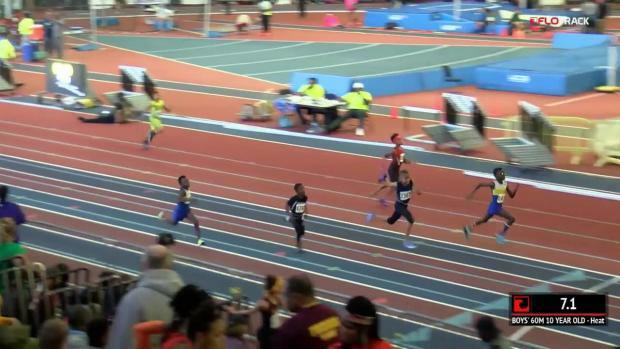 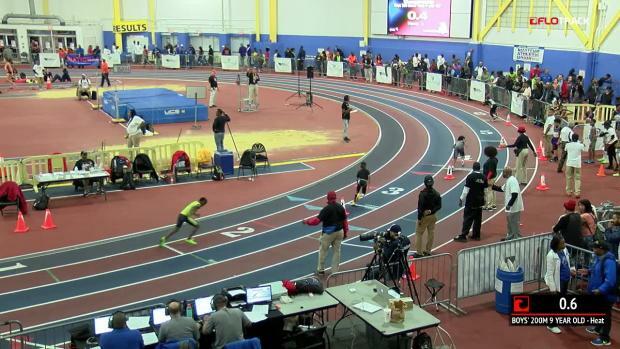 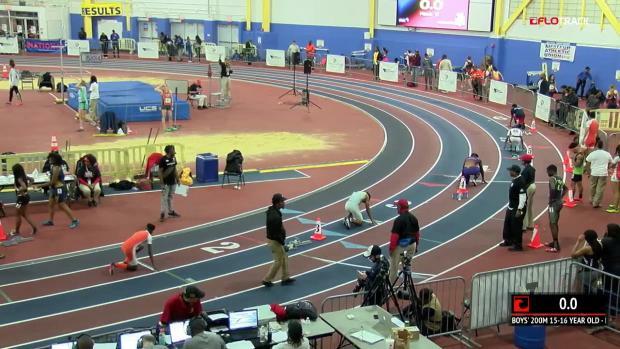 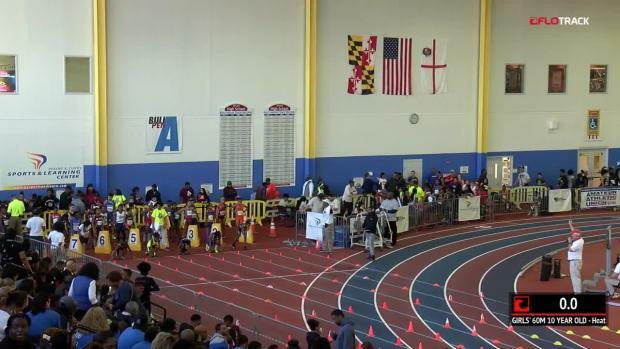 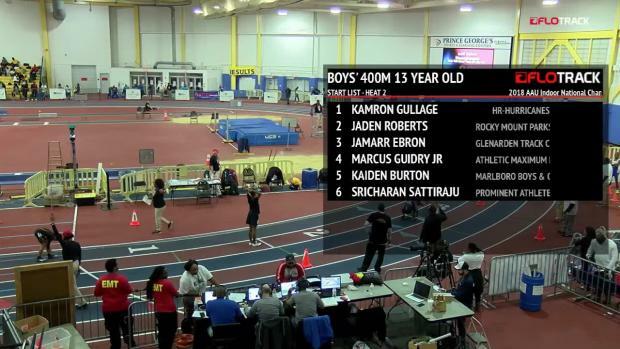 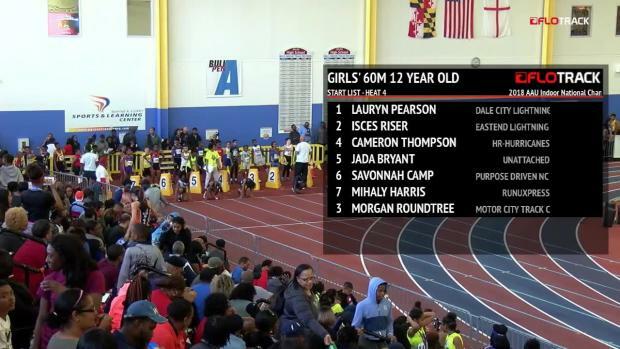 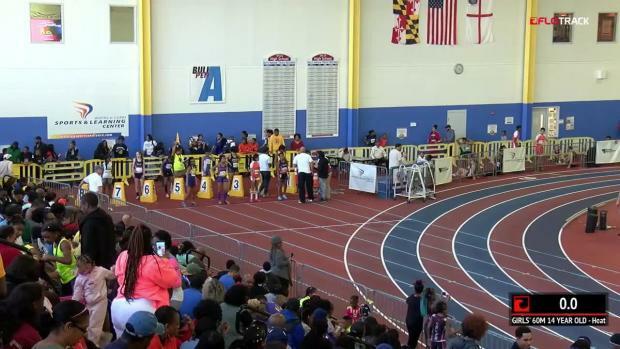 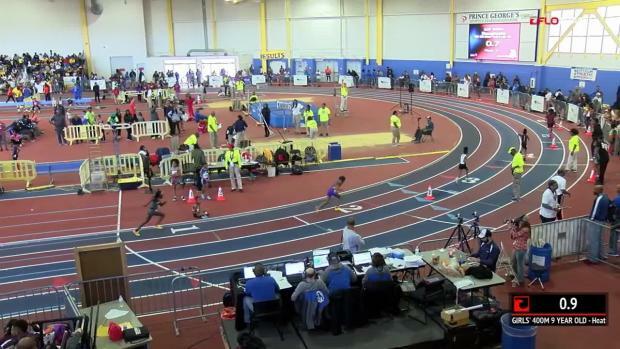 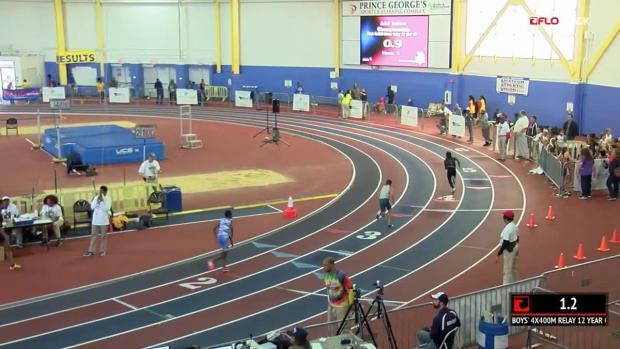 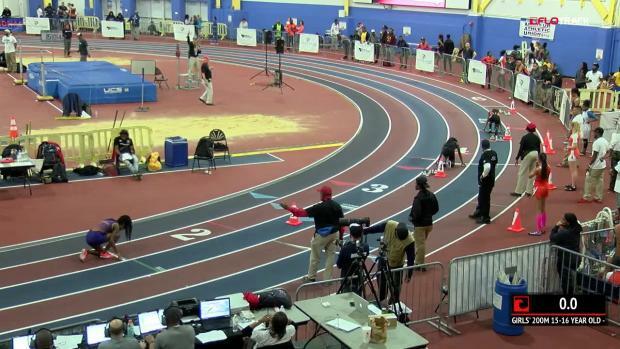 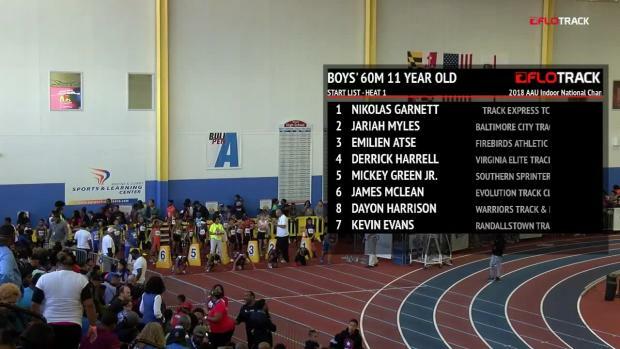 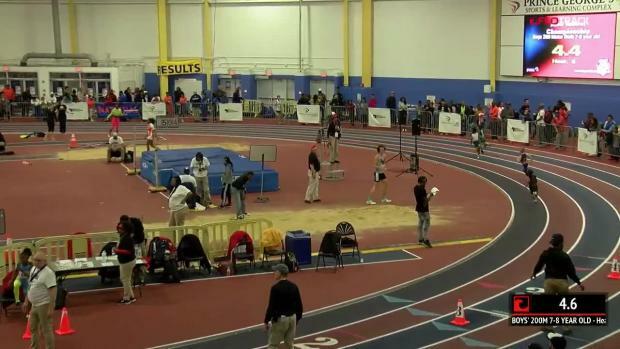 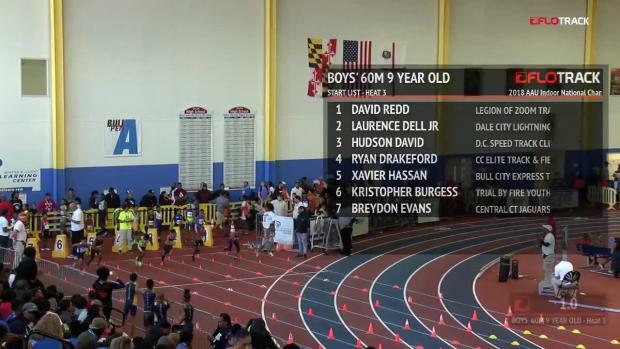 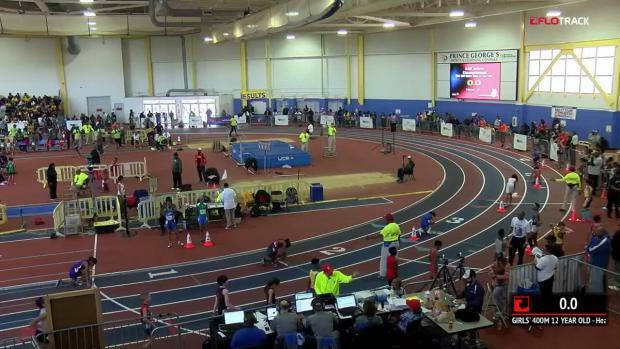 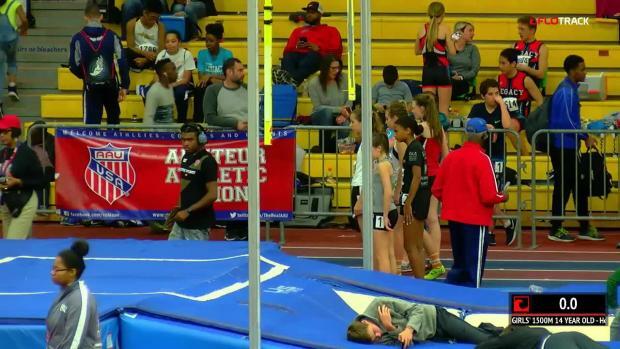 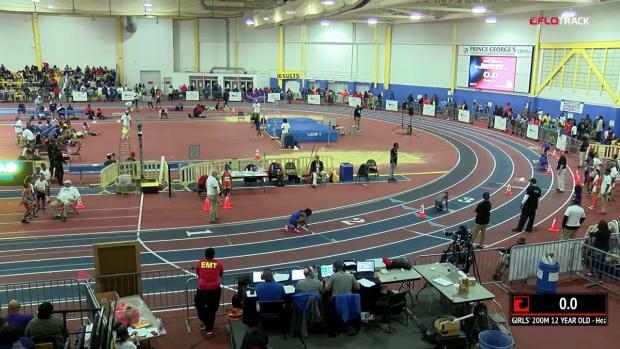 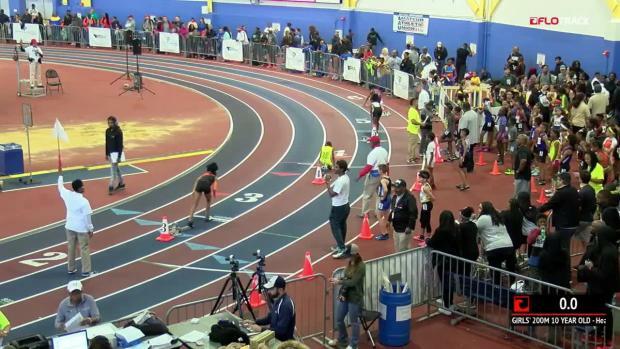 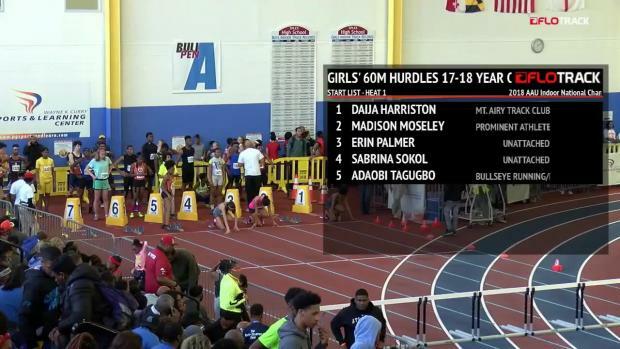 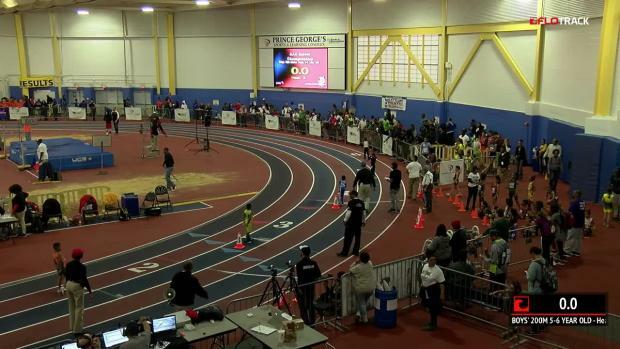 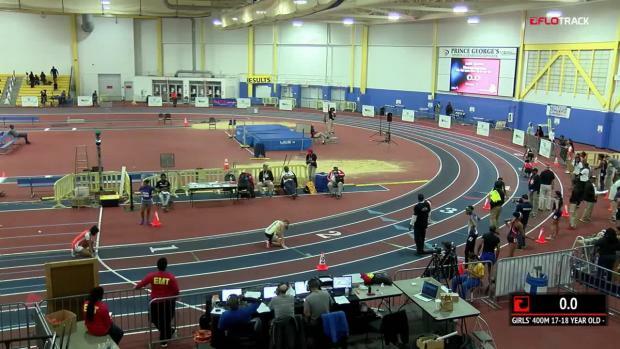 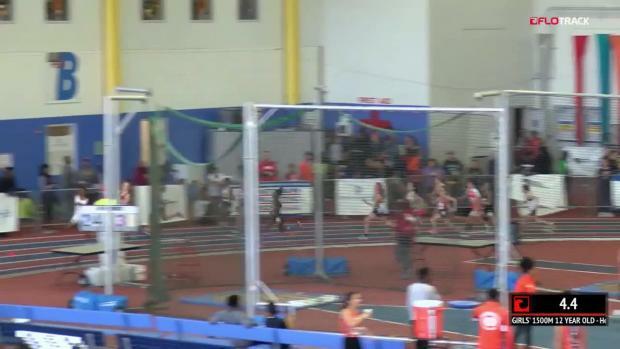 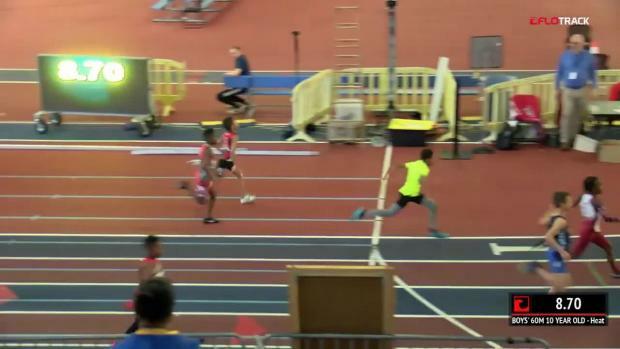 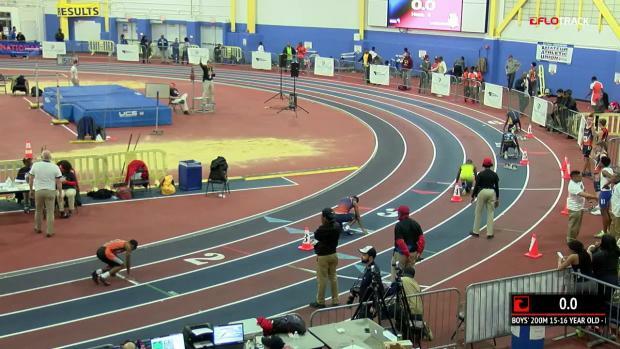 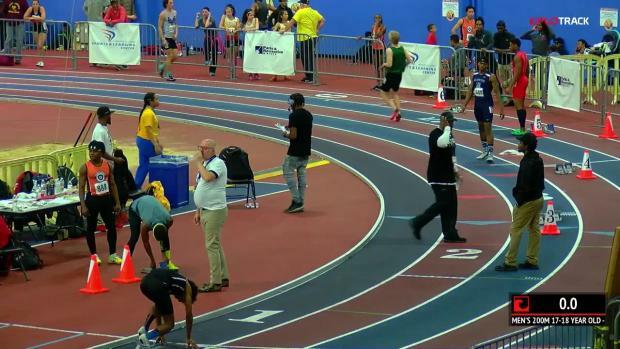 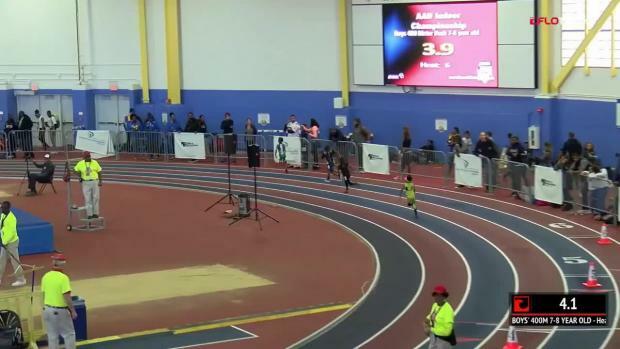 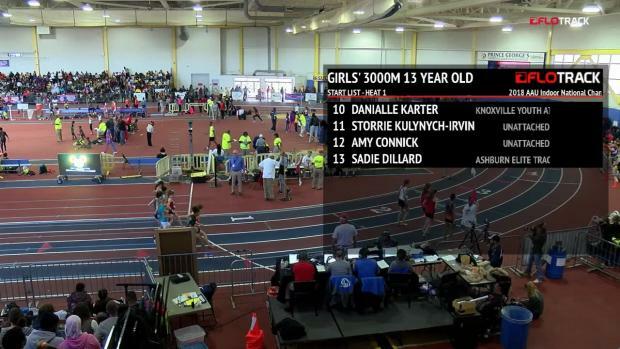 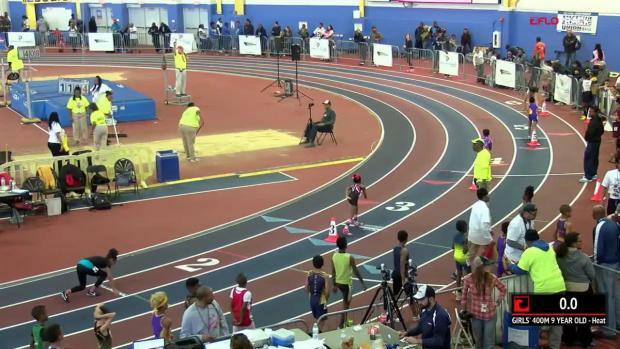 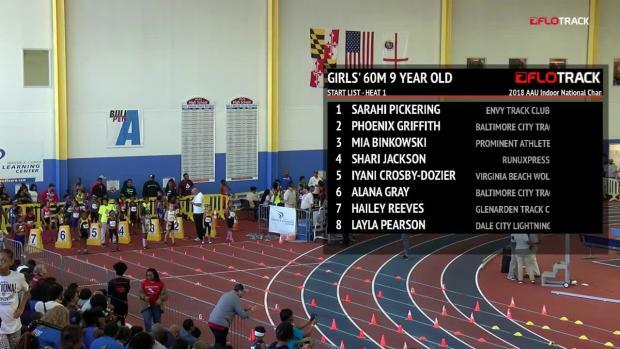 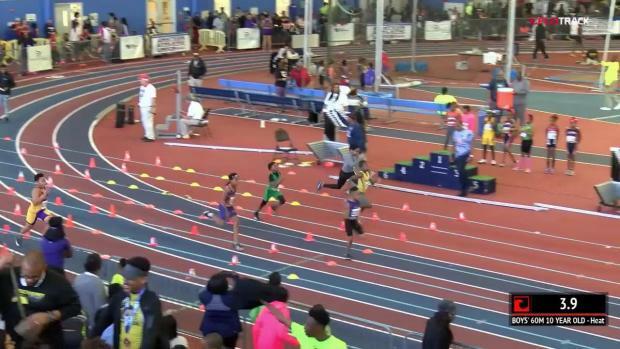 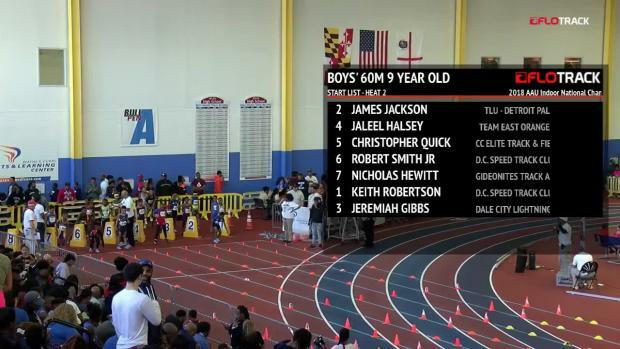 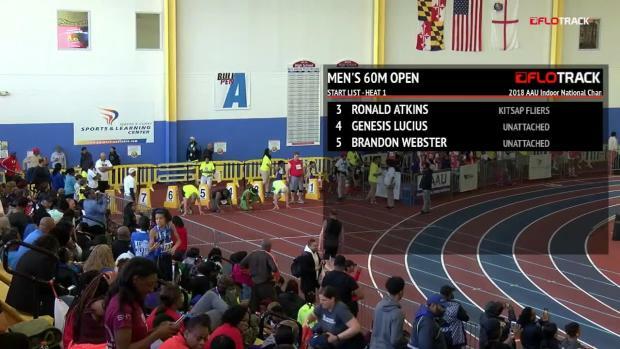 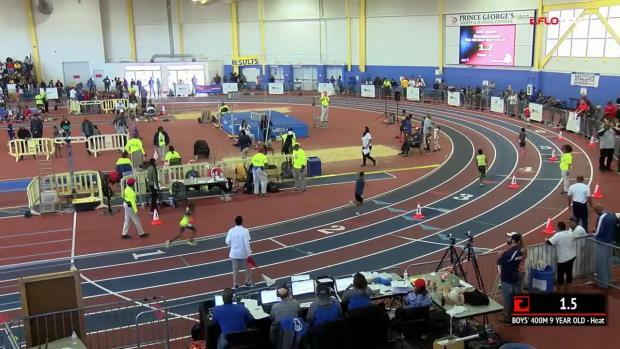 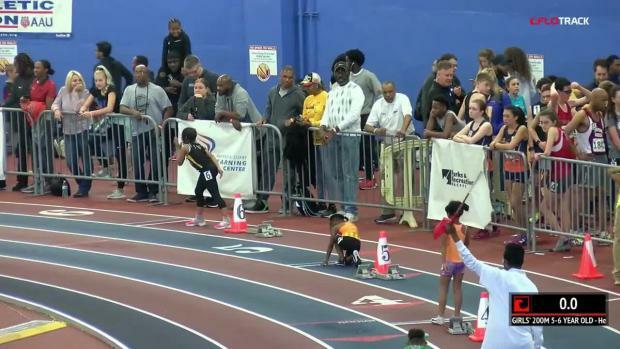 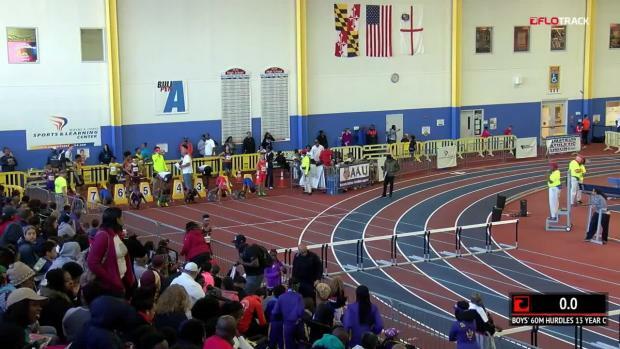 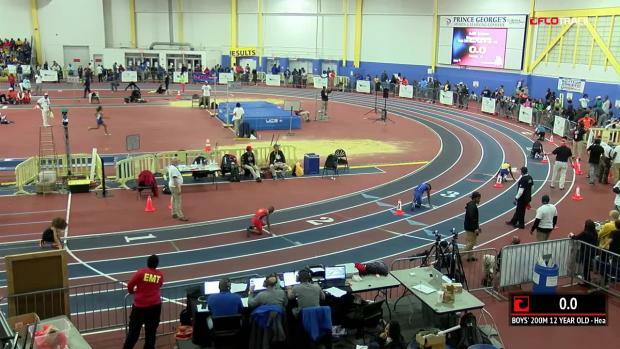 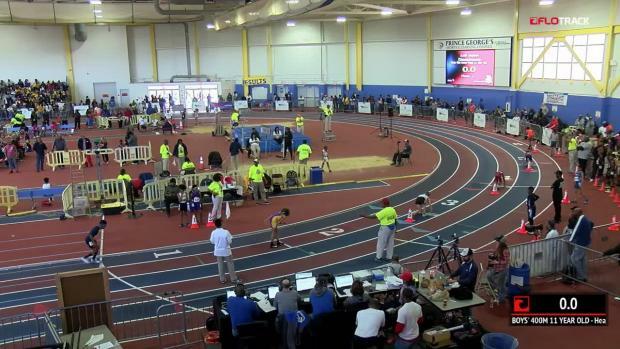 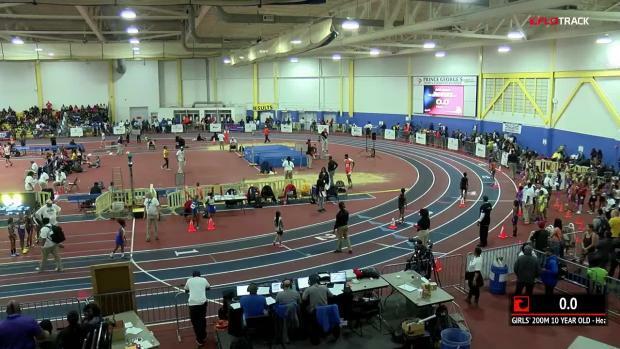 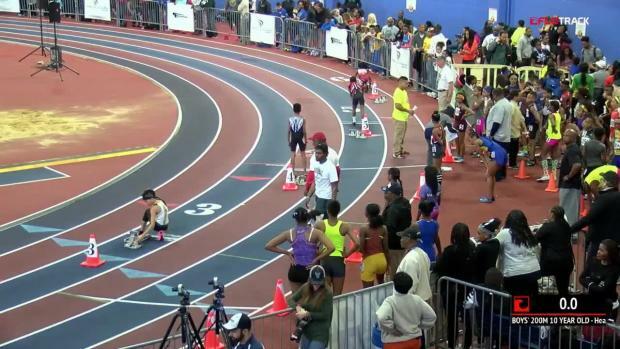 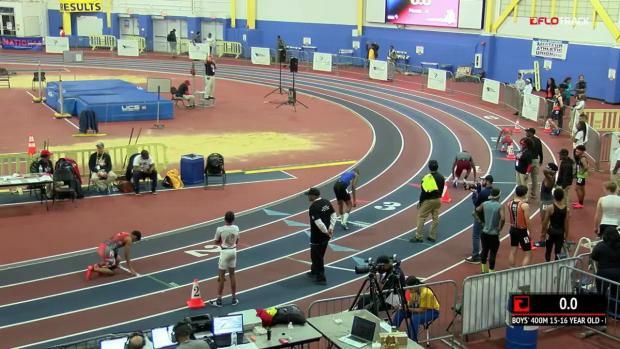 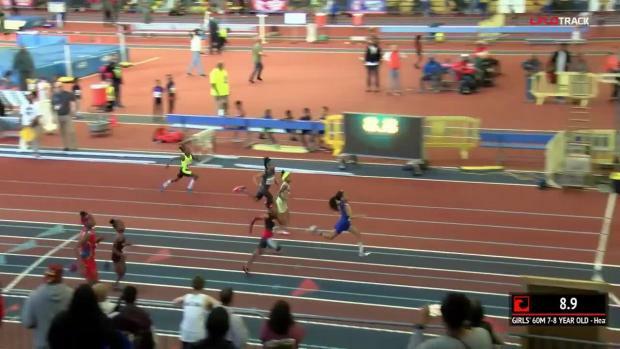 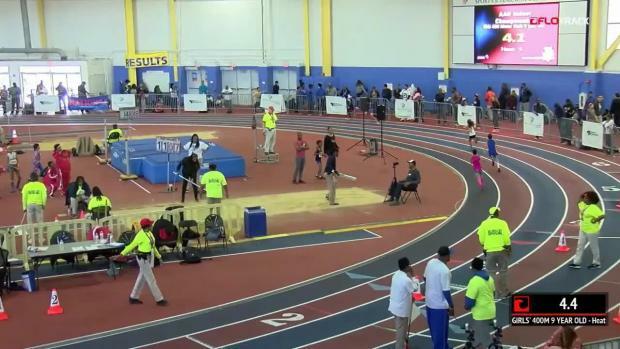 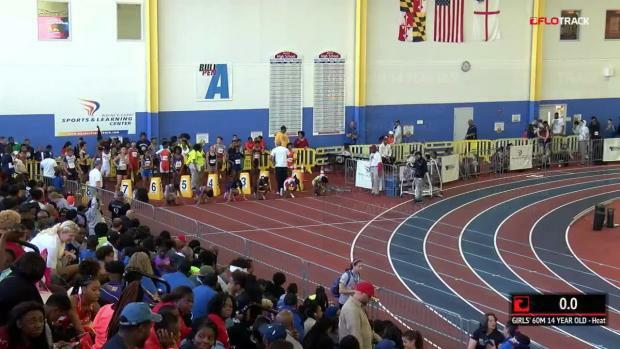 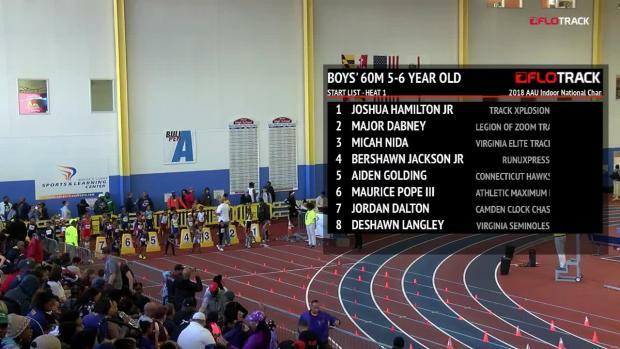 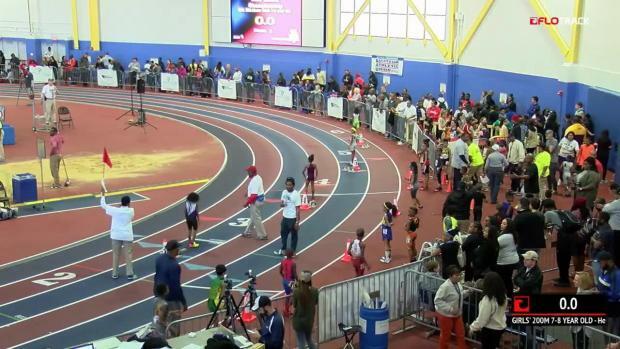 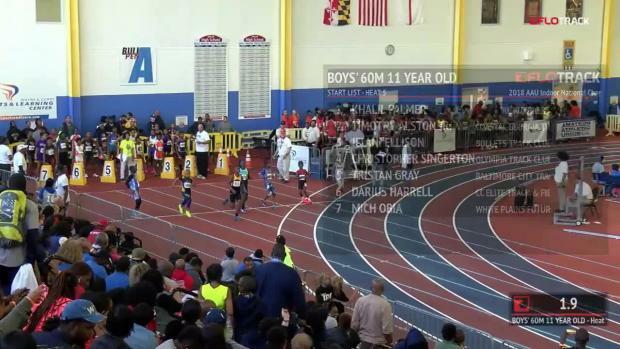 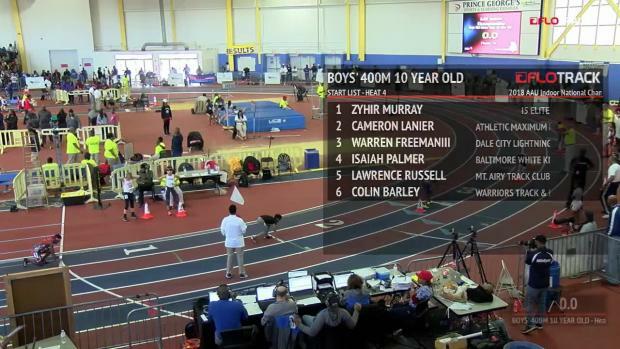 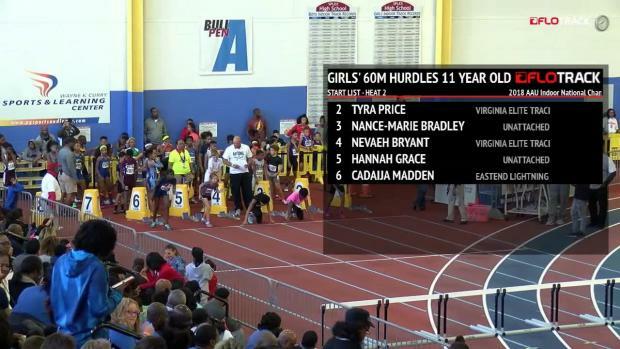 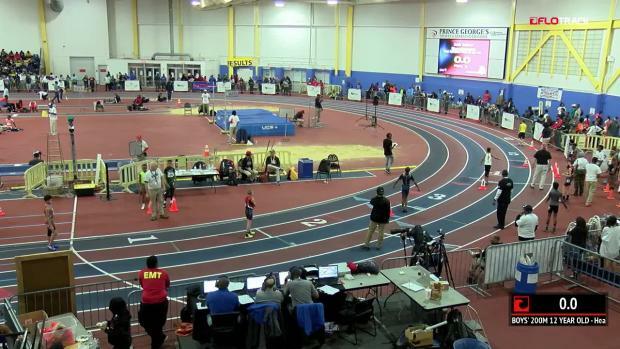 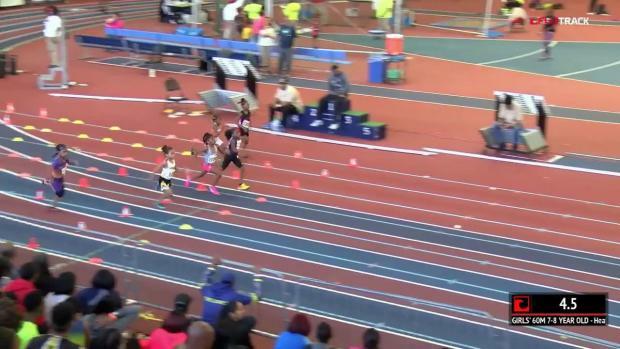 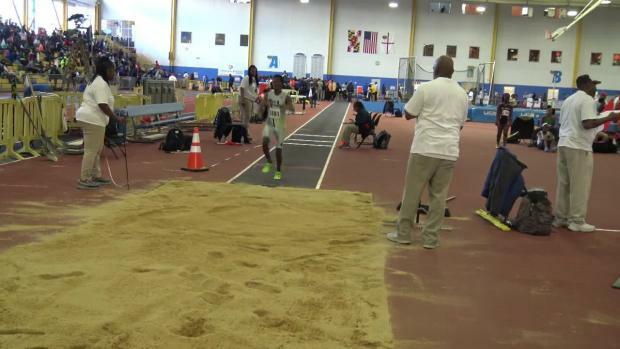 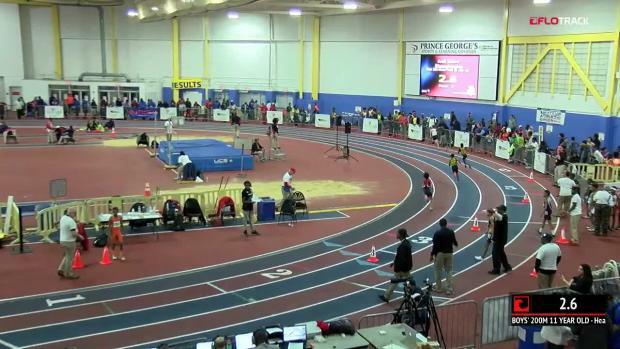 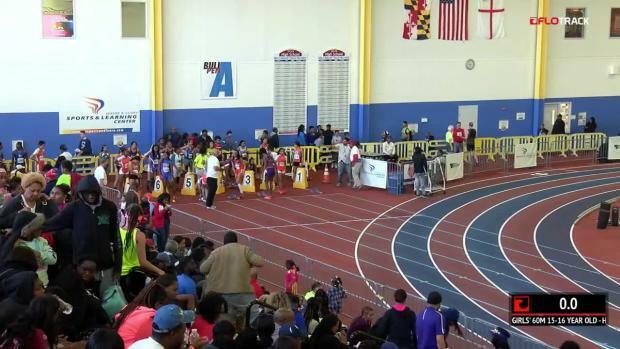 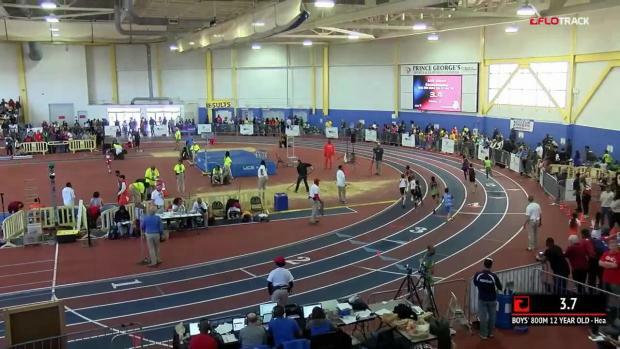 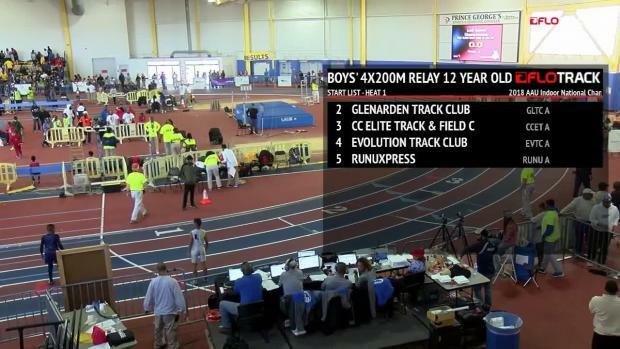 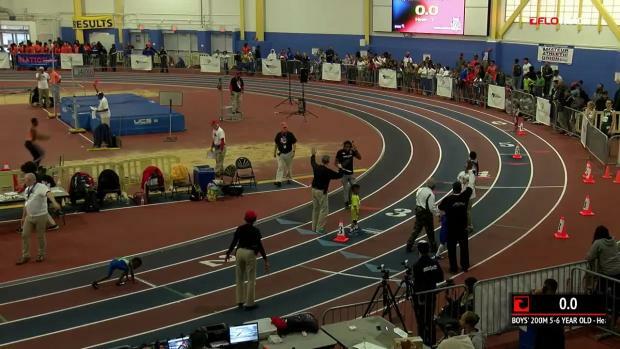 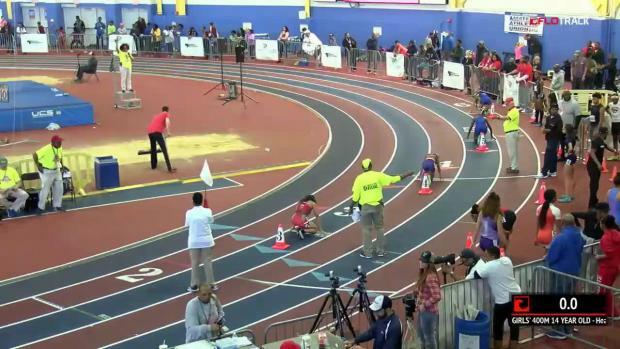 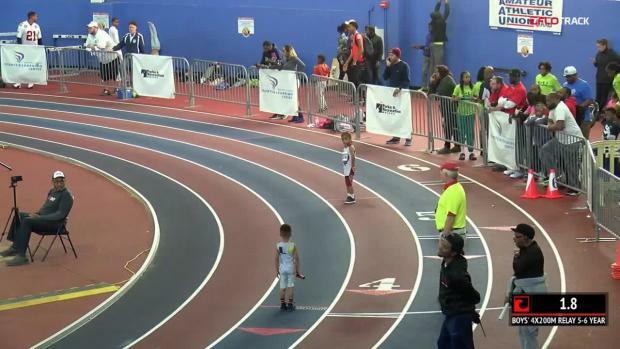 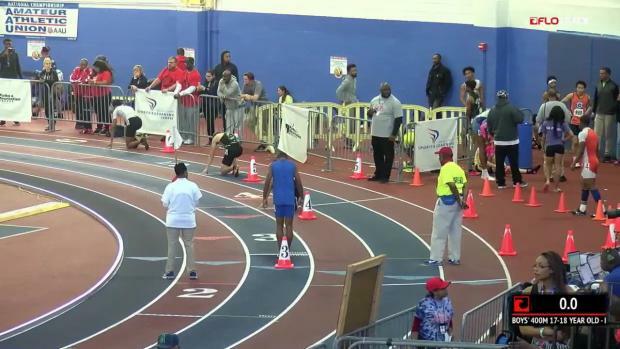 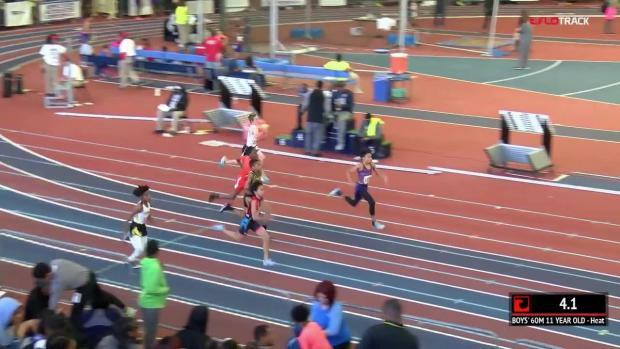 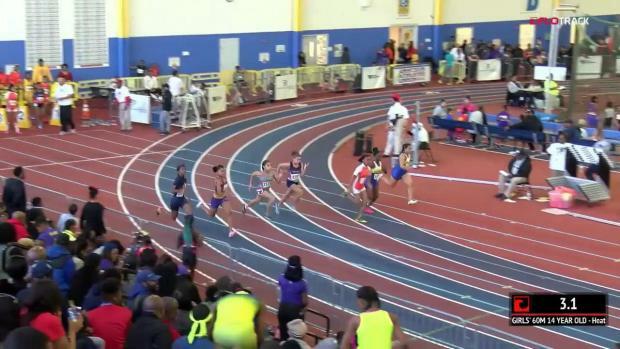 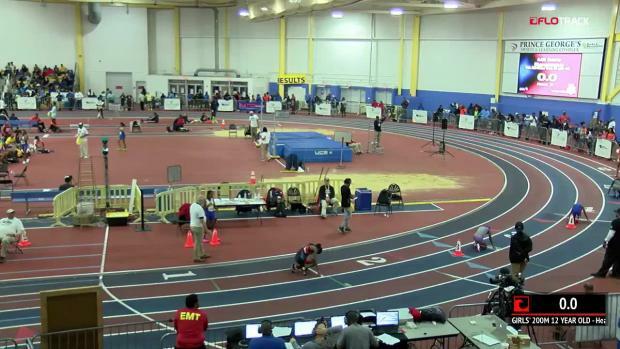 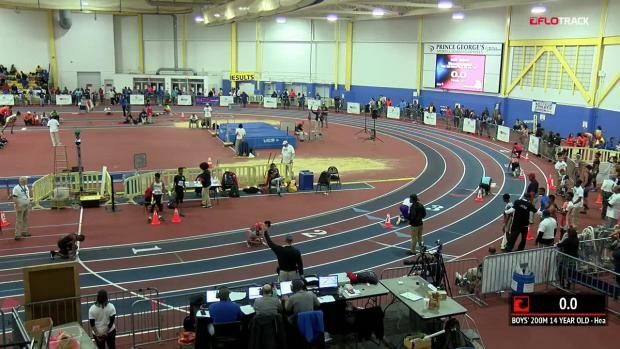 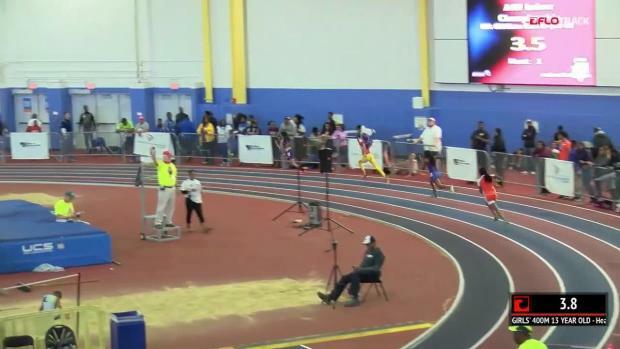 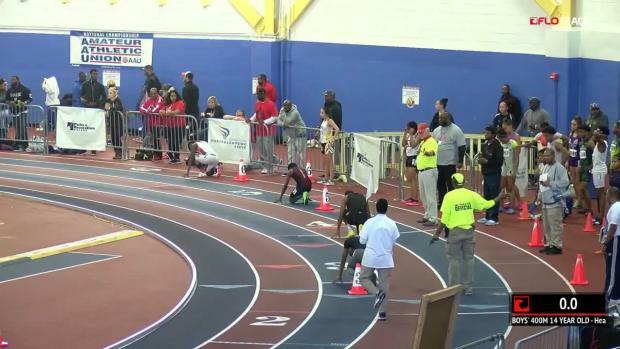 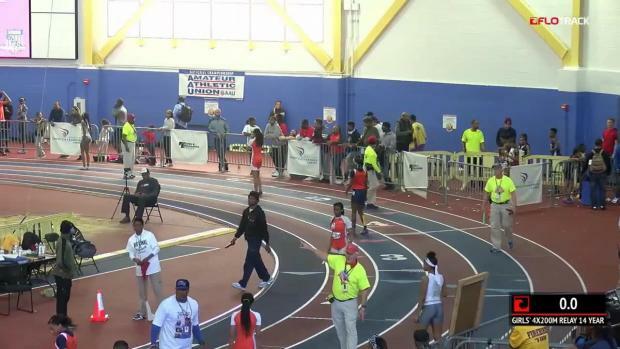 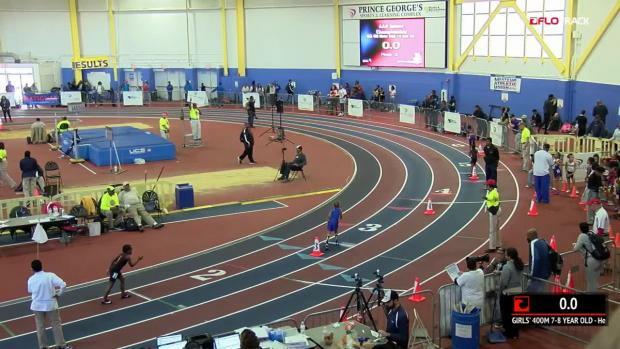 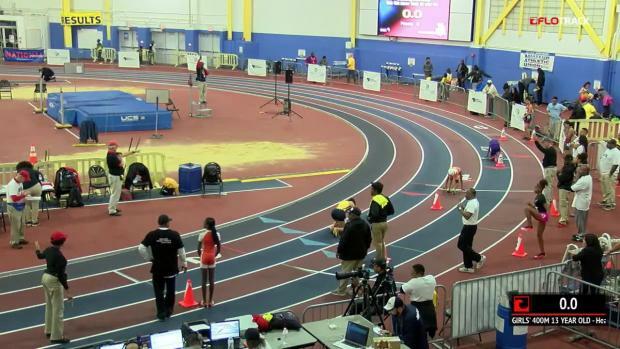 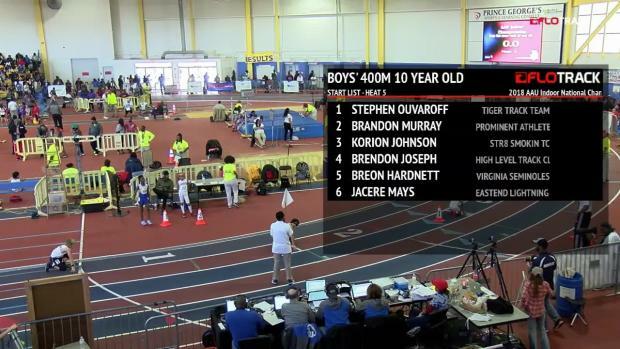 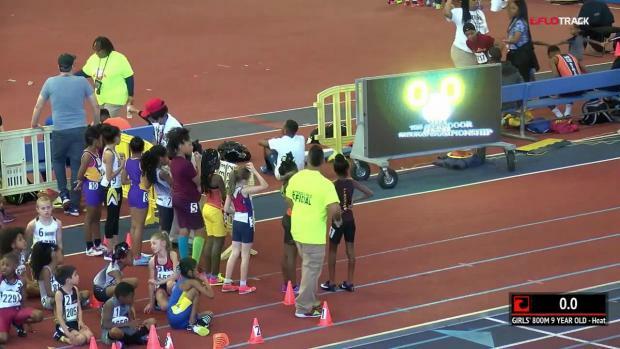 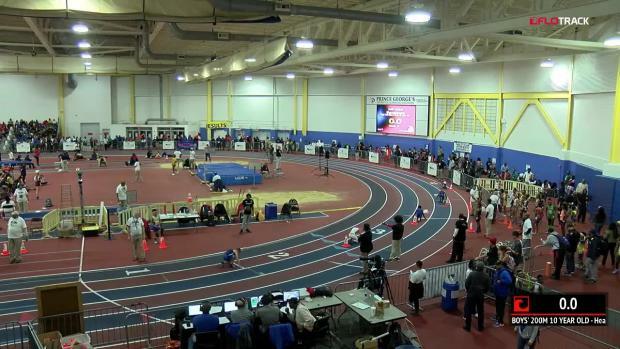 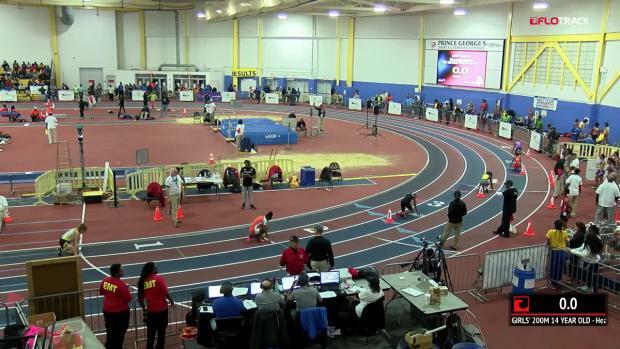 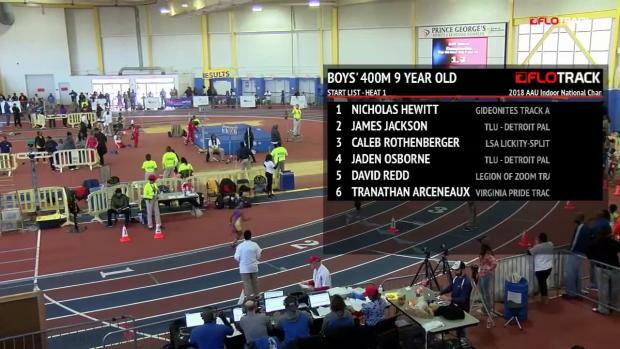 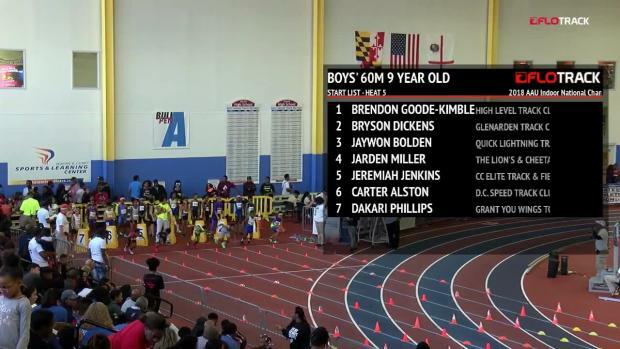 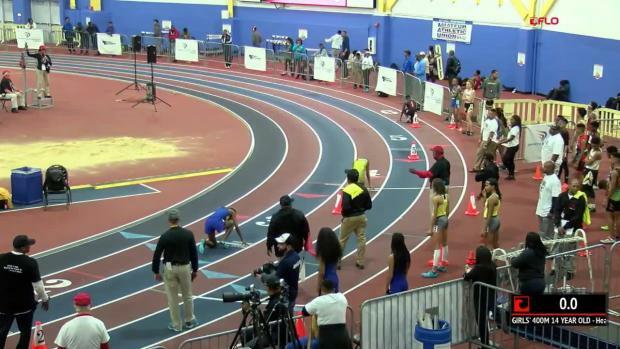 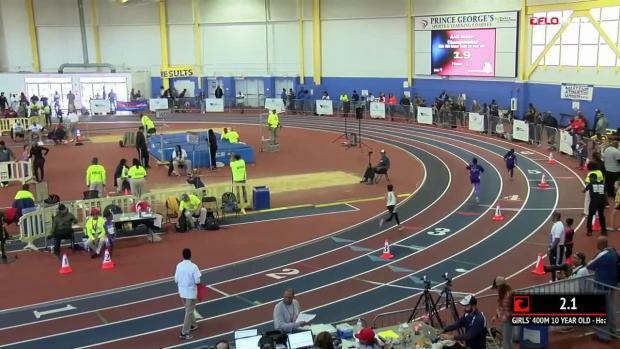 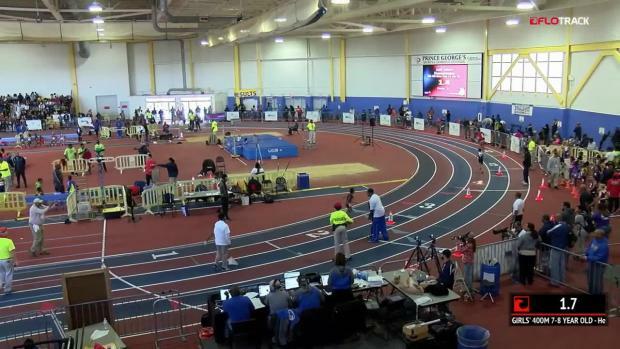 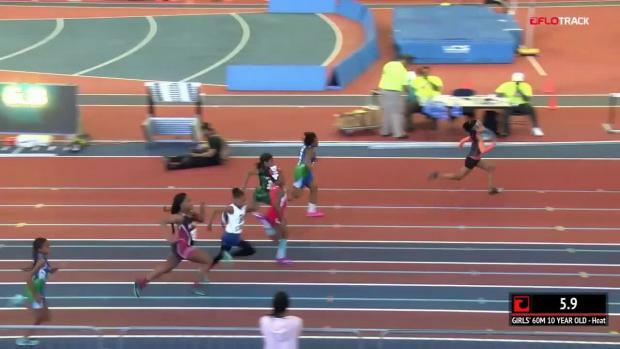 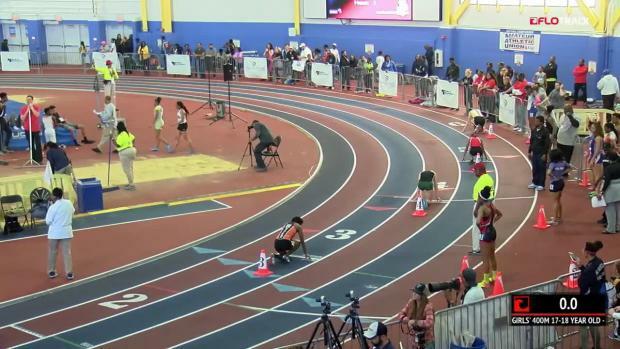 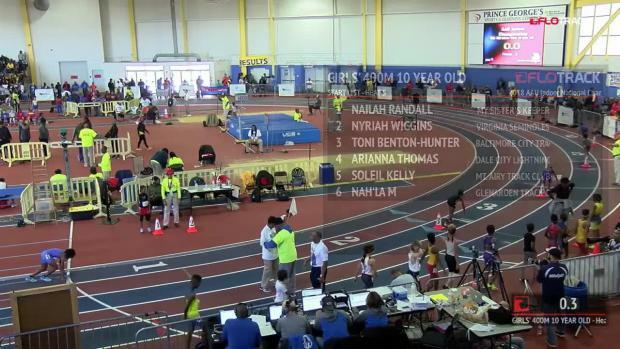 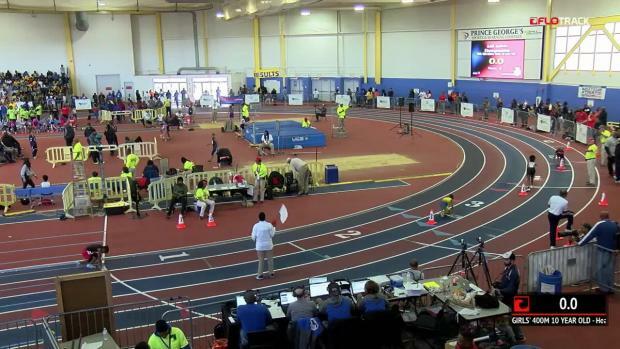 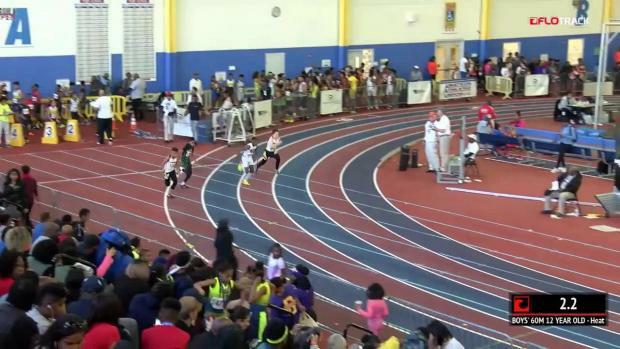 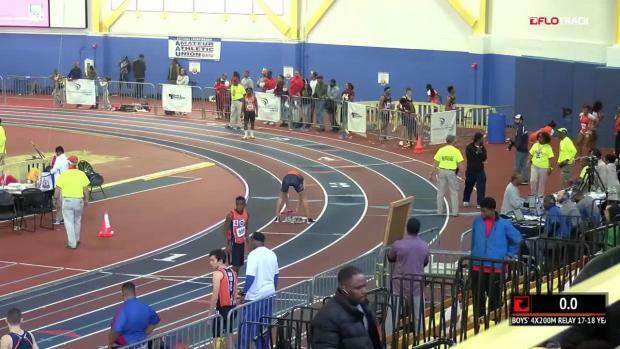 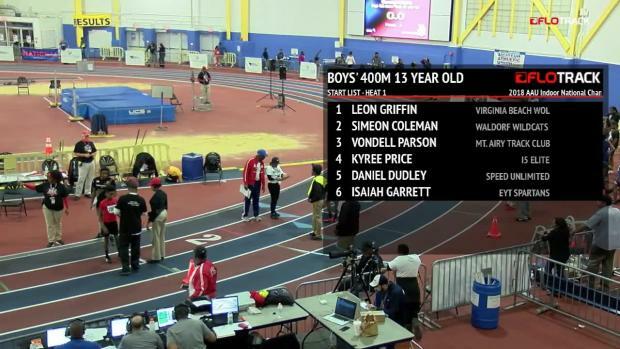 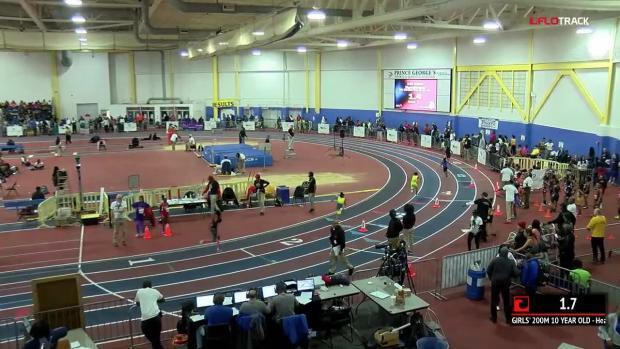 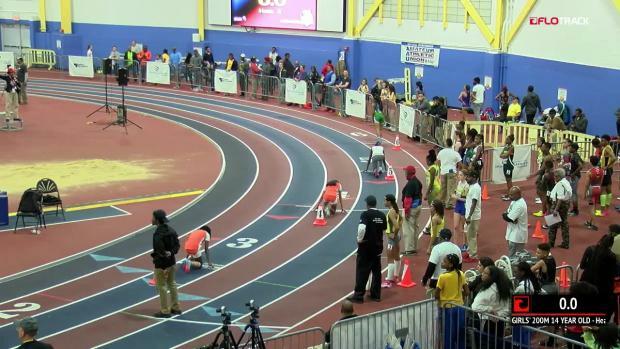 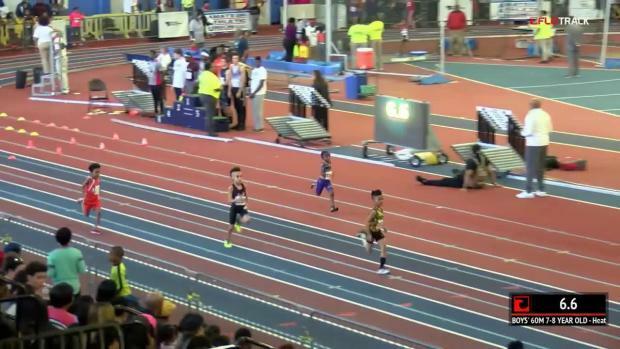 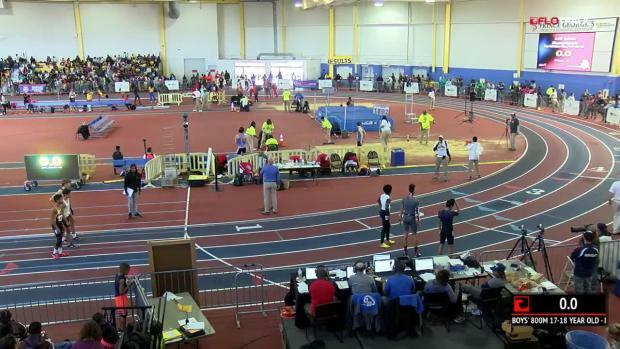 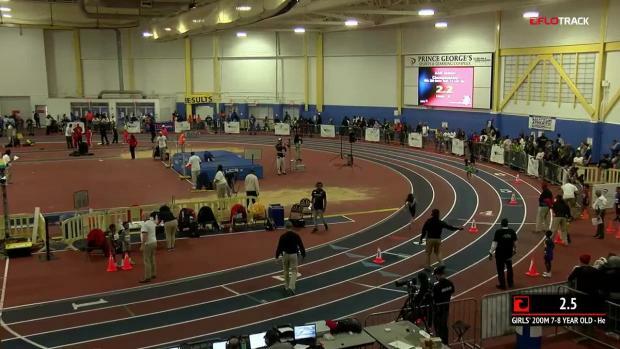 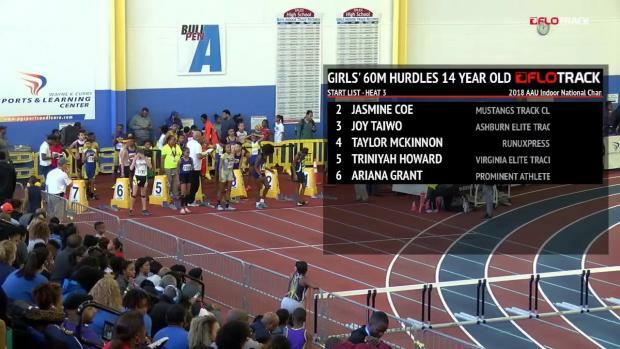 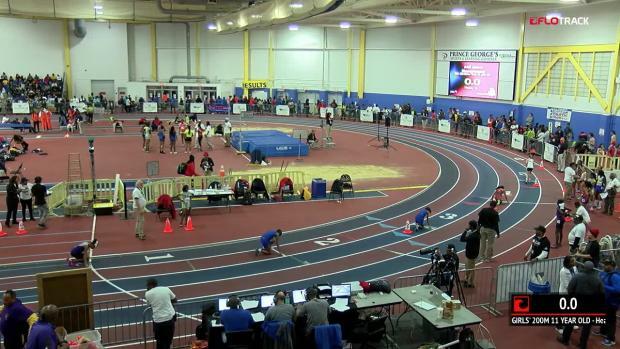 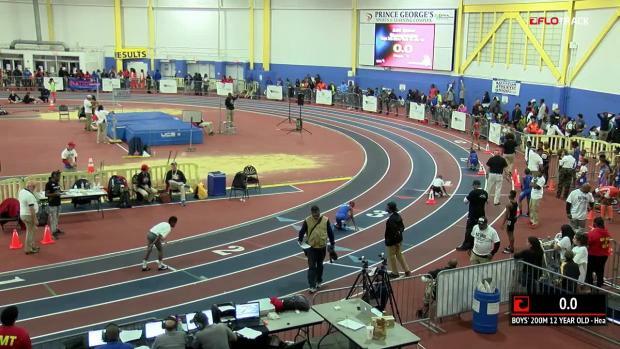 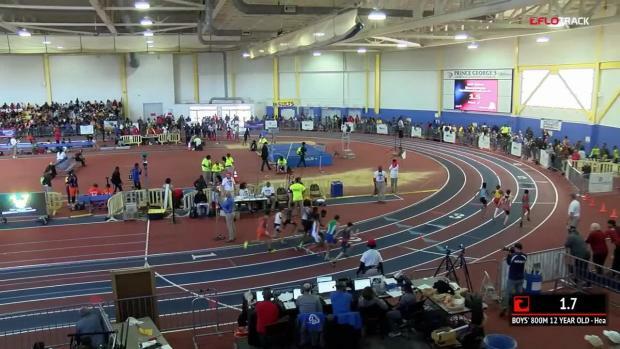 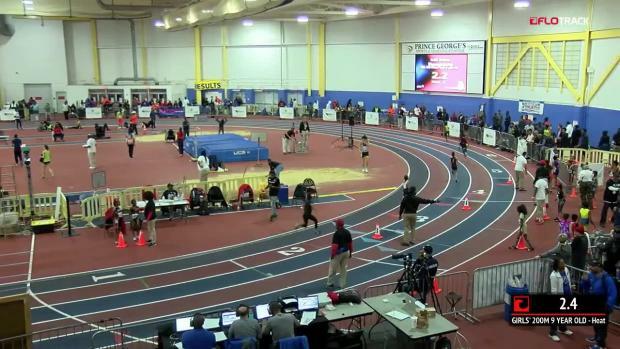 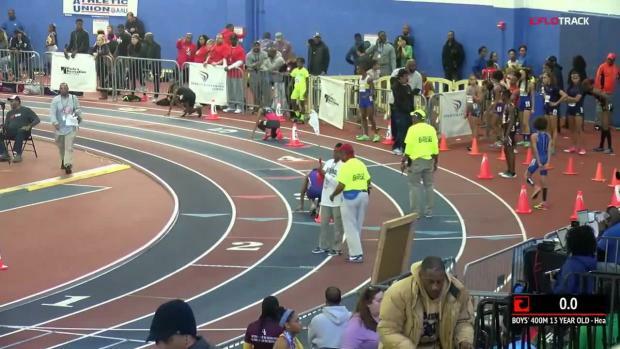 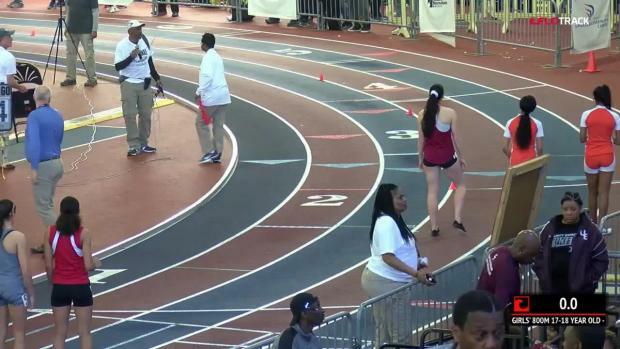 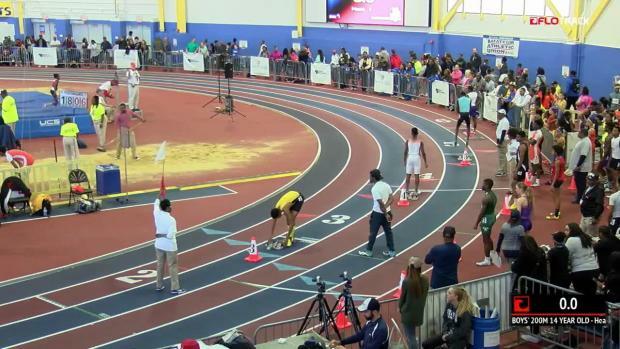 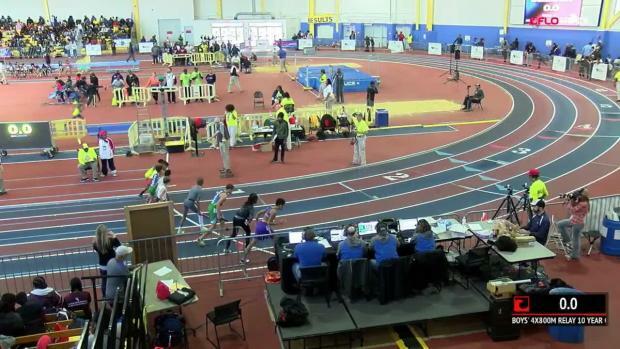 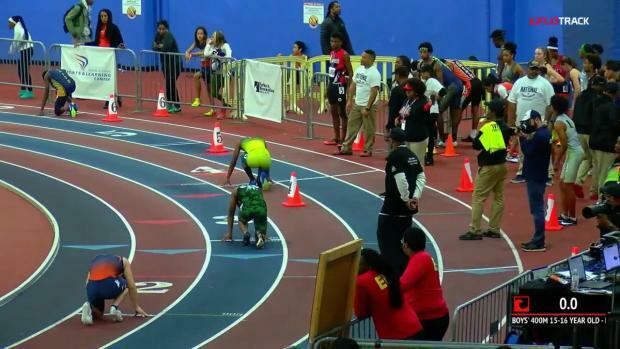 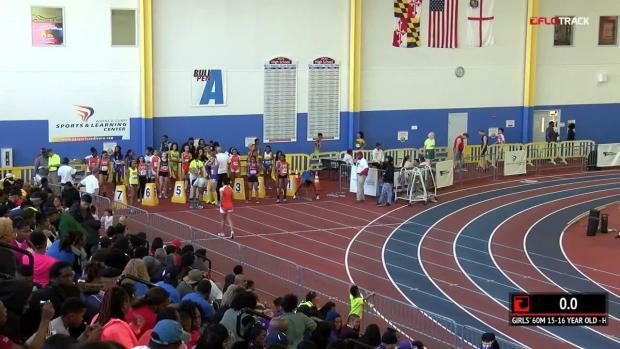 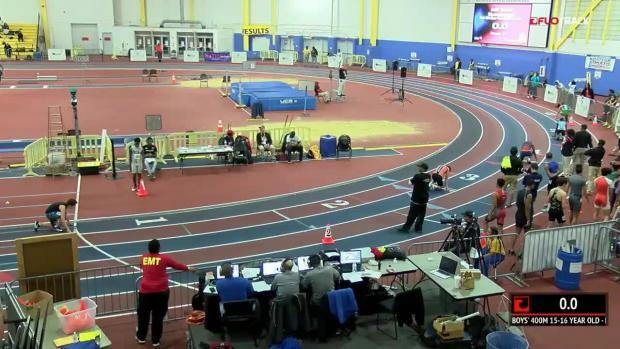 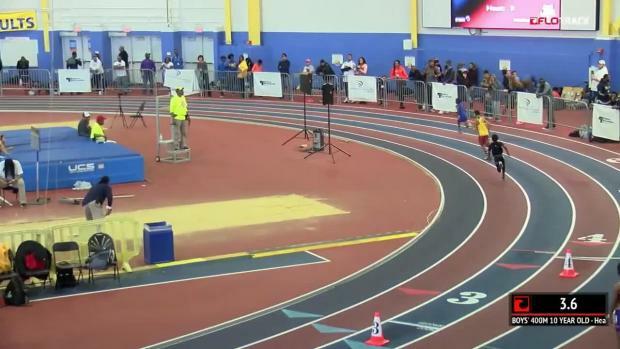 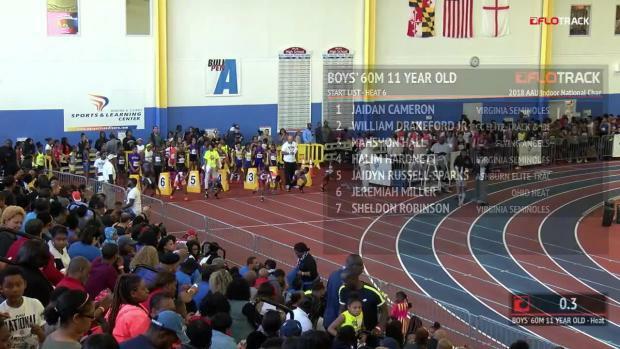 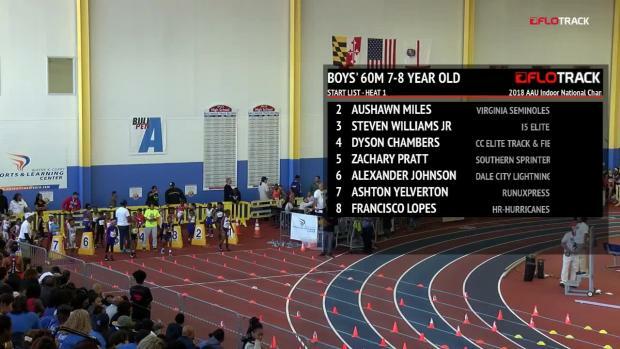 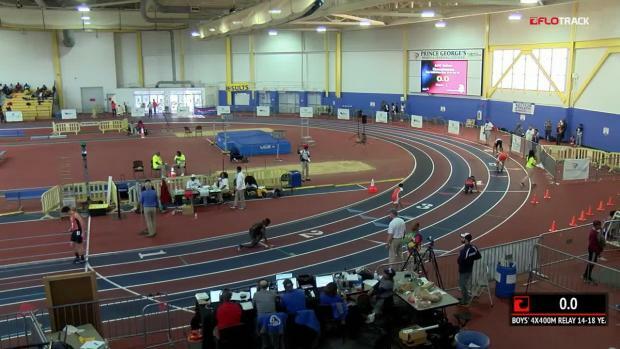 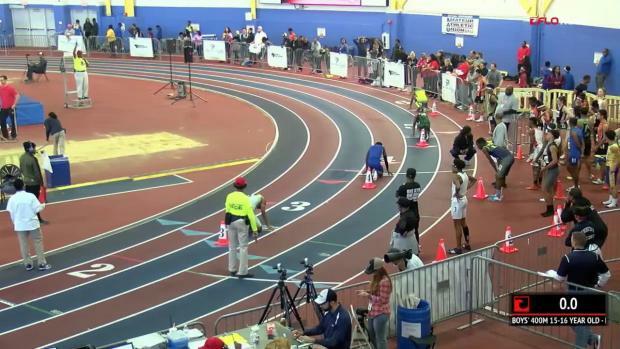 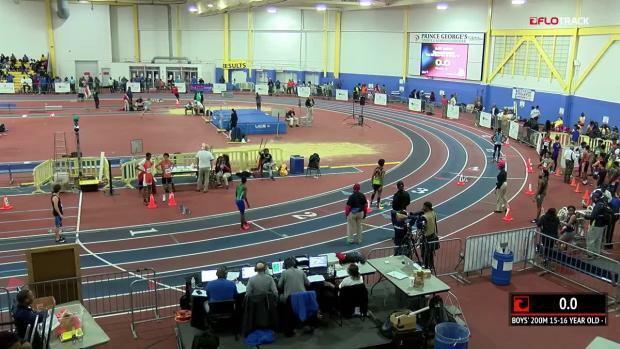 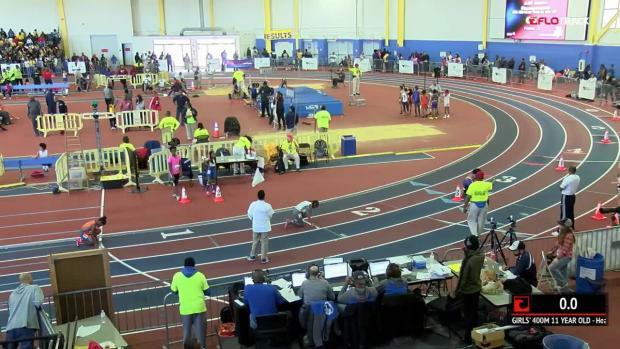 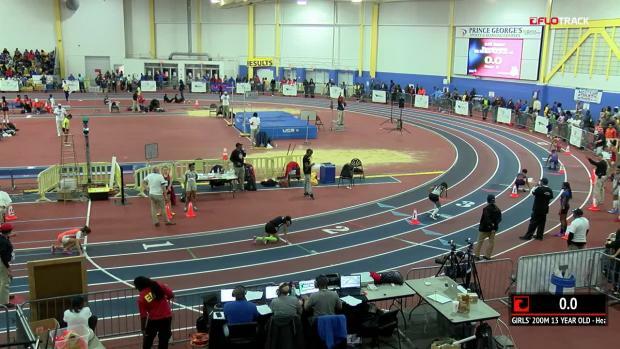 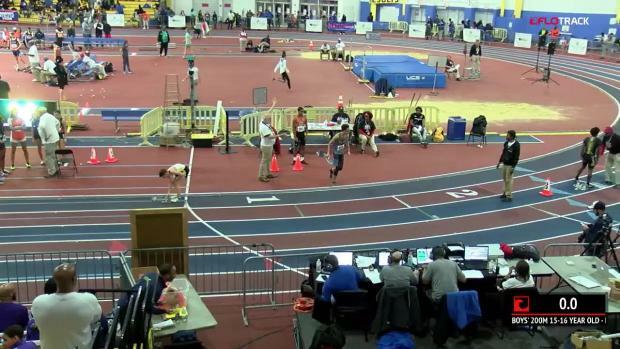 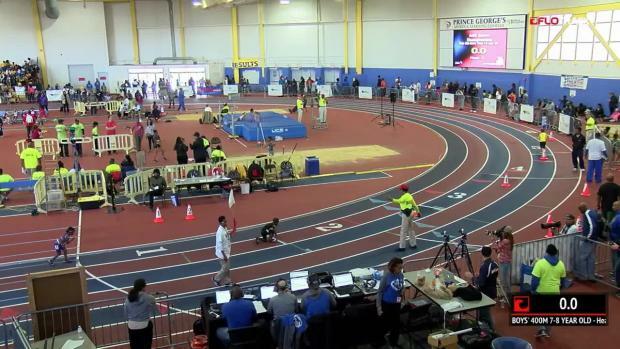 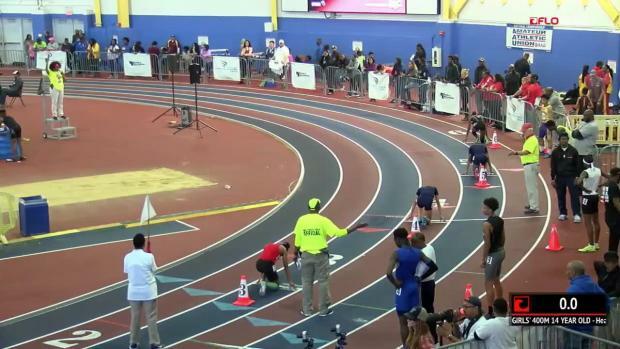 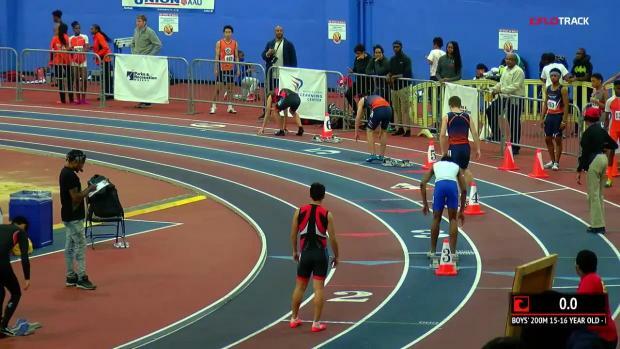 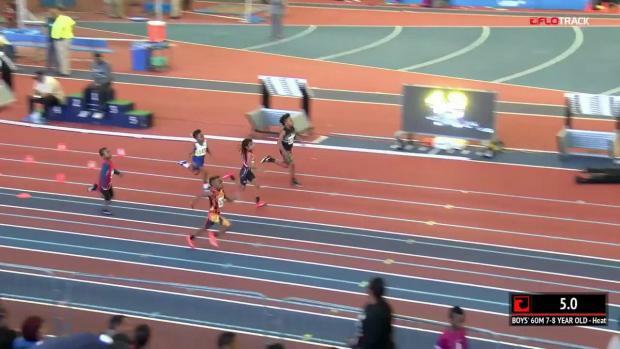 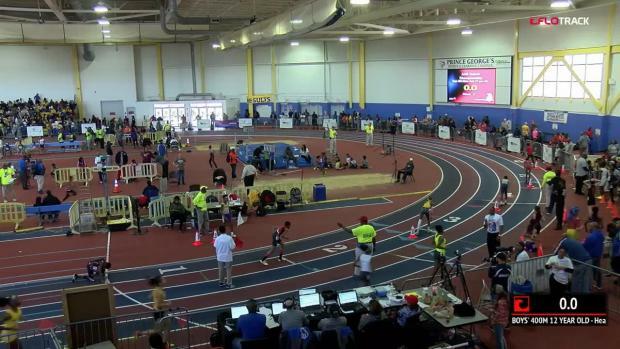 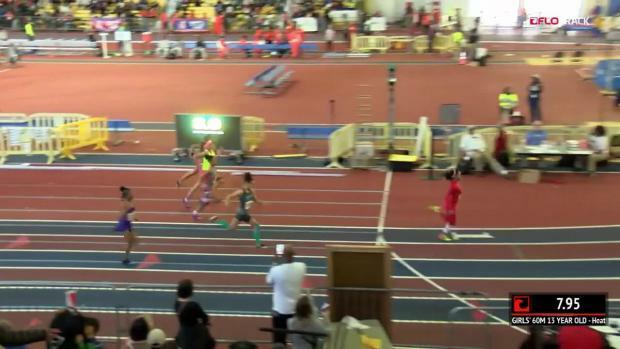 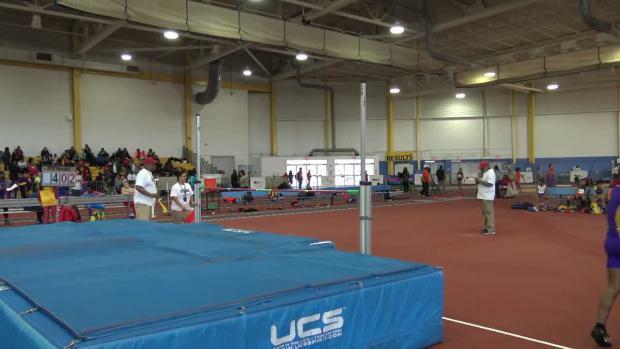 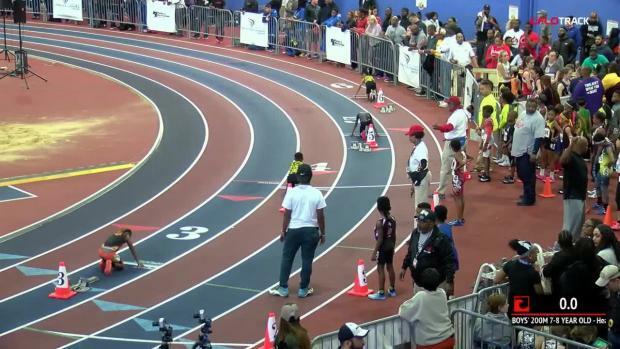 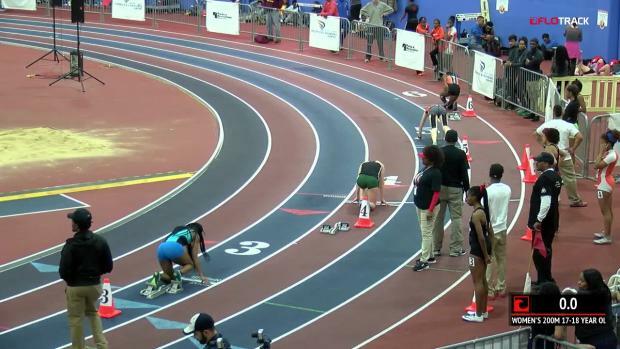 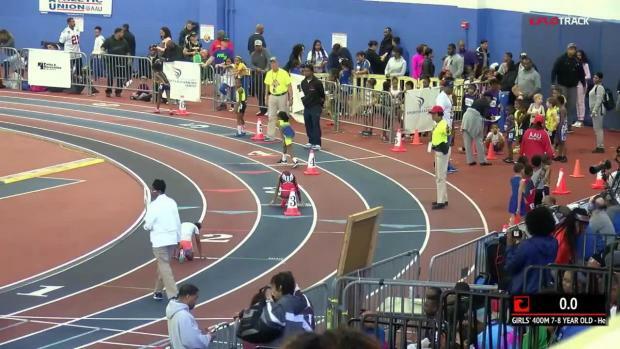 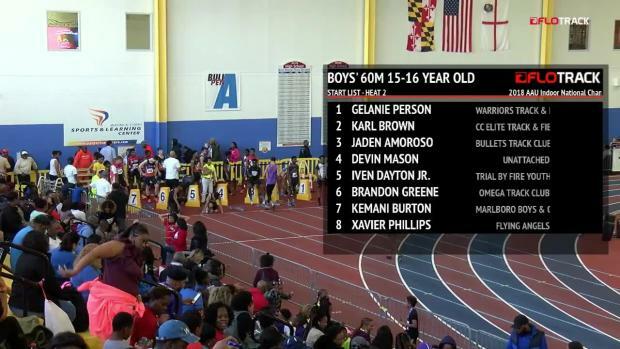 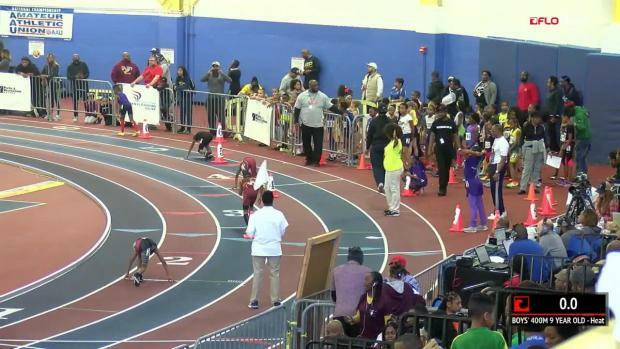 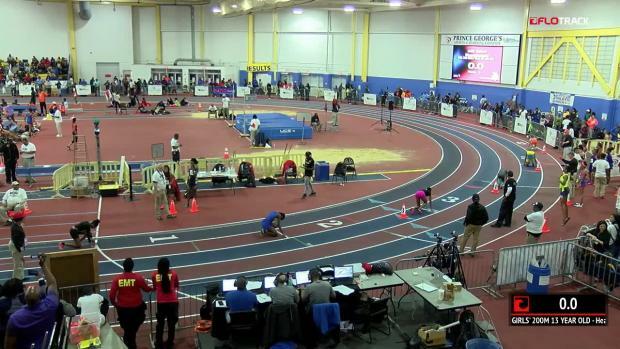 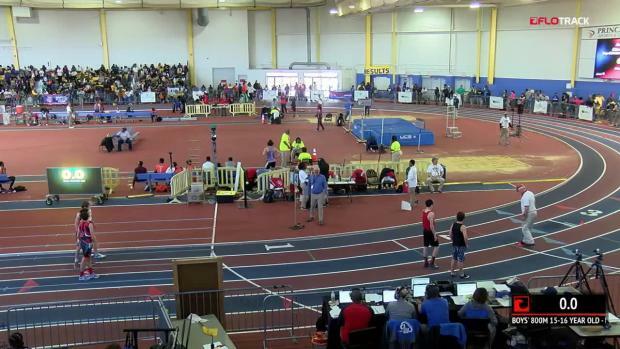 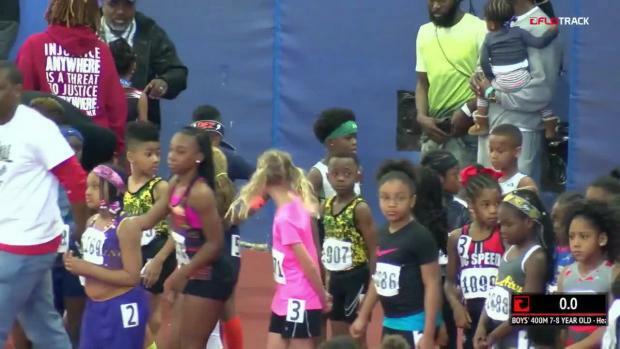 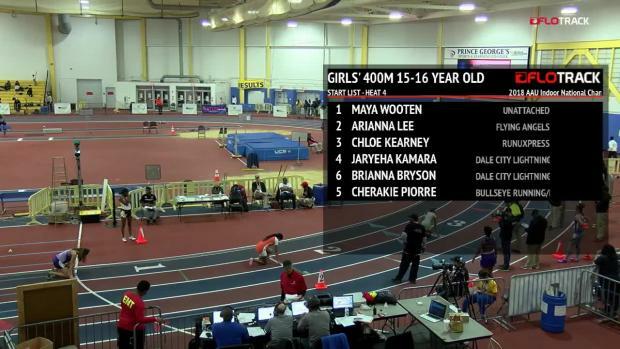 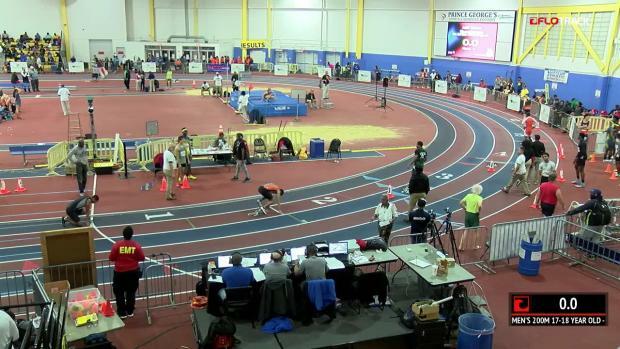 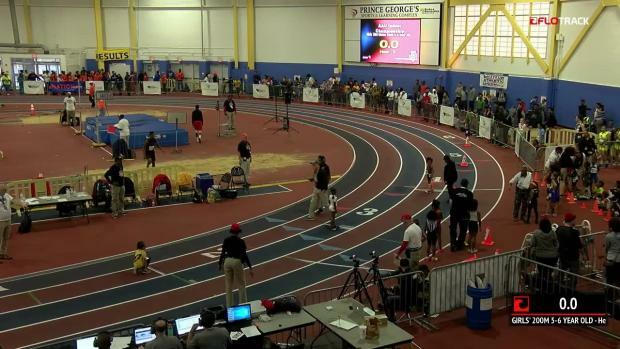 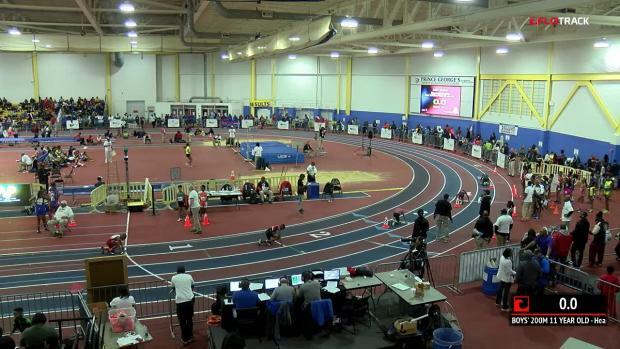 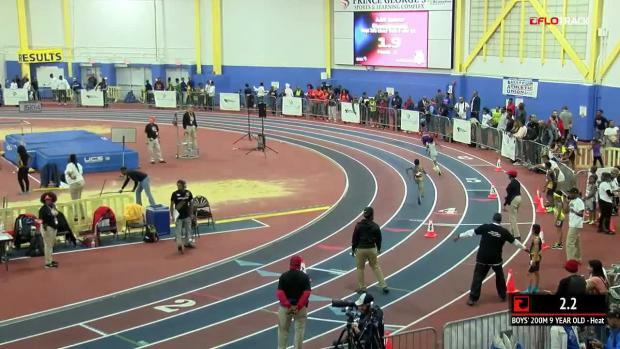 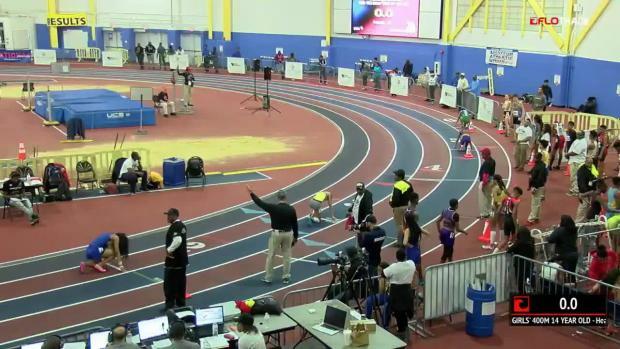 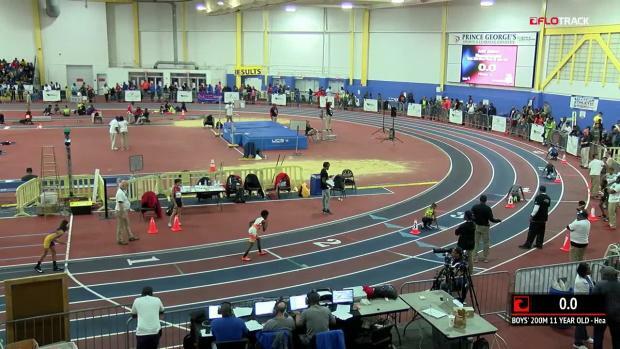 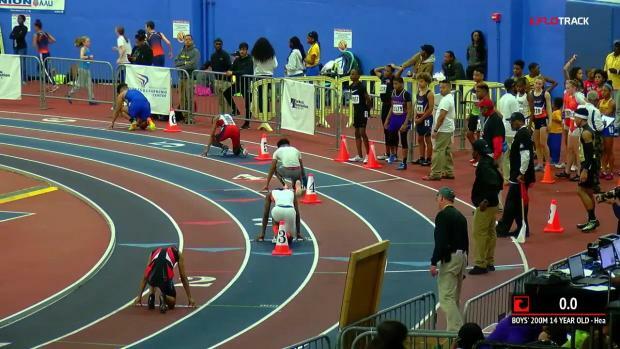 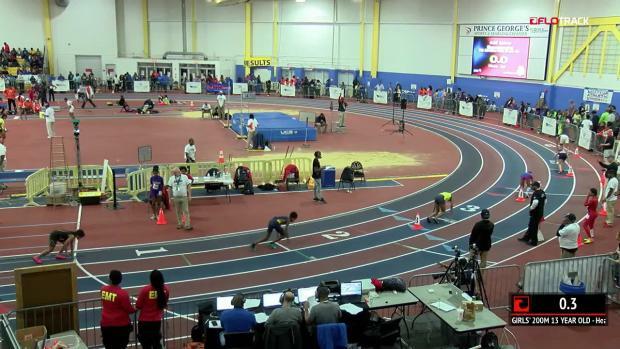 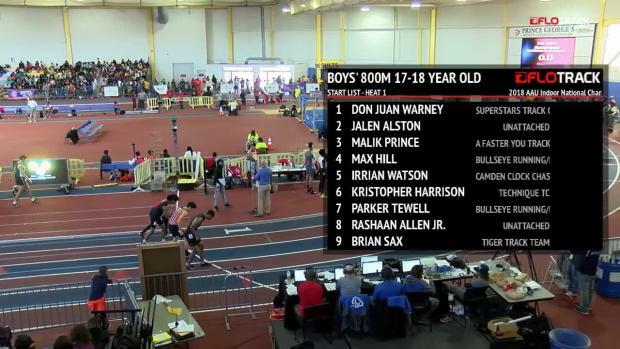 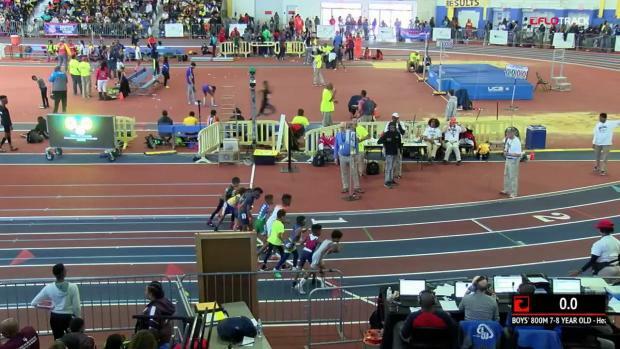 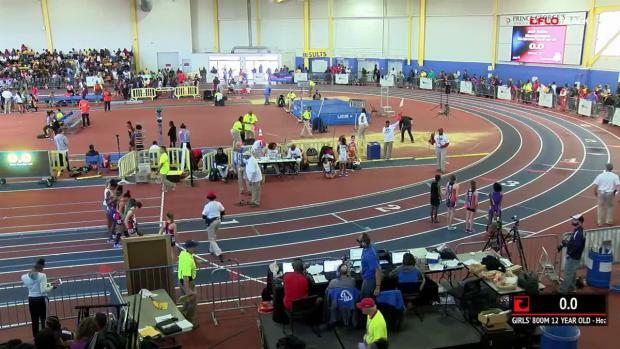 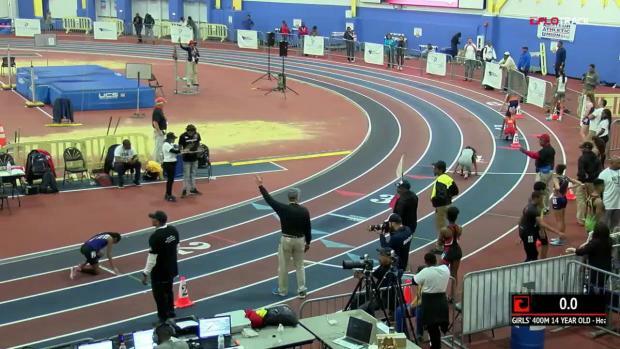 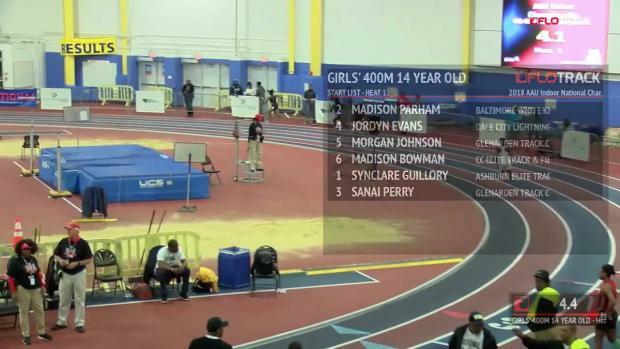 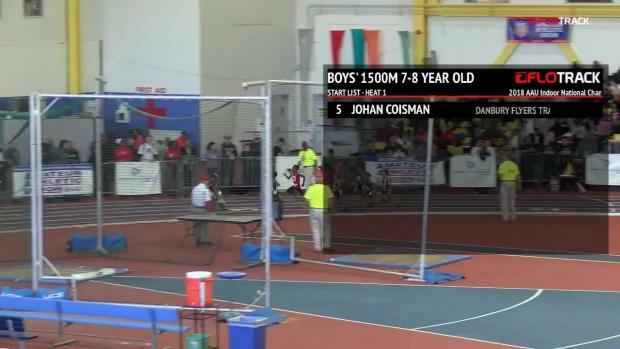 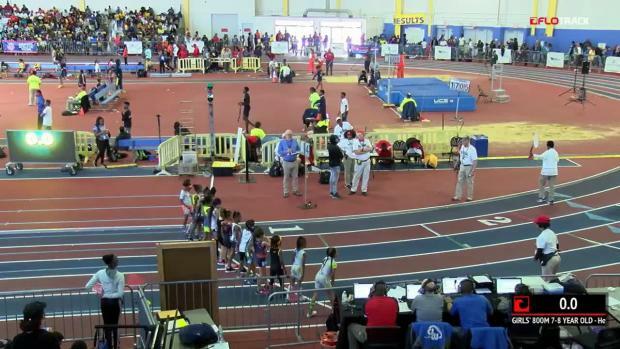 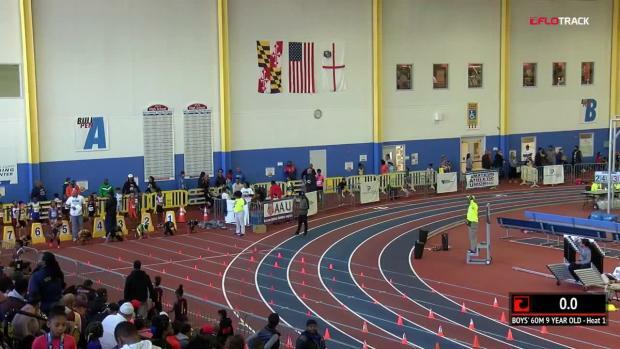 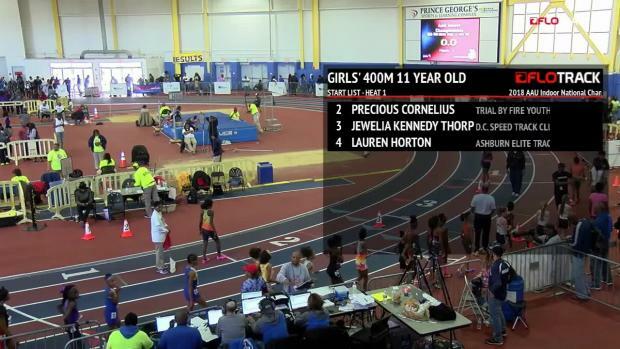 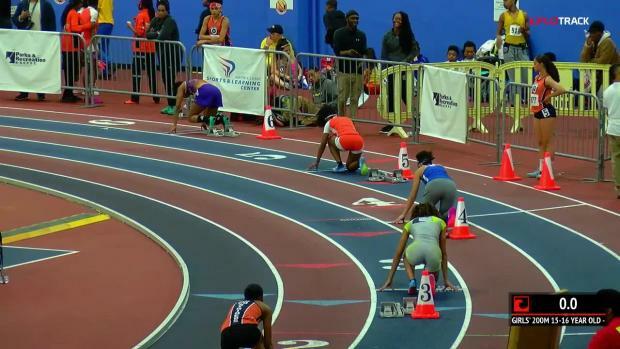 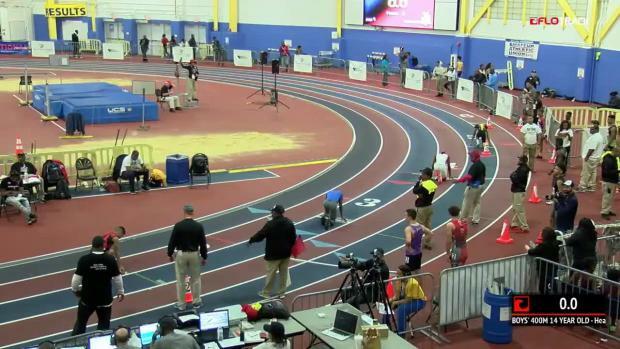 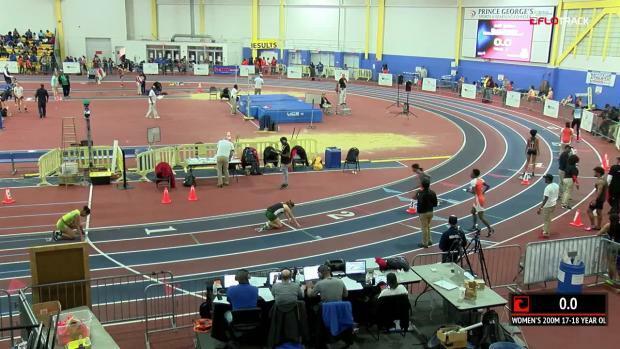 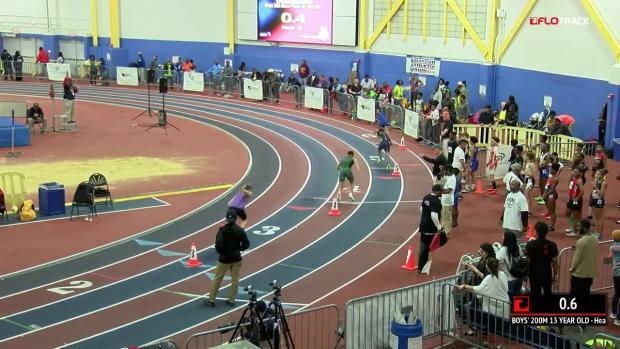 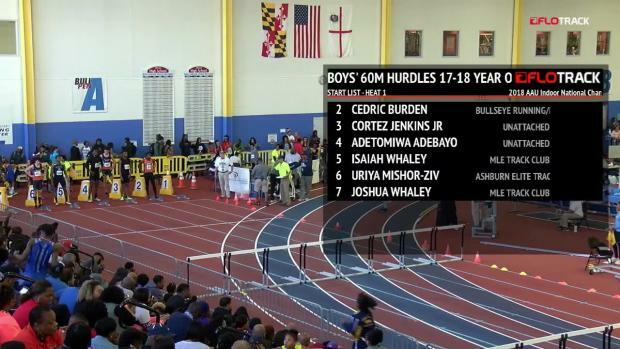 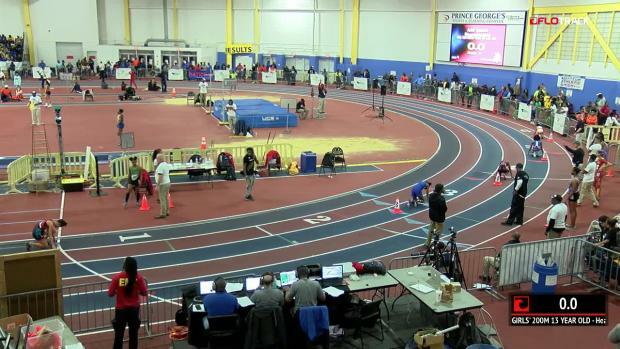 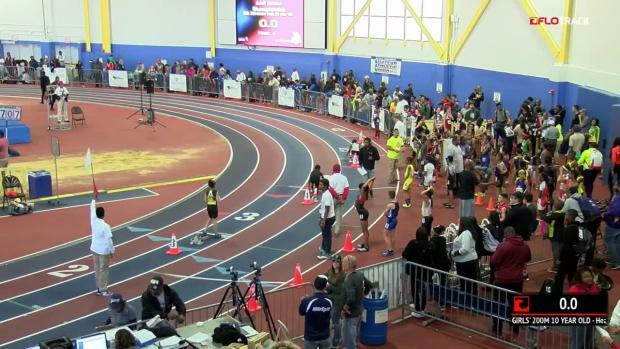 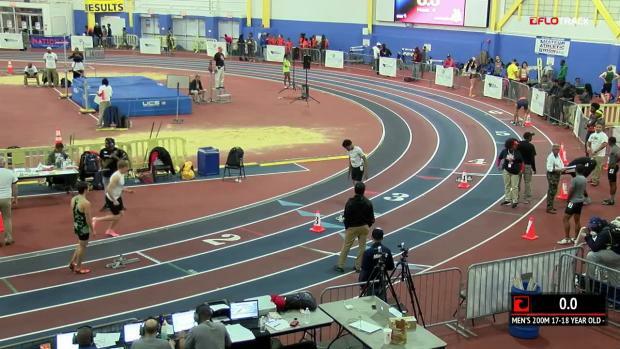 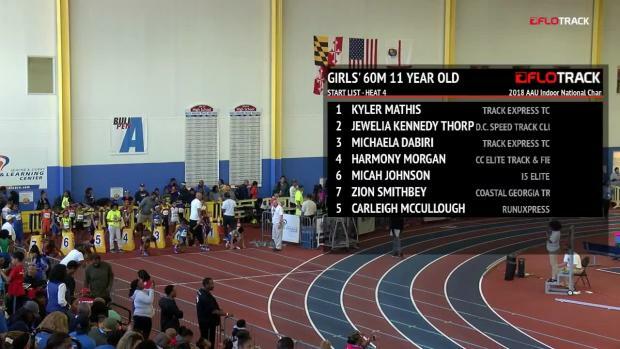 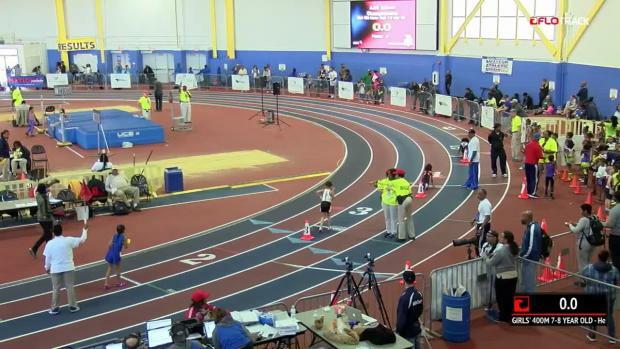 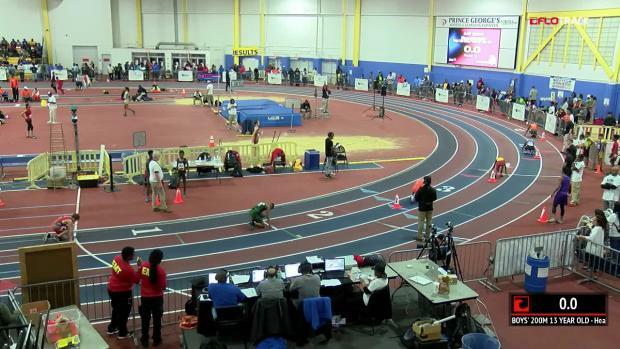 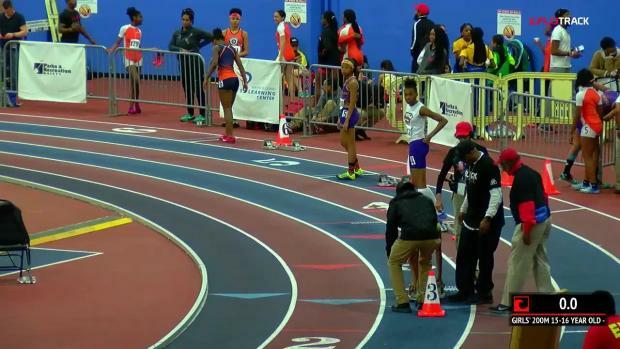 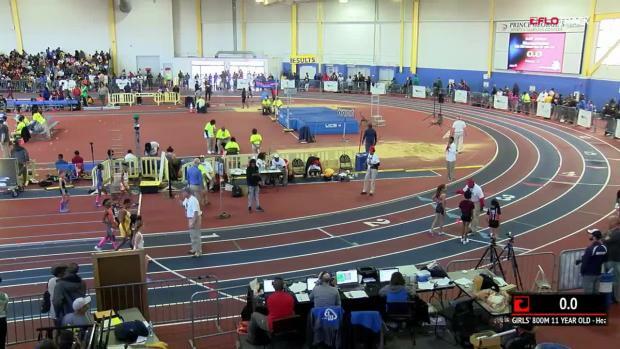 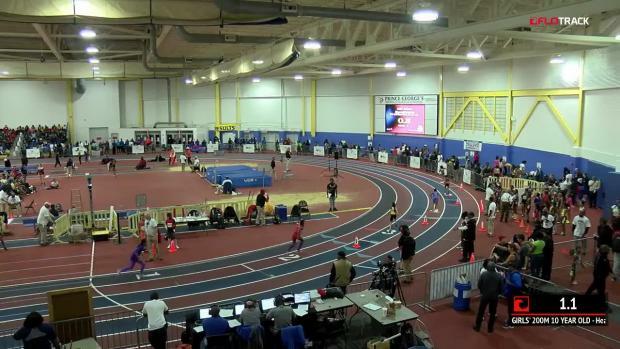 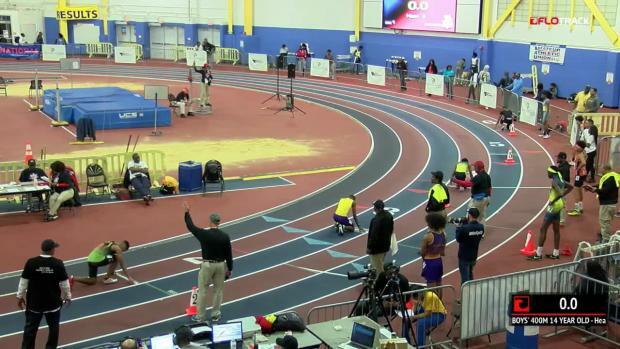 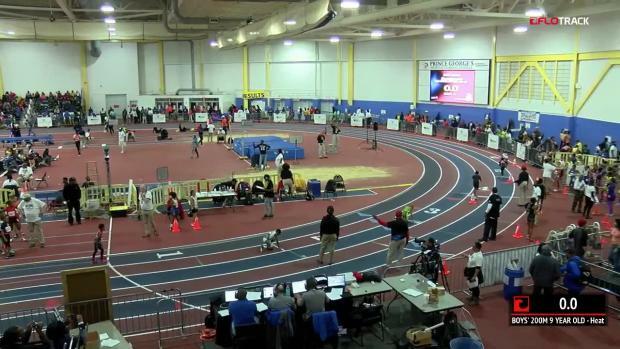 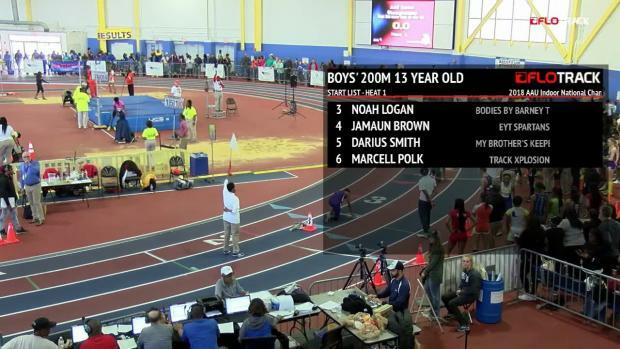 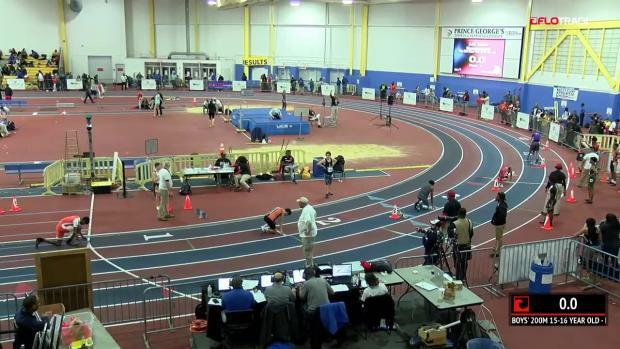 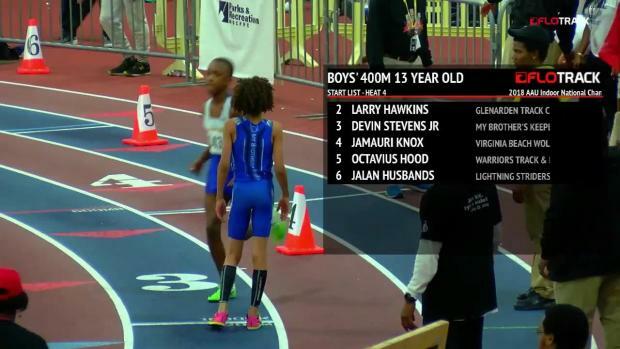 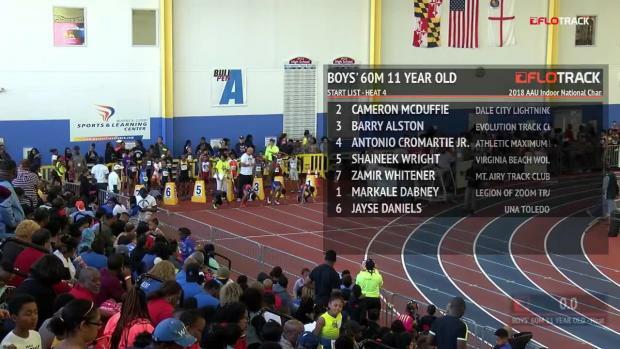 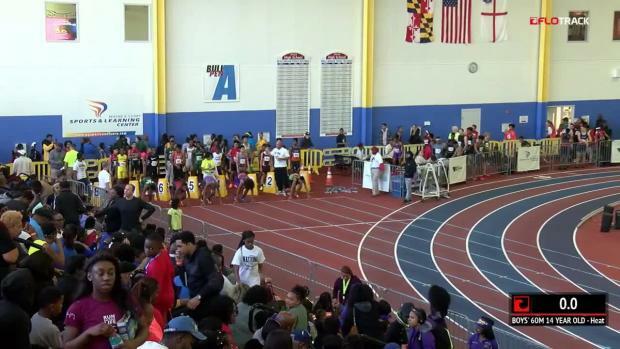 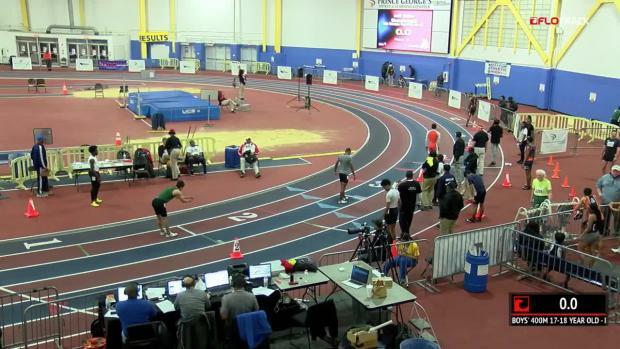 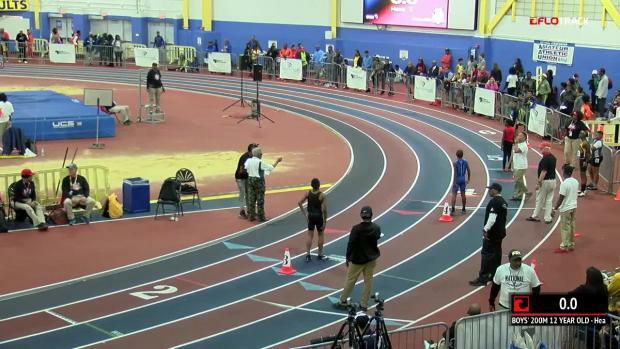 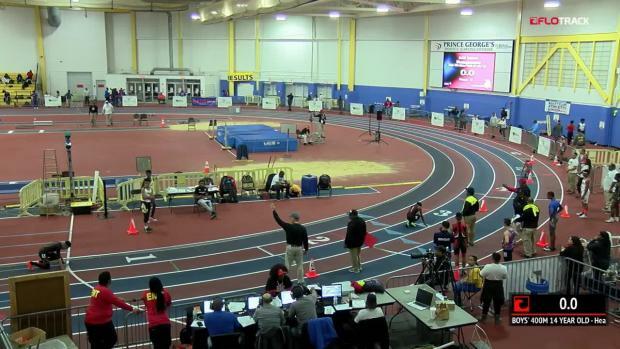 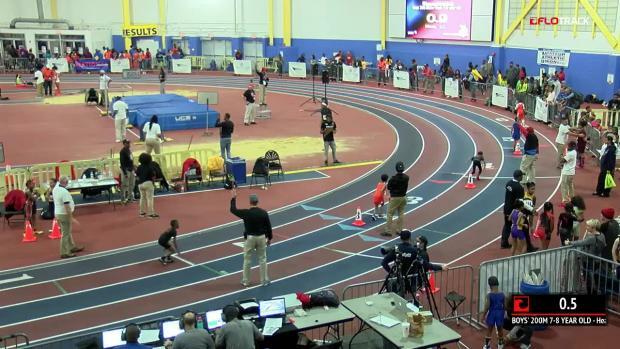 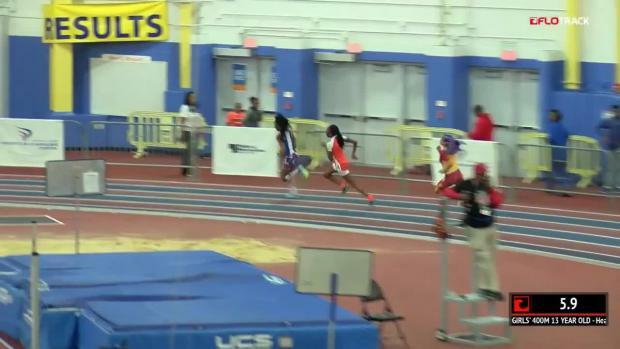 Check out race video coverage from last year's AAU Indoor Nationals at the PG County Sportsplex. 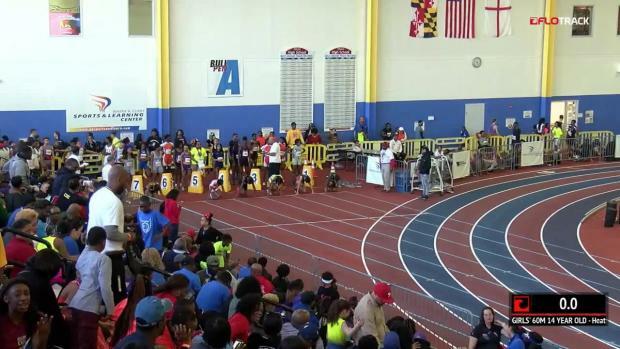 Complete results from Friday's events at the AAU Indoor Nationals. 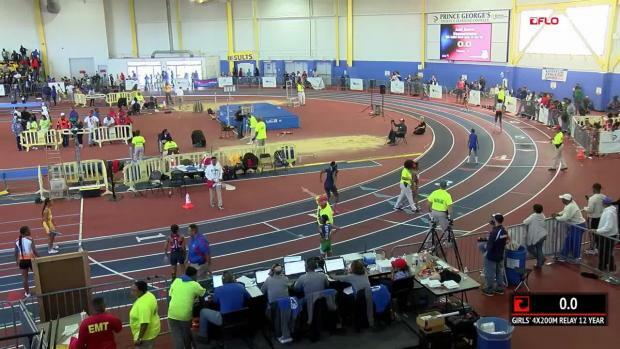 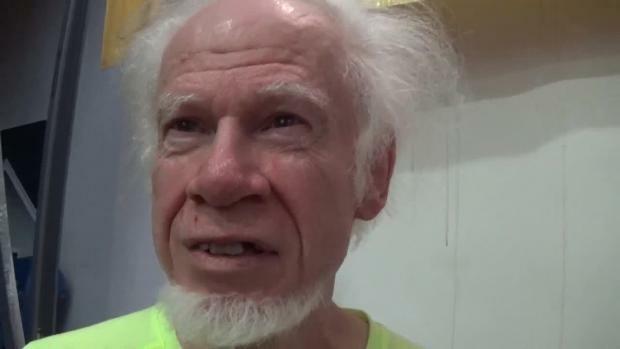 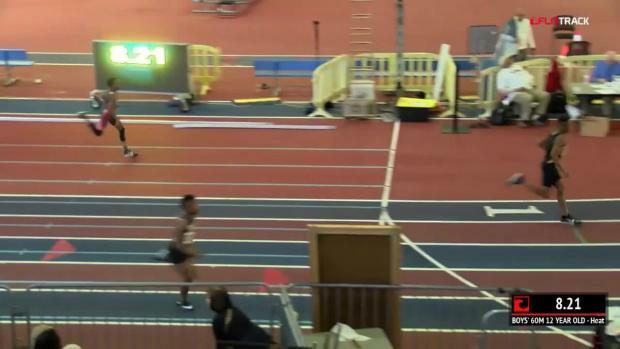 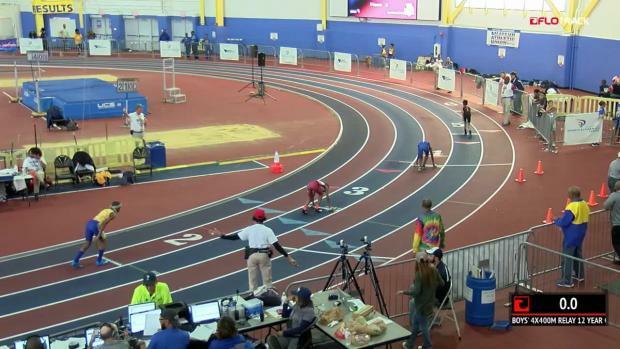 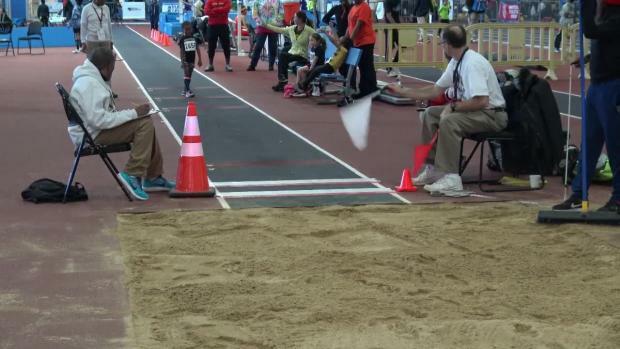 Watch the most impressive and crowd pleasing race of day 1 at the AAU Indoor Nationals in a 76 year old man named William Rhoad winning his masters age group division 200 meter dash in a 37 seconds without any shoes! 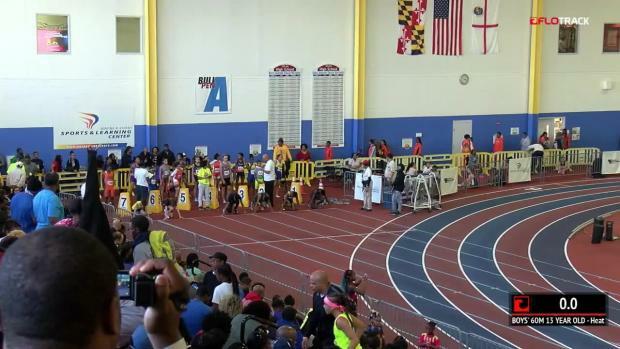 Check out massive photo collection from day 1 races at the AAU Indoor Nationals. 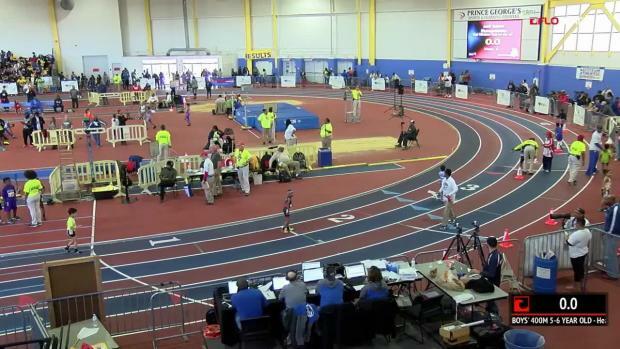 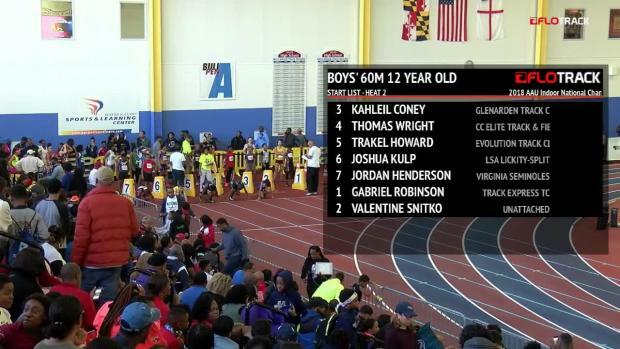 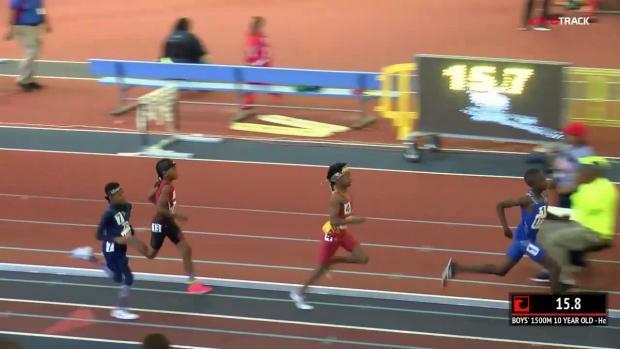 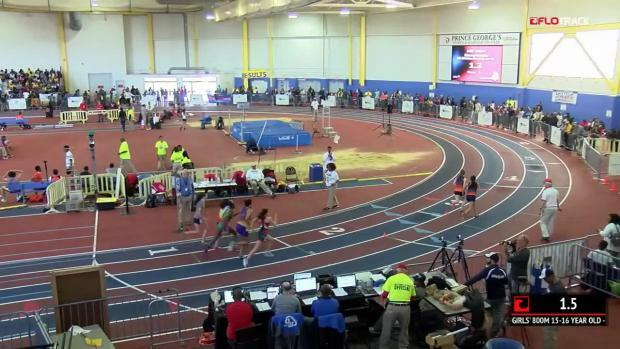 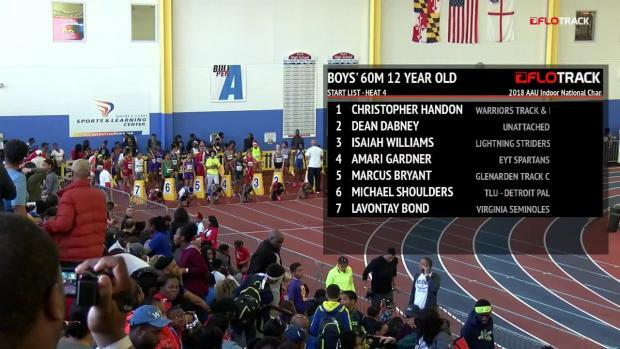 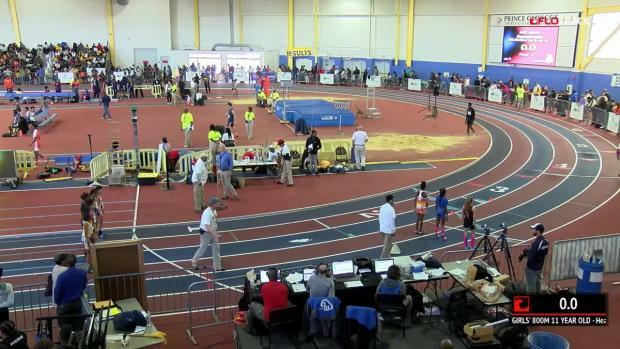 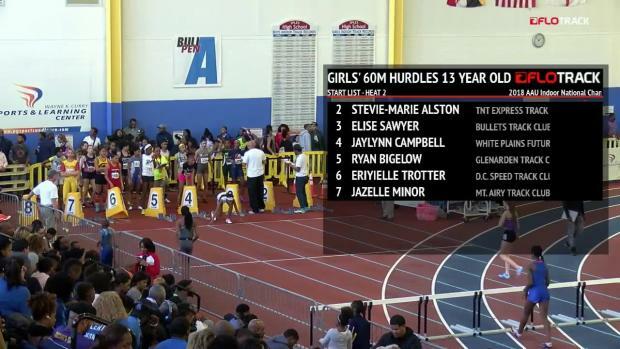 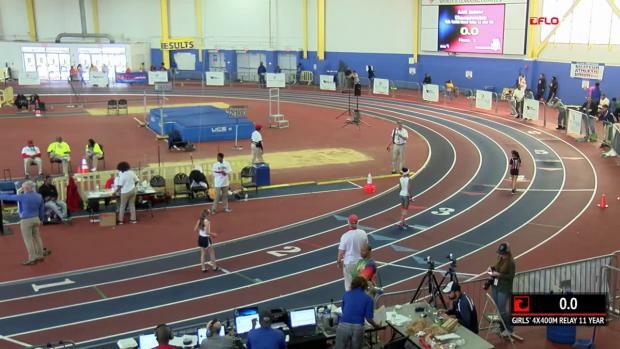 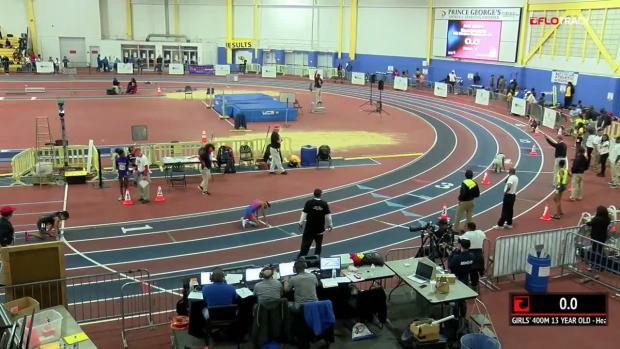 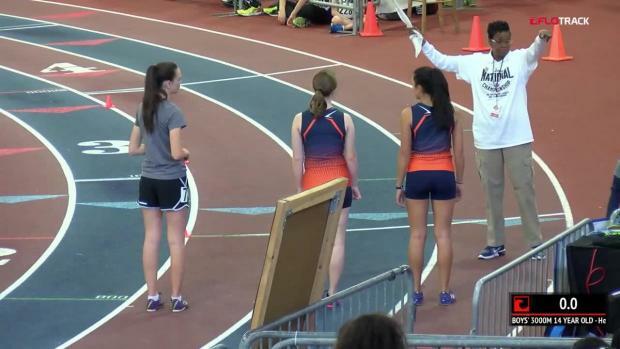 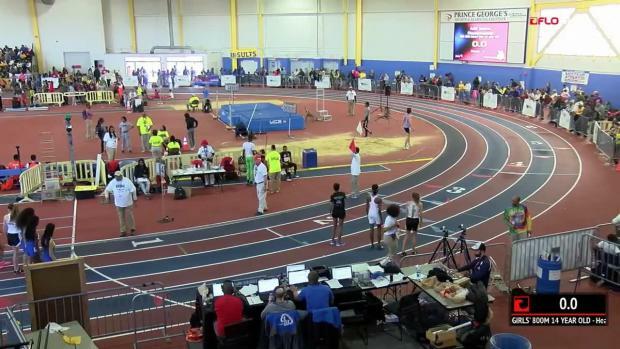 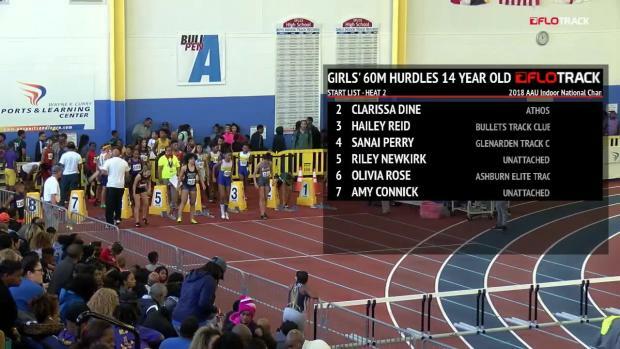 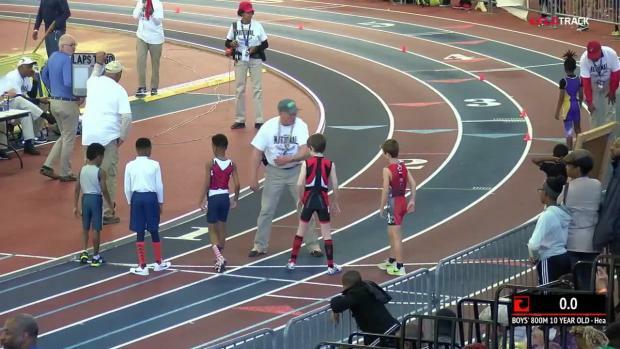 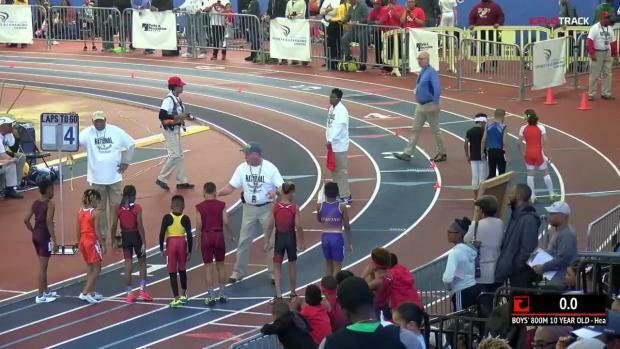 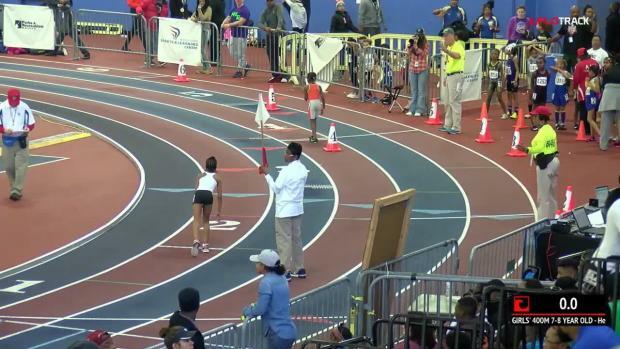 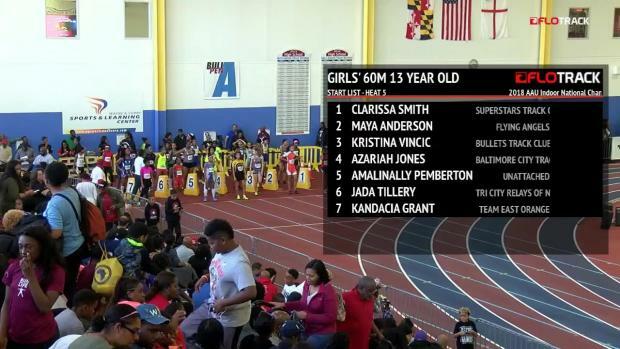 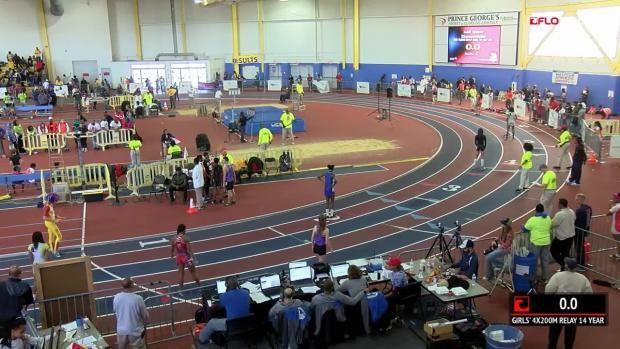 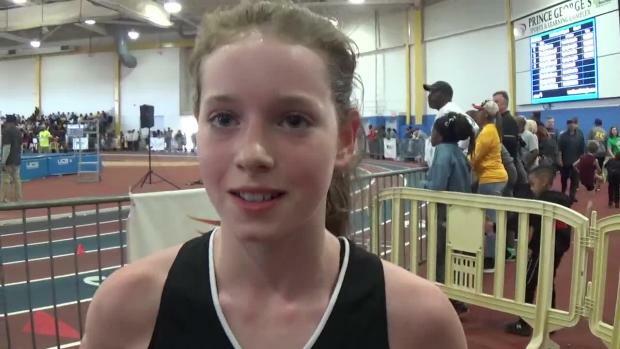 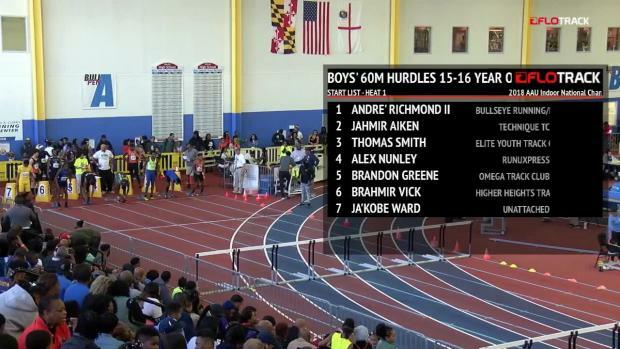 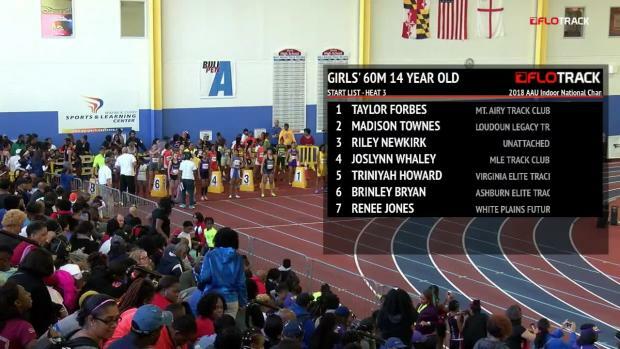 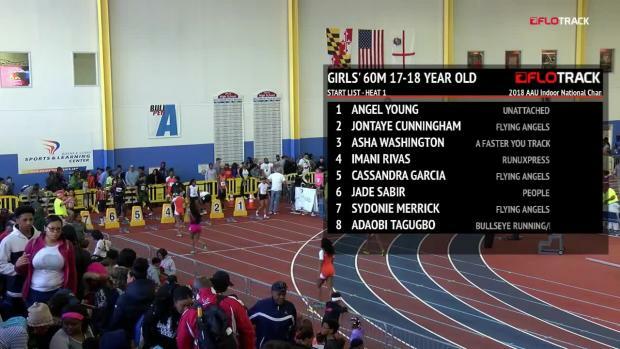 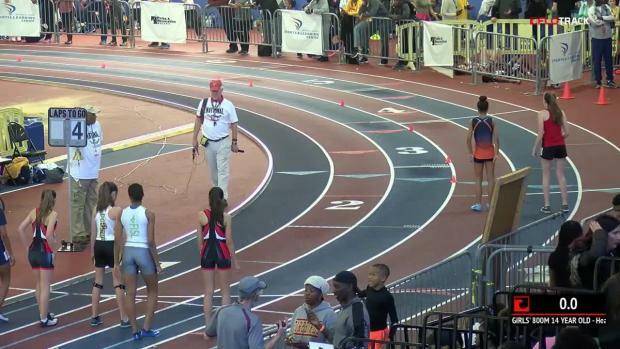 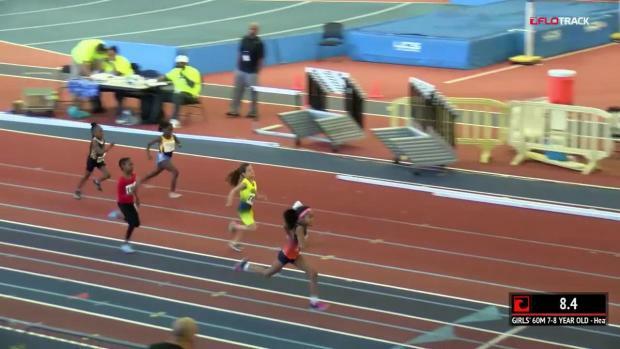 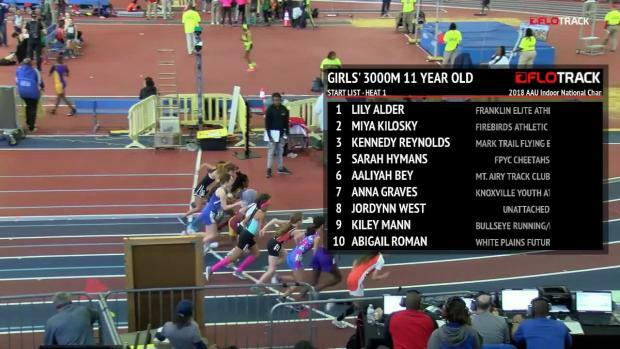 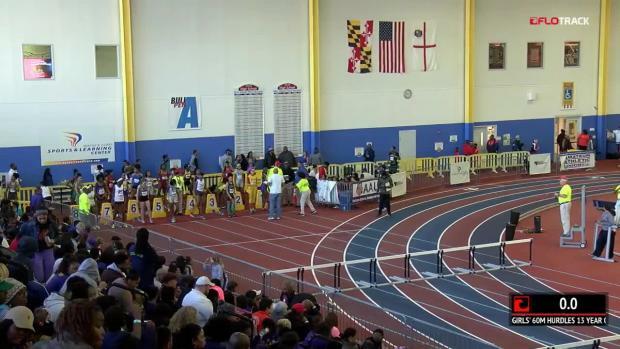 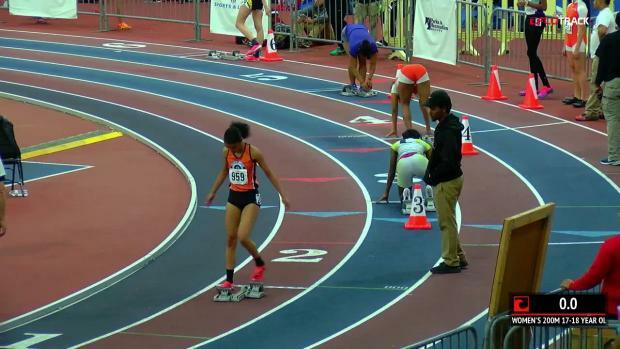 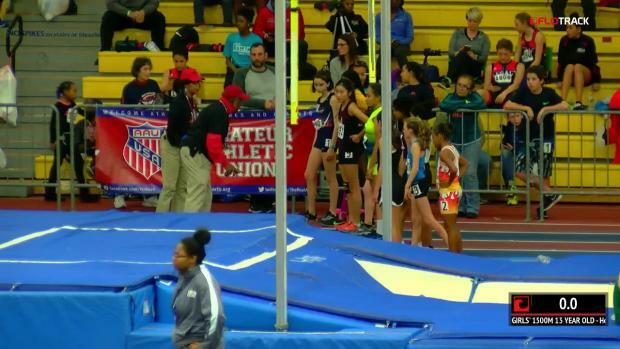 Watch race videos from the AAU Indoor Nationals. 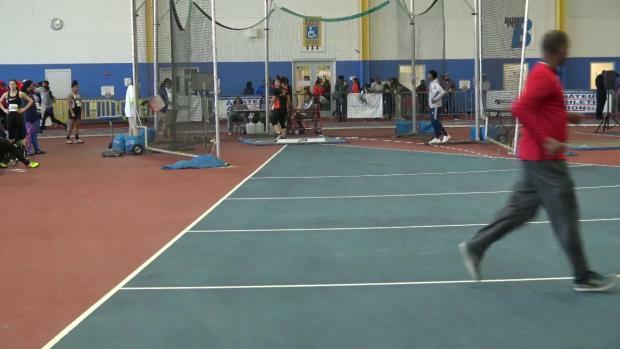 More on the way including field events coverage. 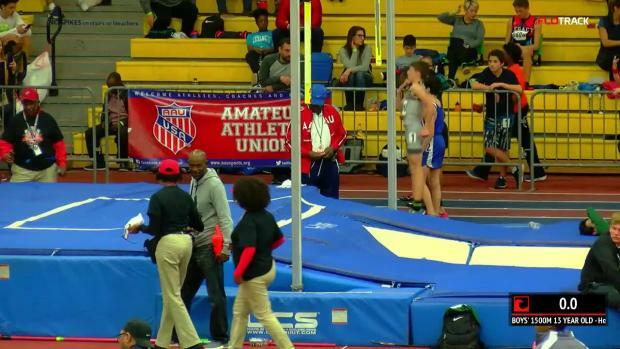 Check out photos taken by Lisa McArthur from Saturday's events at the 2018 AAU Indoor Nationals. 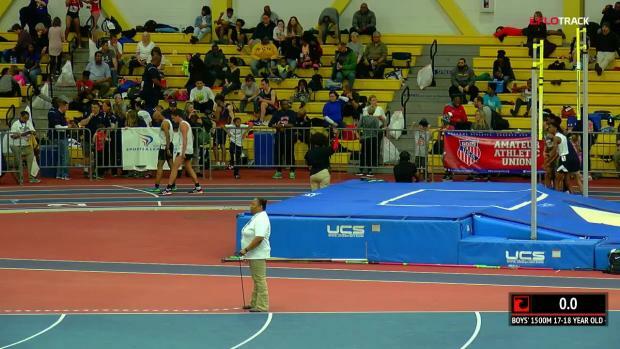 Check out photos from the final day of competition at the 2018 AAU Indoor Nationals by Lisa McArthur. 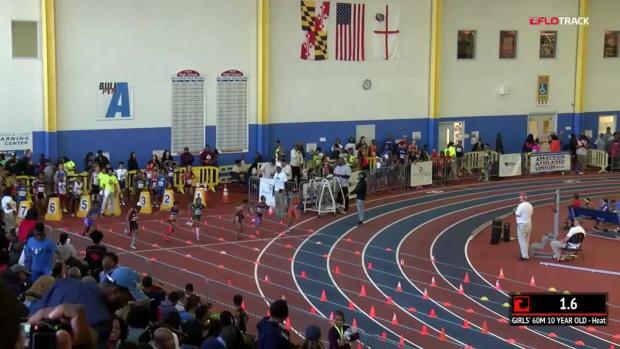 More race videos on the way from day 2 and 3! 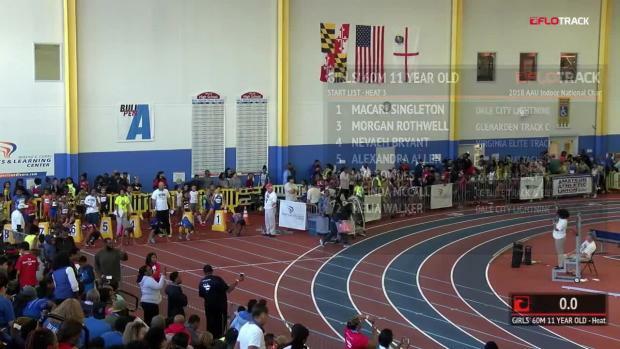 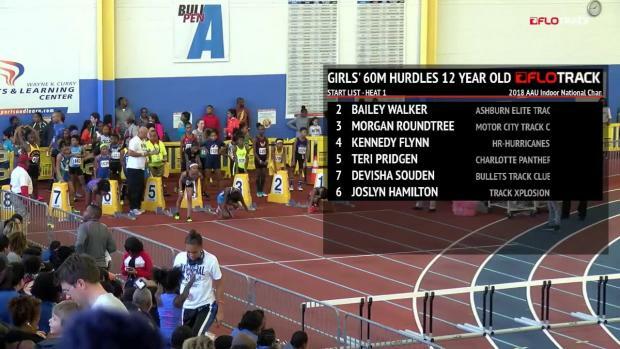 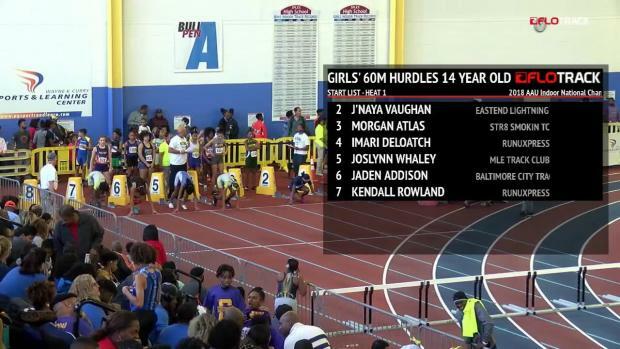 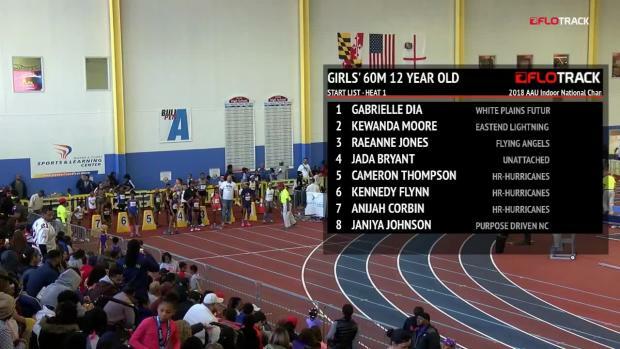 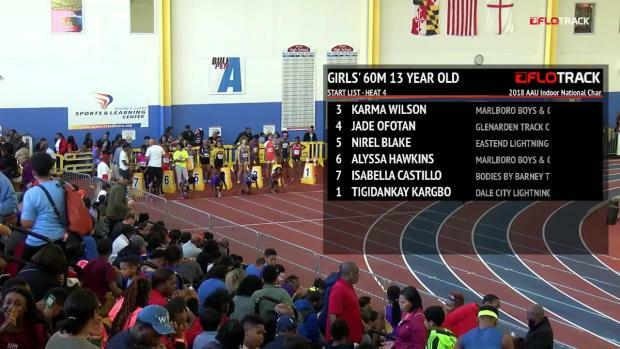 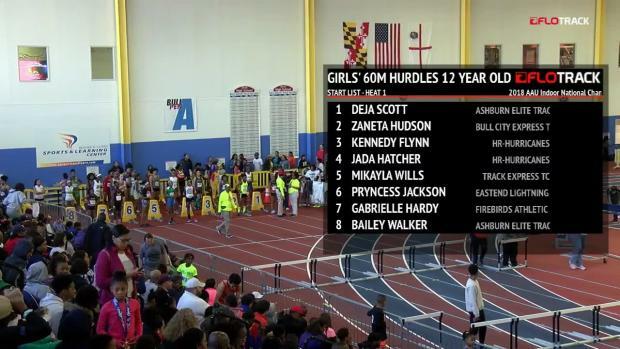 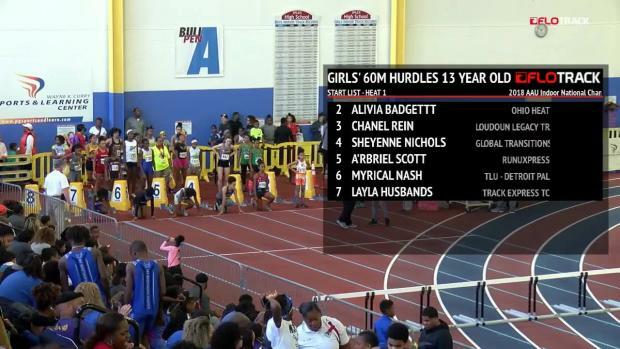 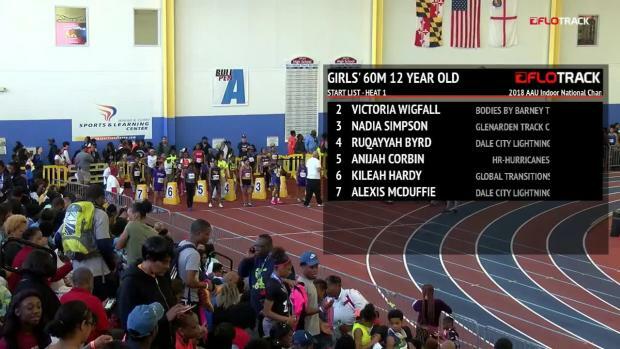 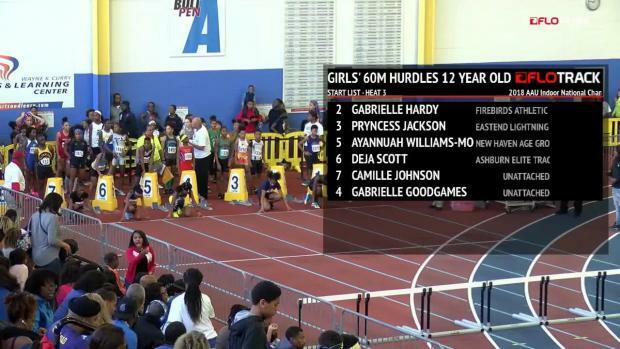 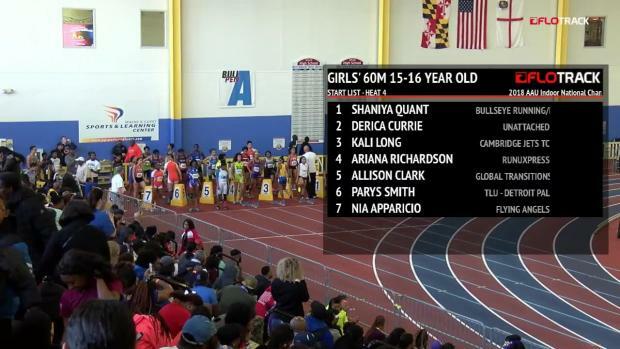 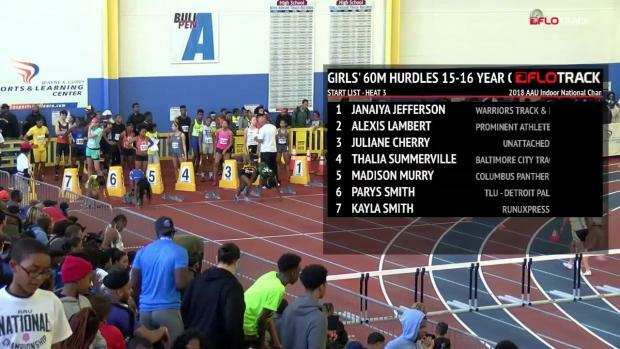 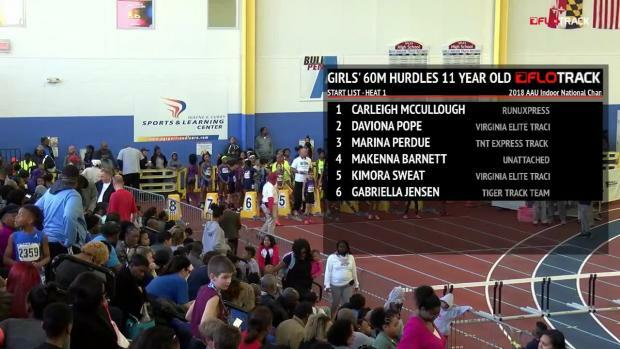 Akala Garrett won yet another national title as she won the 13 year old 60 meter hurdles in 9.12!